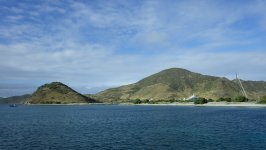 One of the unique features of this island is that it is divided between two nations: the Dutch side - Sint Maarten, and the French side - Saint Martin. 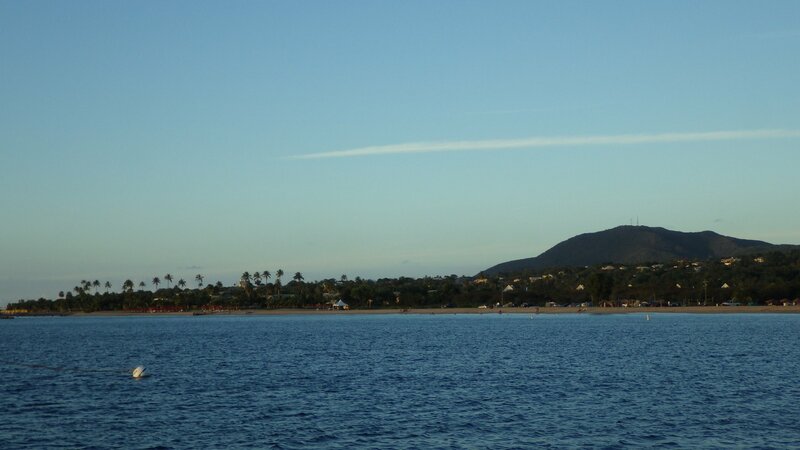 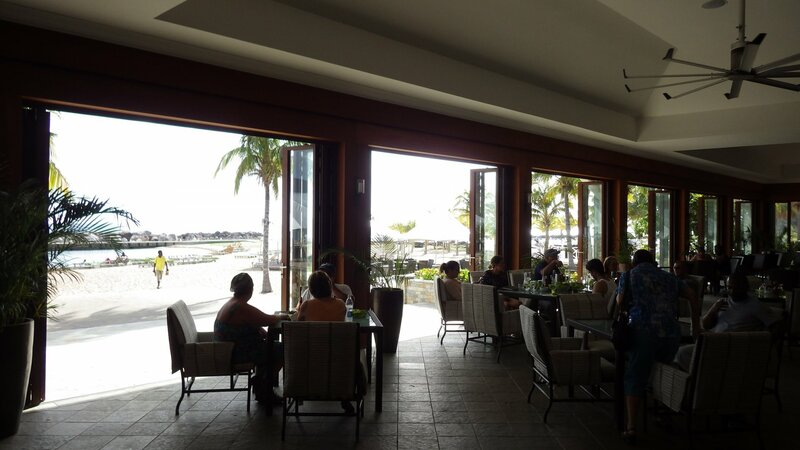 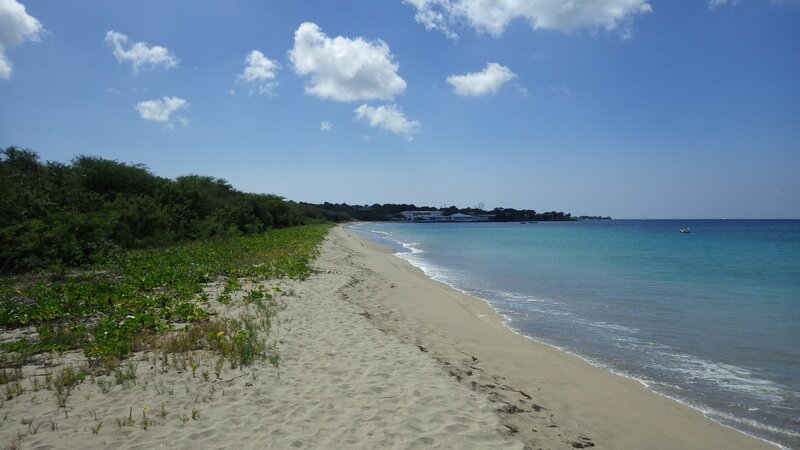 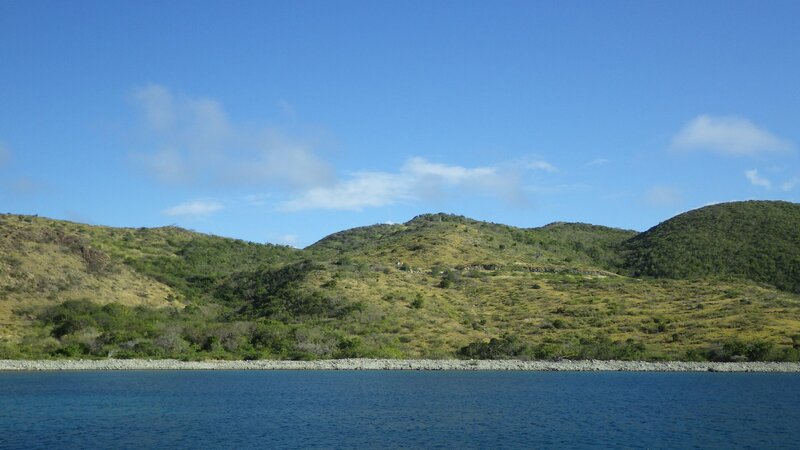 Once cleared in with customs on either side, you can freely travel between two parts of the island. 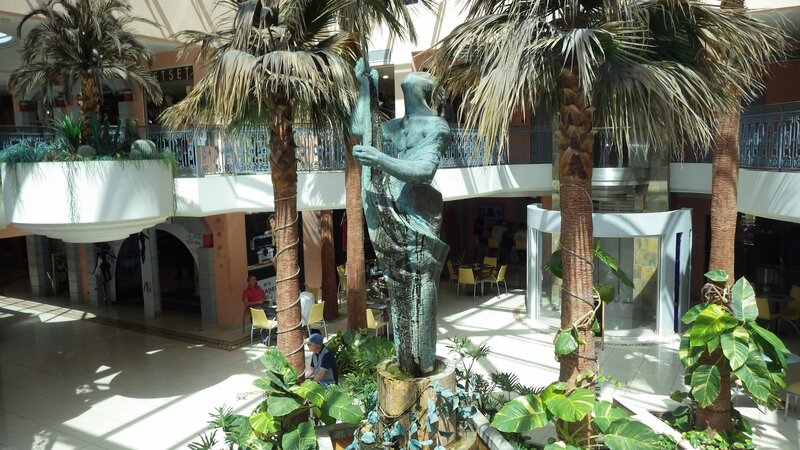 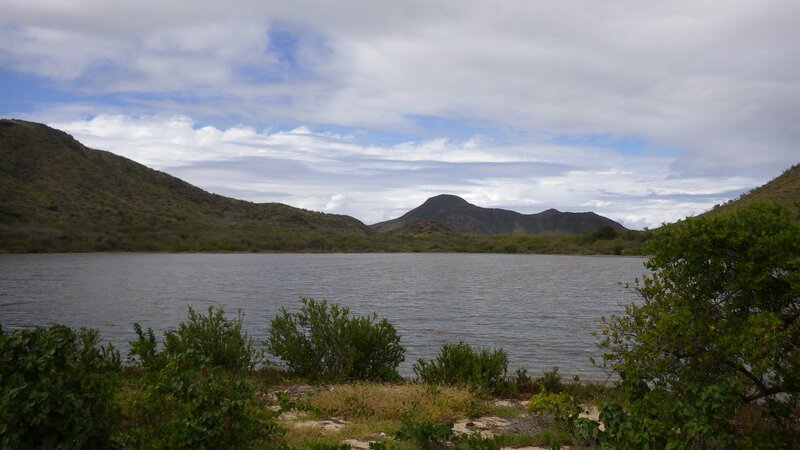 Another feature of the island is that it has a large well protected lagoon inside, also belonging to both nations. 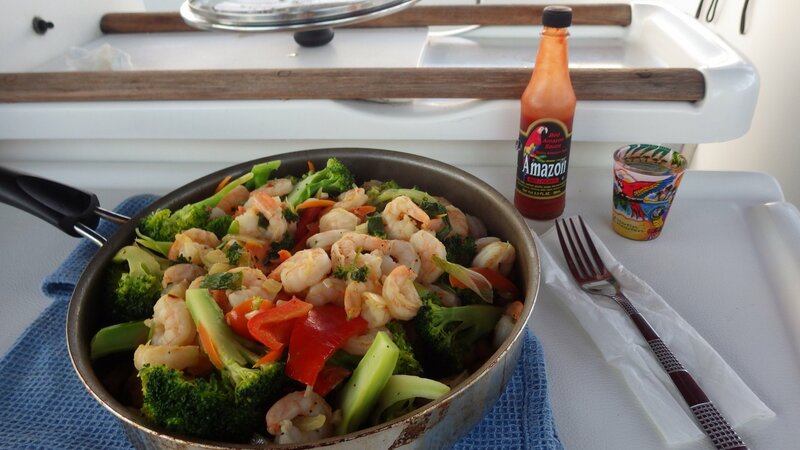 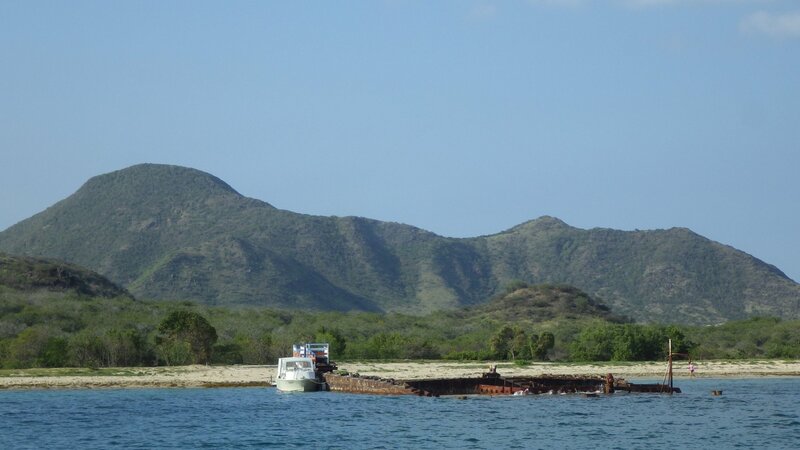 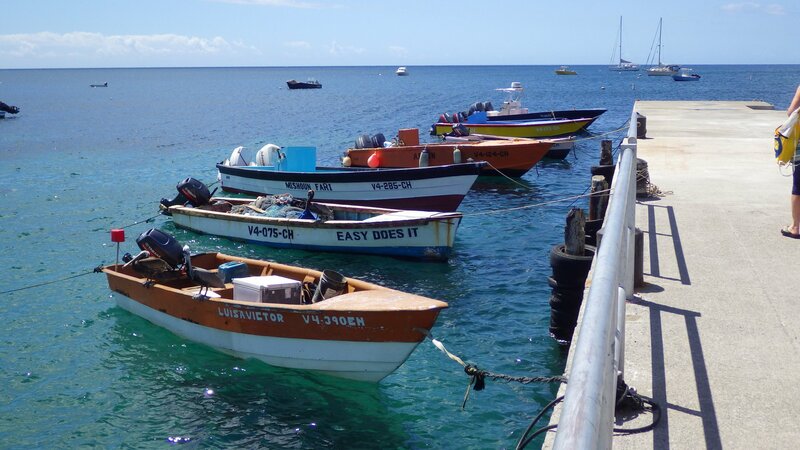 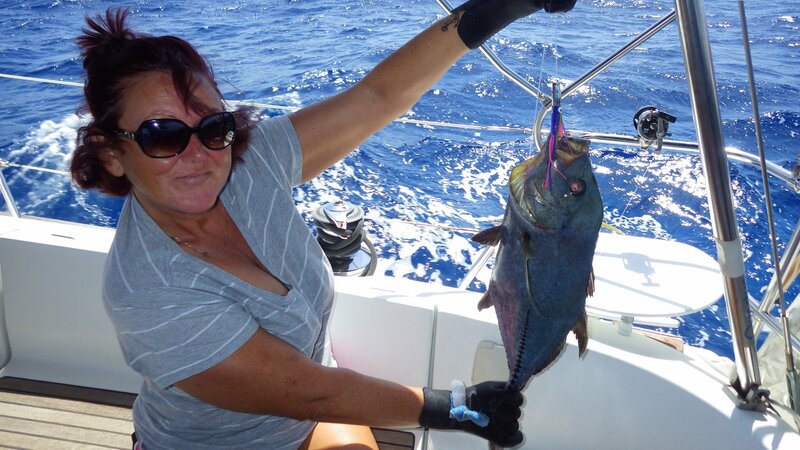 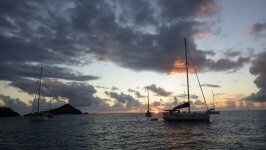 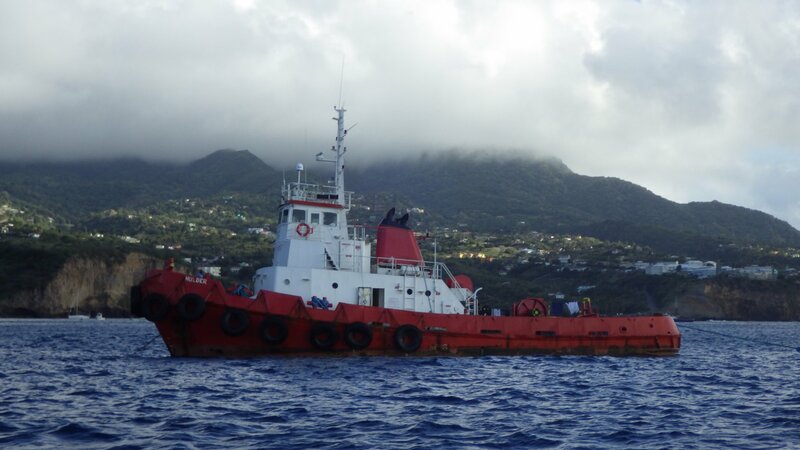 The island has the best marine services in the Caribbean. 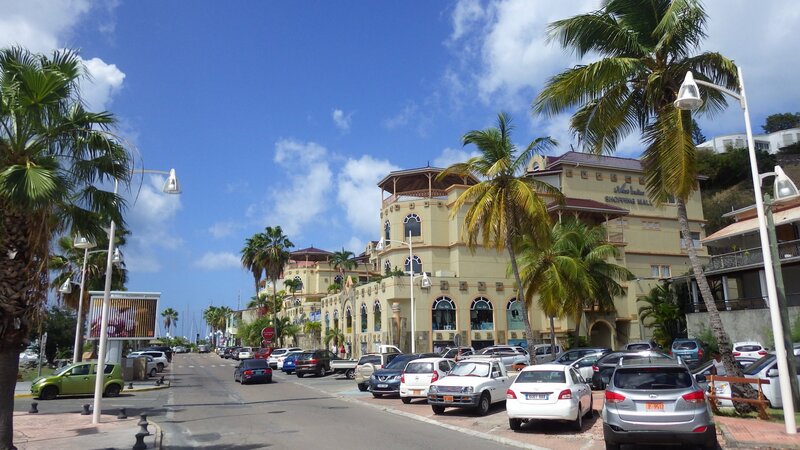 There are many stores and prices are quite reasonable for the region. 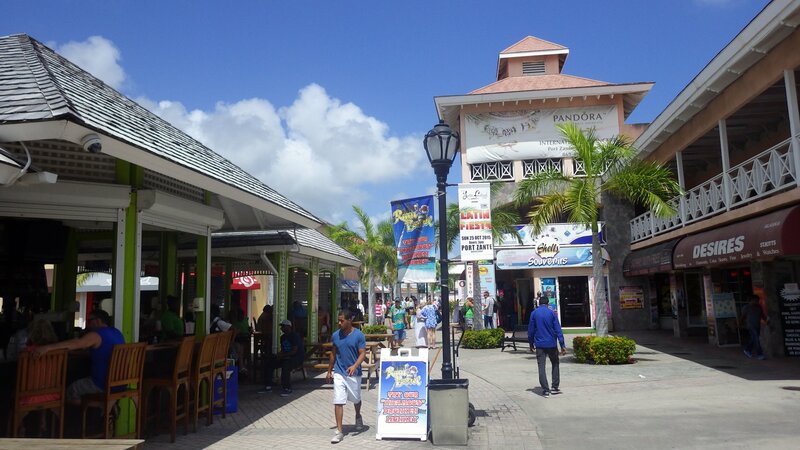 Plenty of restaurants and shops. 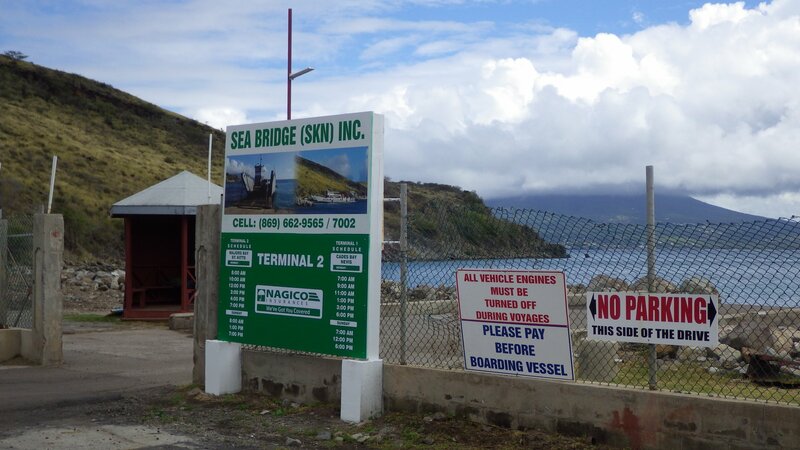 On the down side, you have to pay for using the opening bridges and weekly lagoon fee. 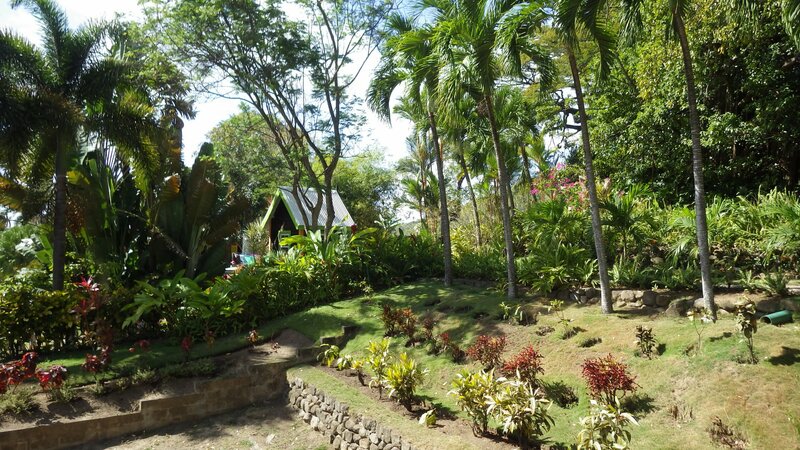 We stayed here for a week. 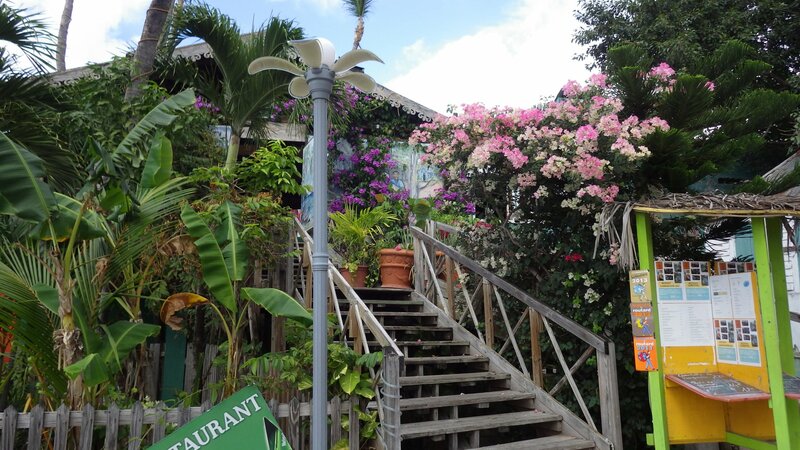 Although the place does not have much character, we liked it. 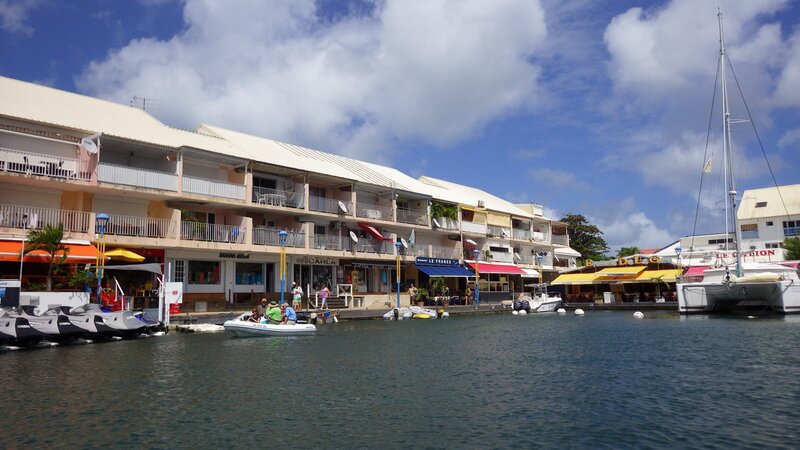 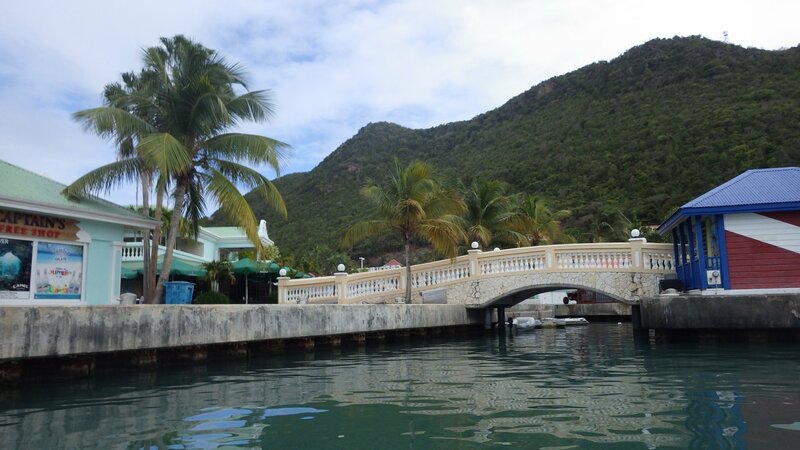 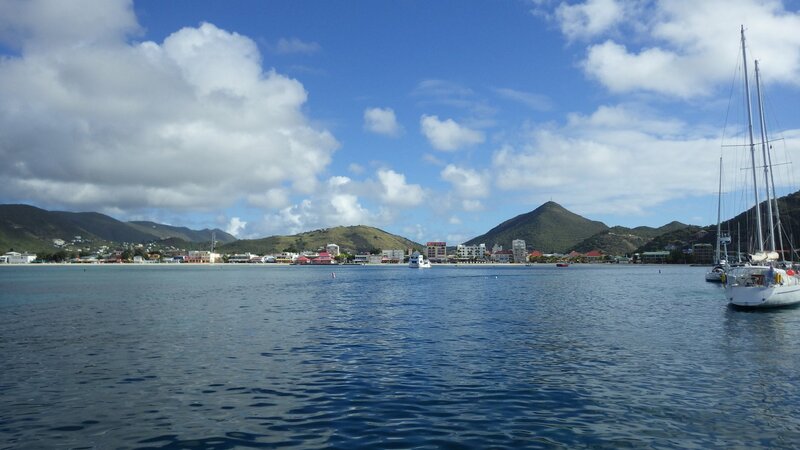 While staying on the St. Maarten Island, we took a dinghy trip across the Lagoon to the town of Marigot on the French side. 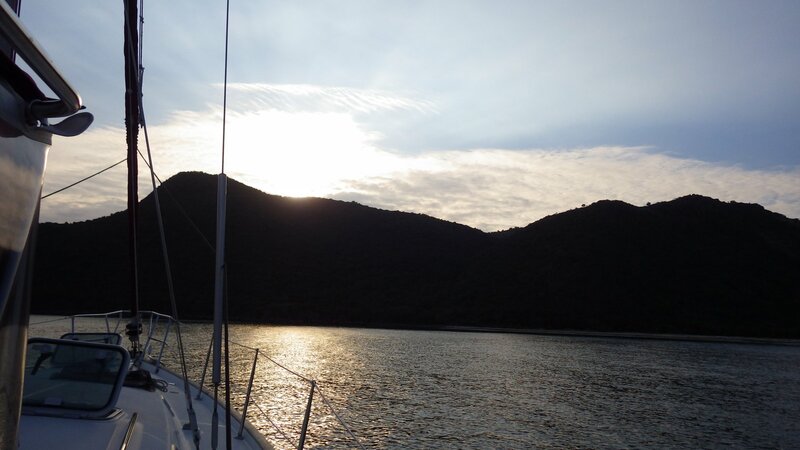 It was a pleasant trip. 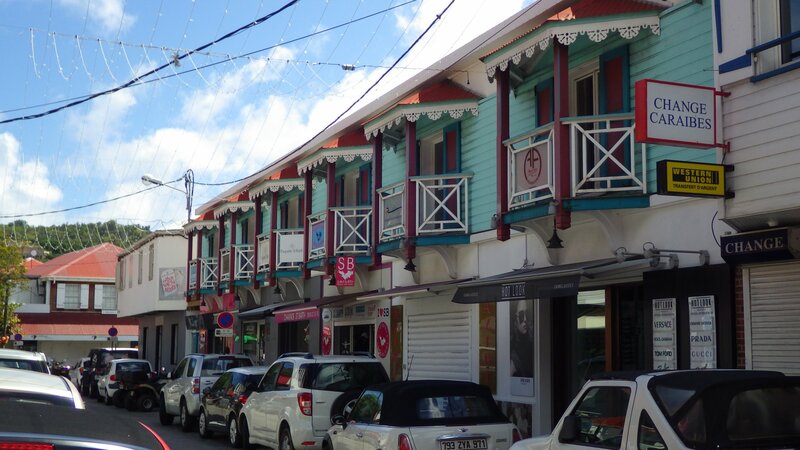 The town has a definite French character and reminded me of Paris. 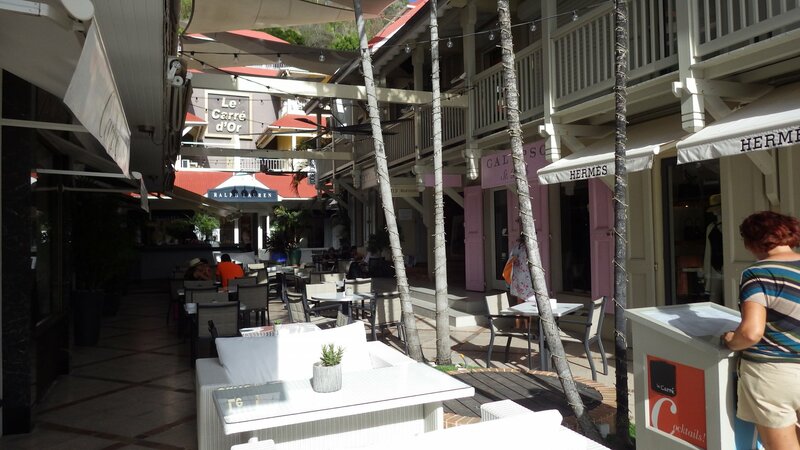 French architecture and language, small boutique stores, inviting restaurants at the shore, vendor markets, etc. 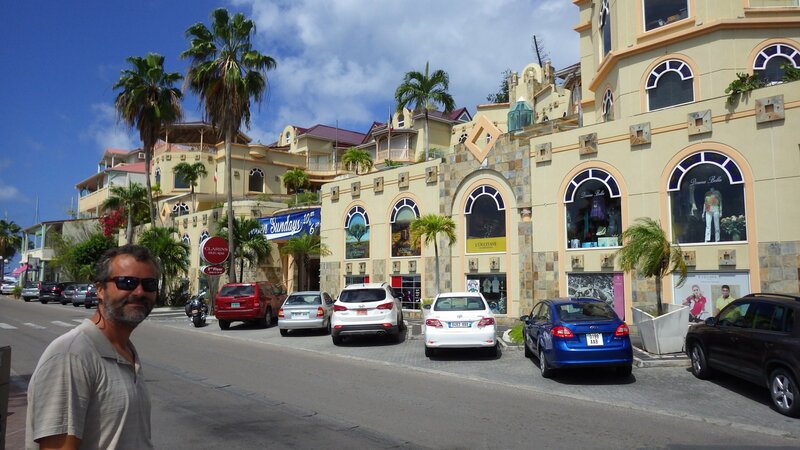 Stores have European items not normally found in North America. 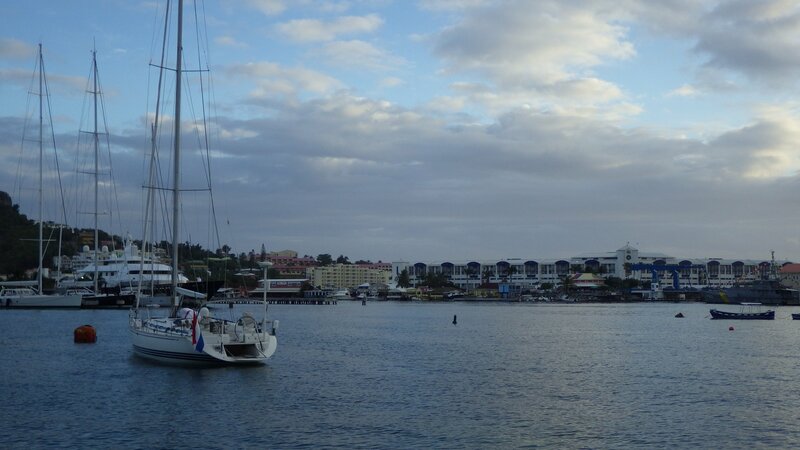 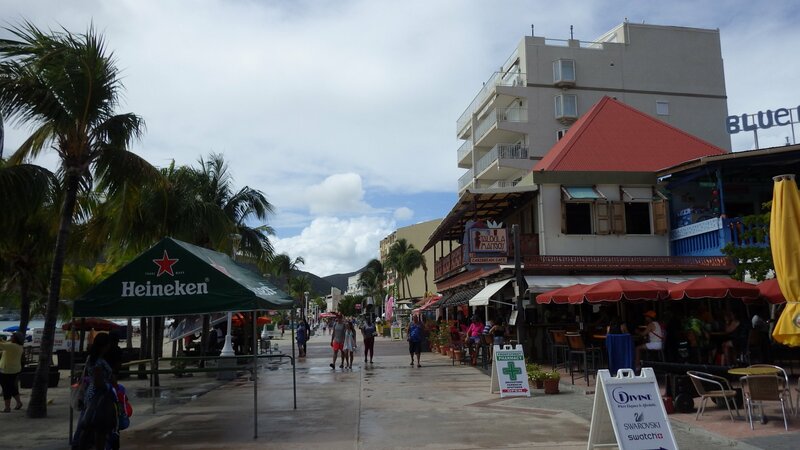 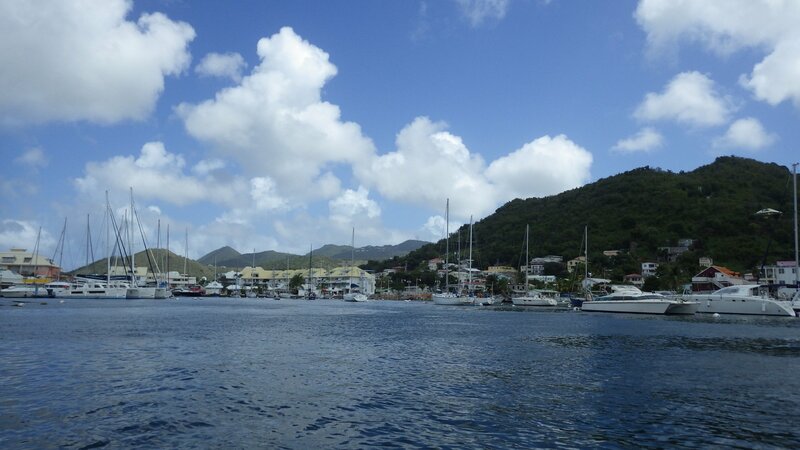 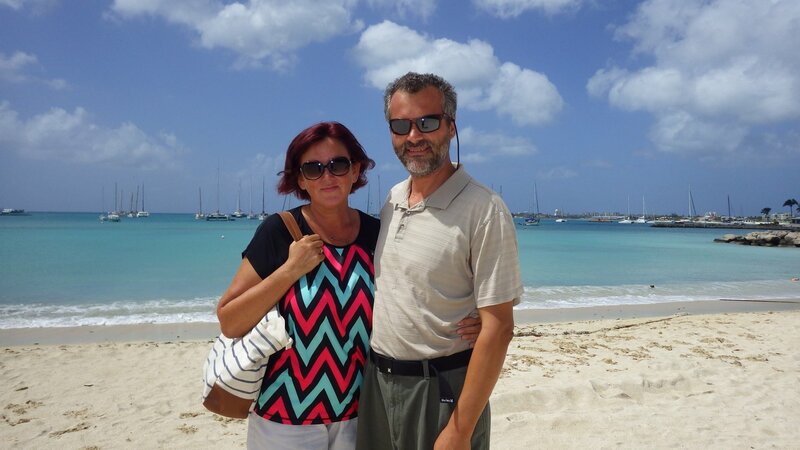 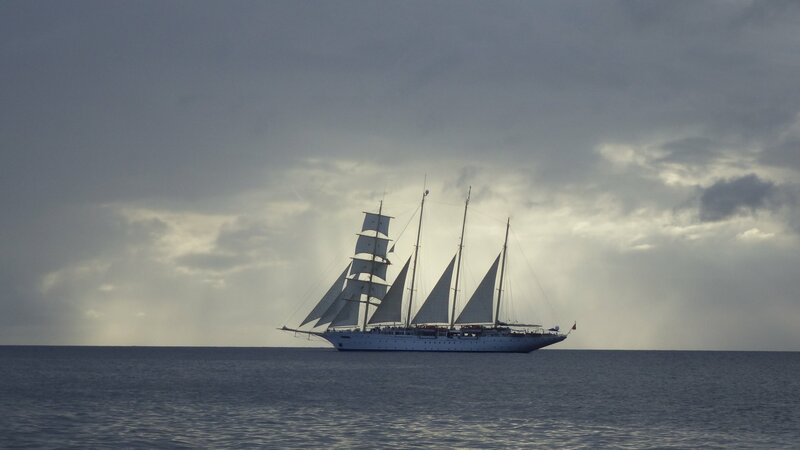 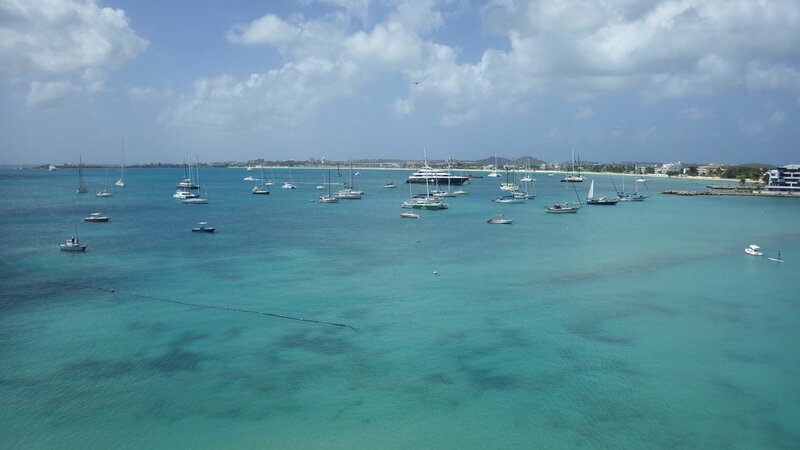 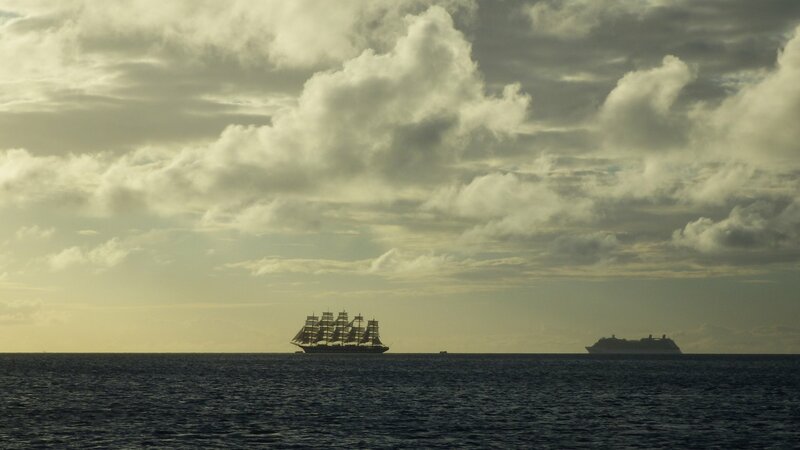 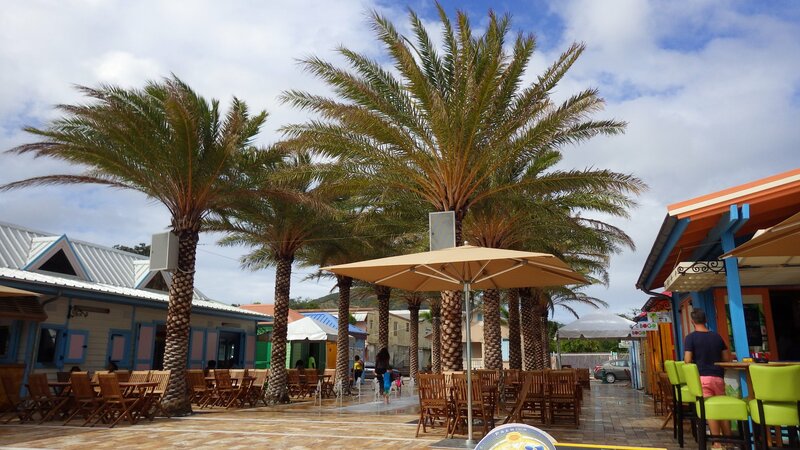 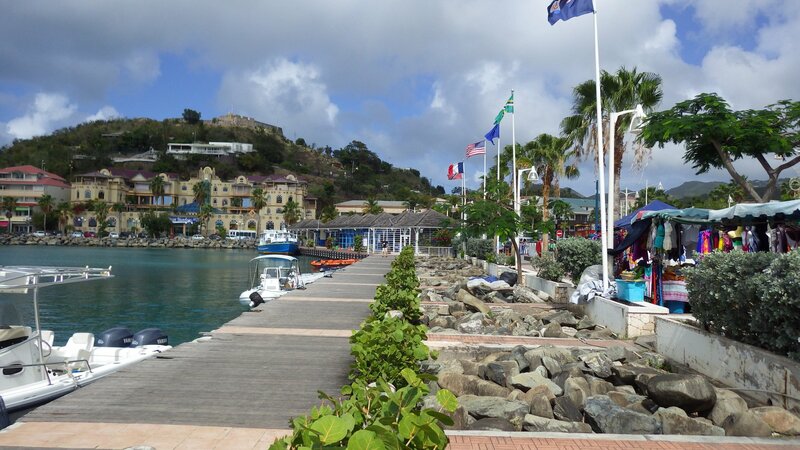 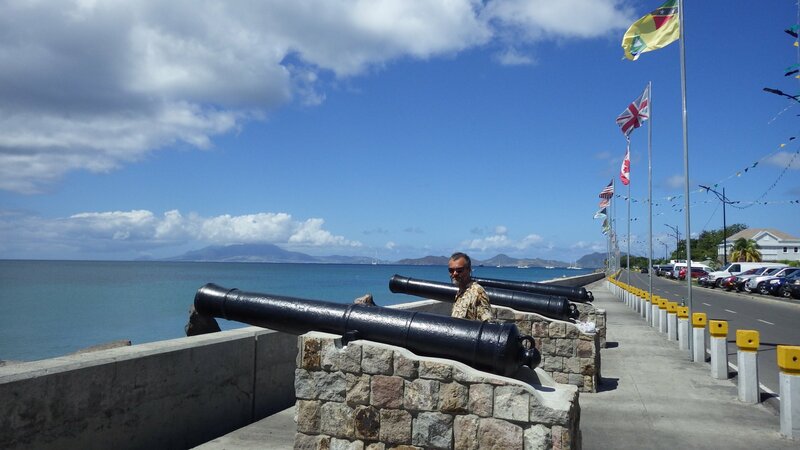 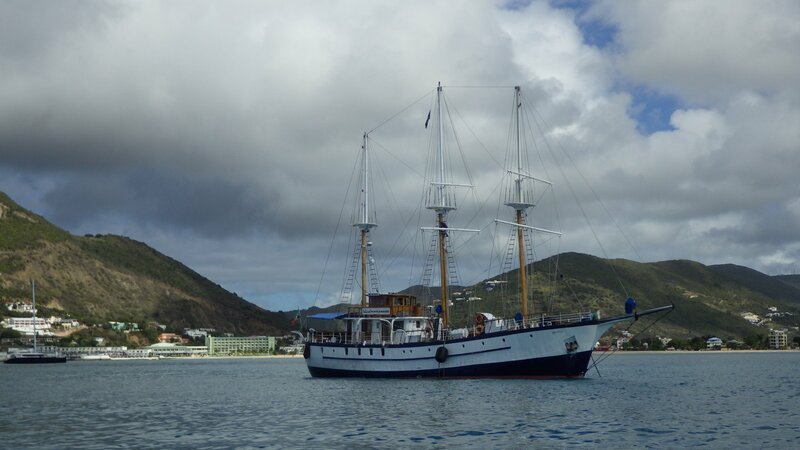 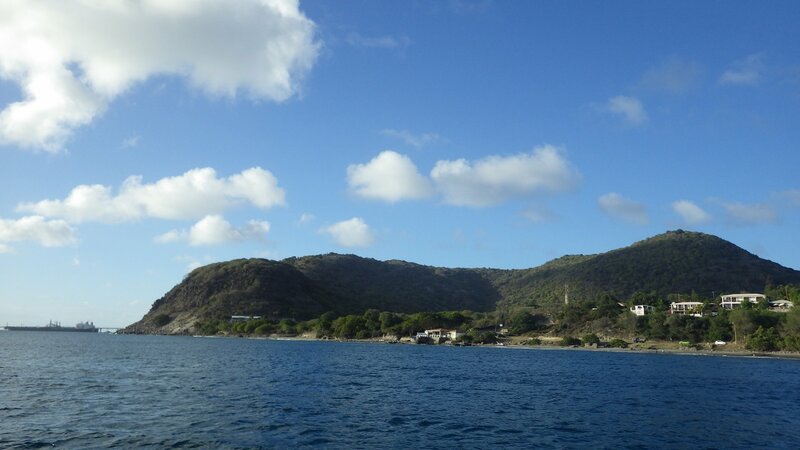 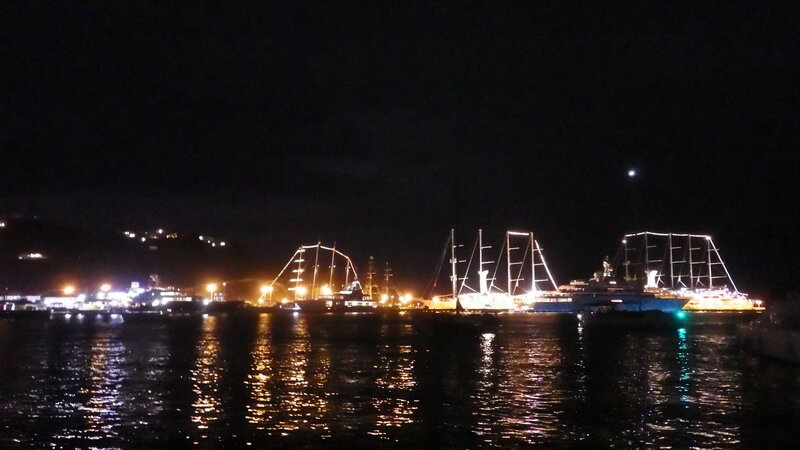 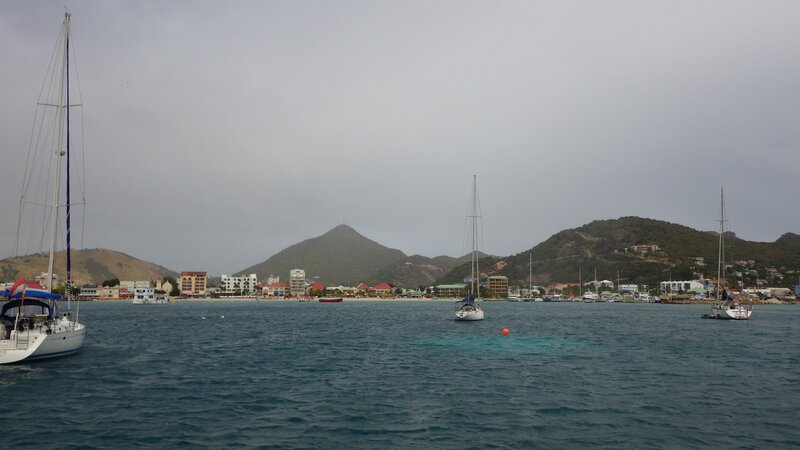 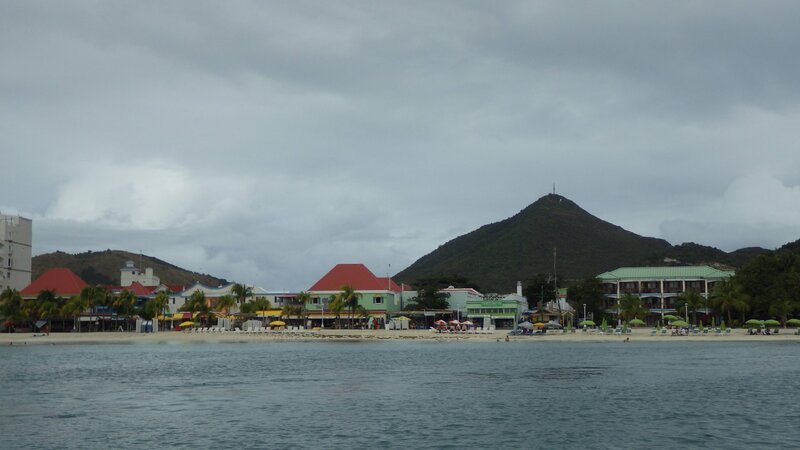 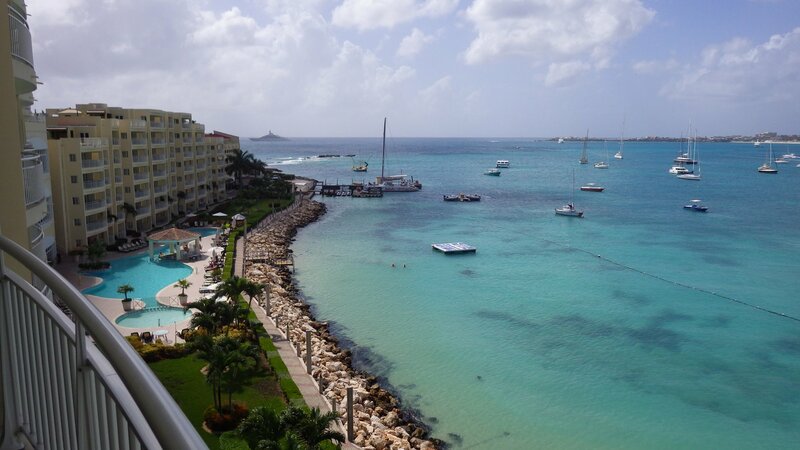 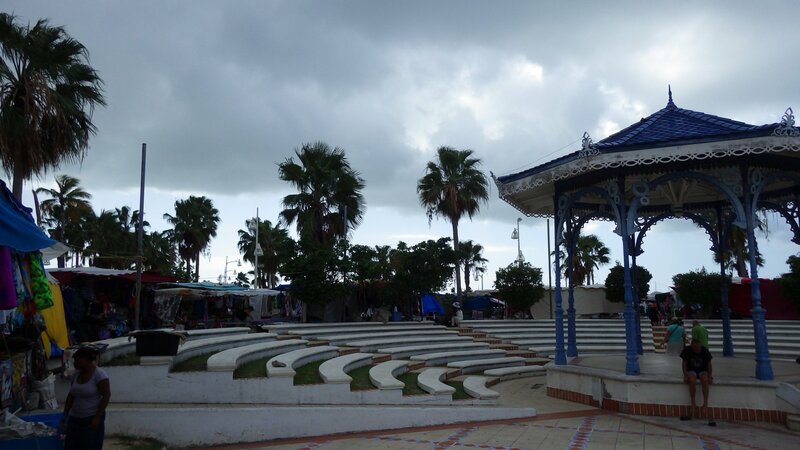 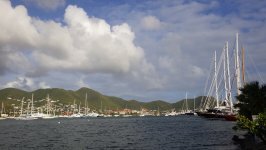 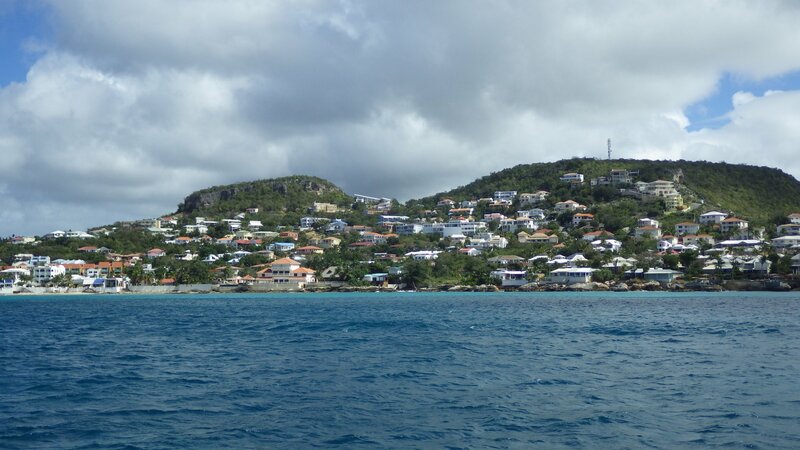 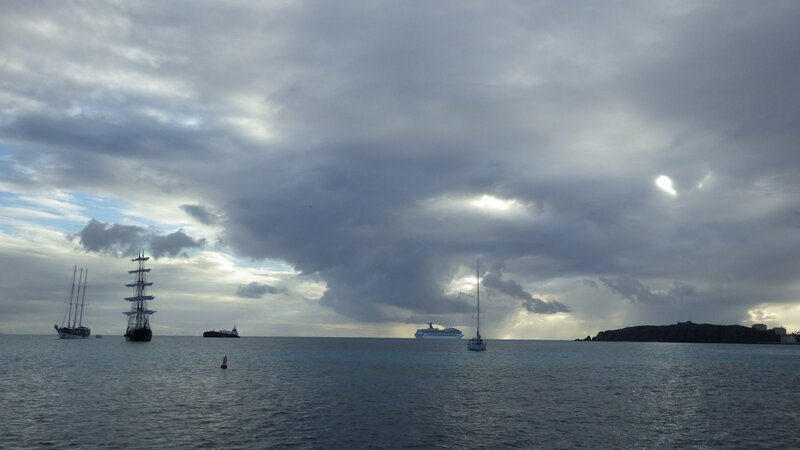 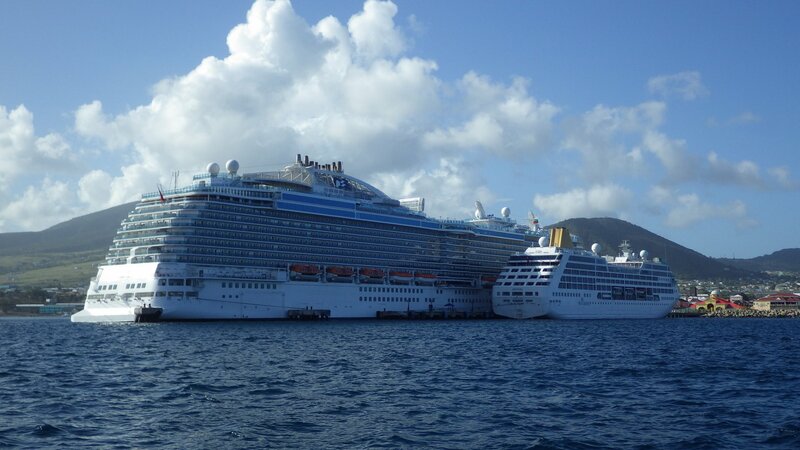 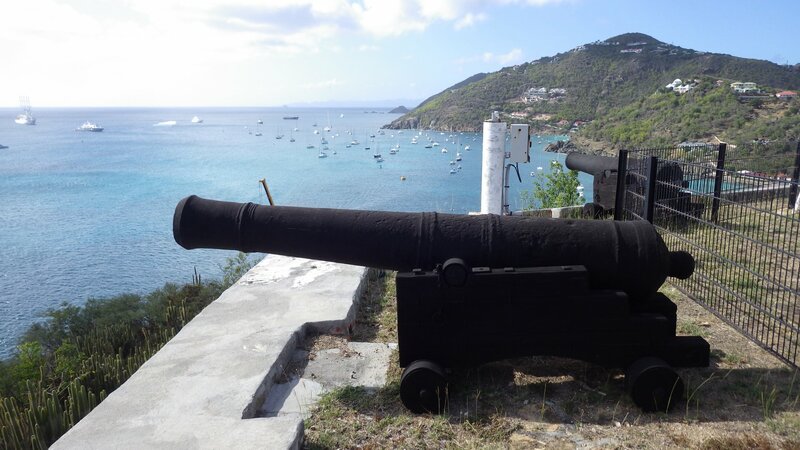 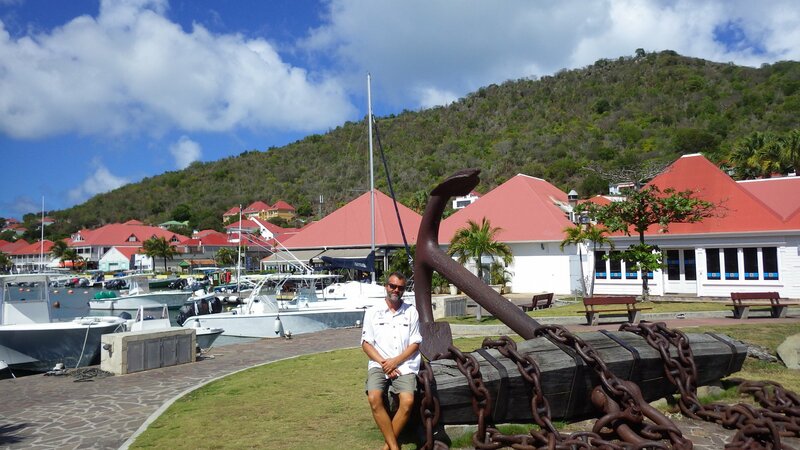 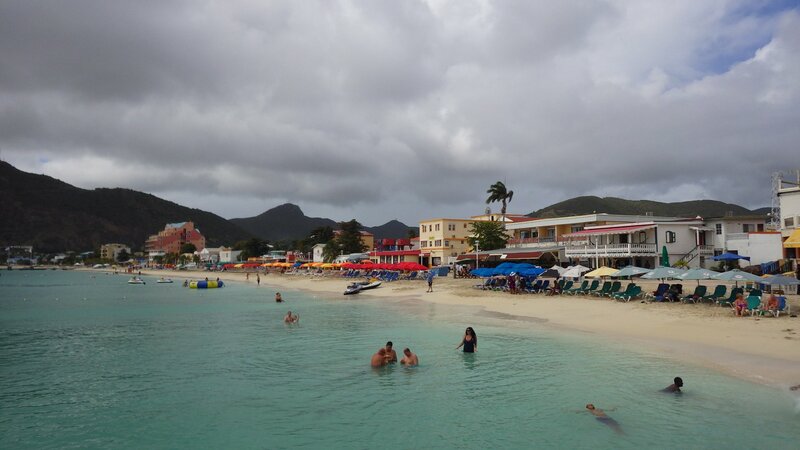 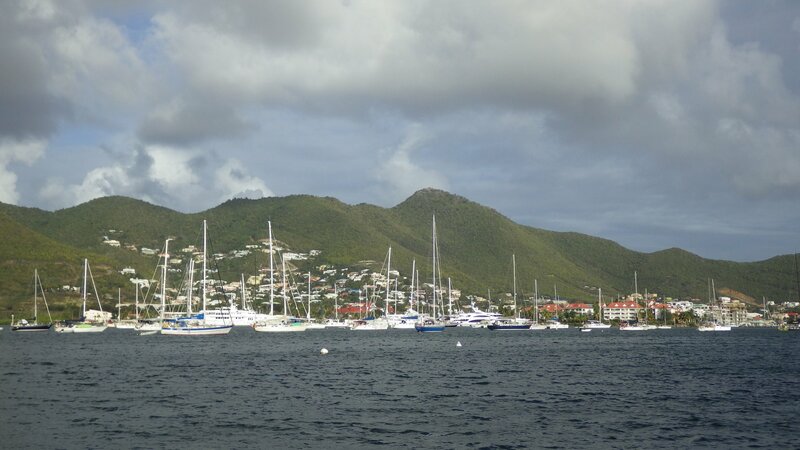 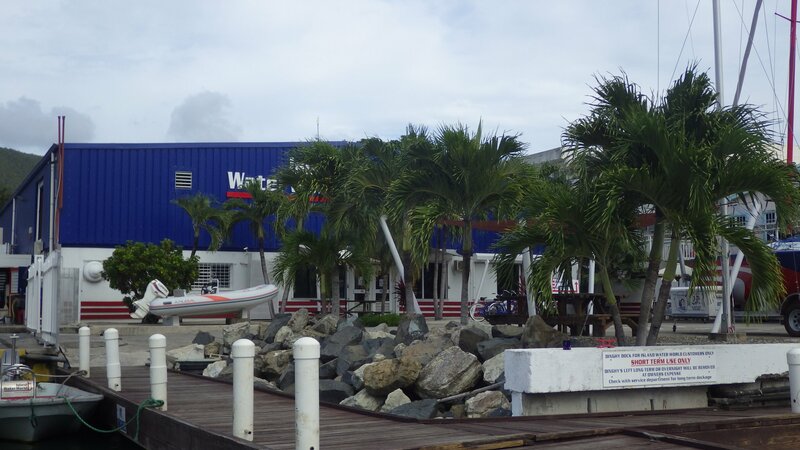 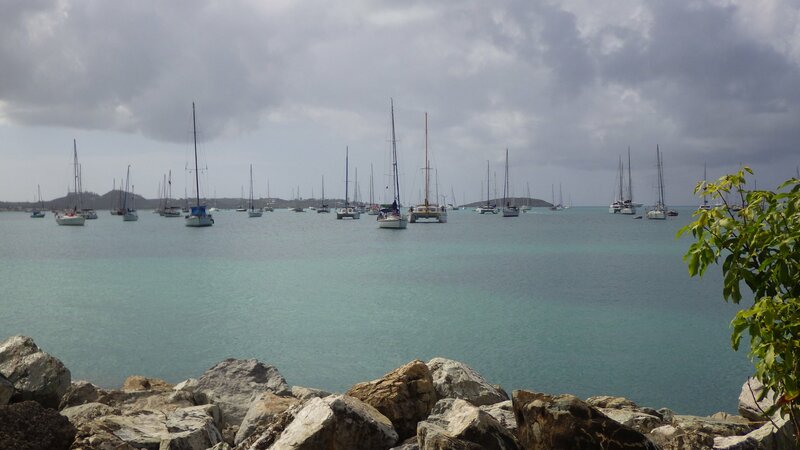 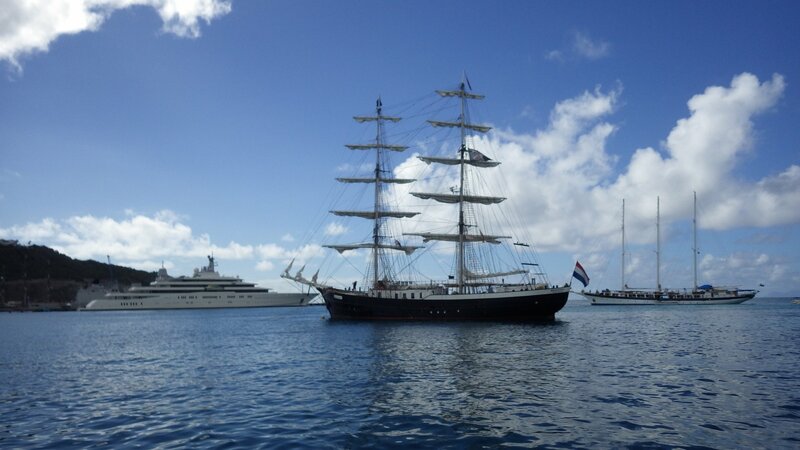 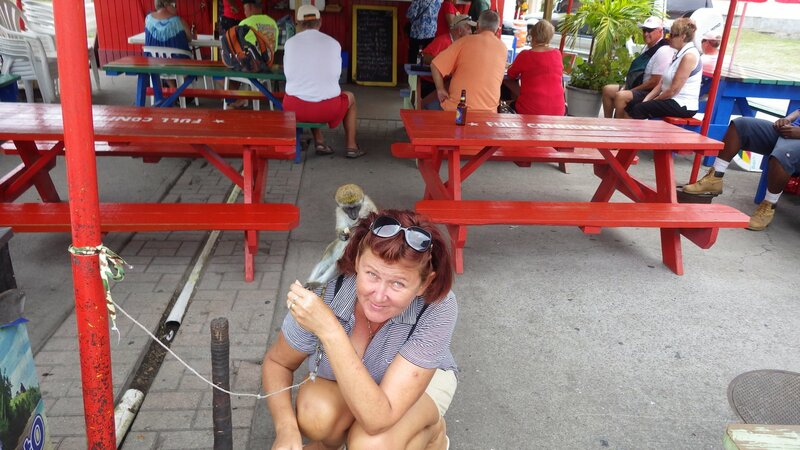 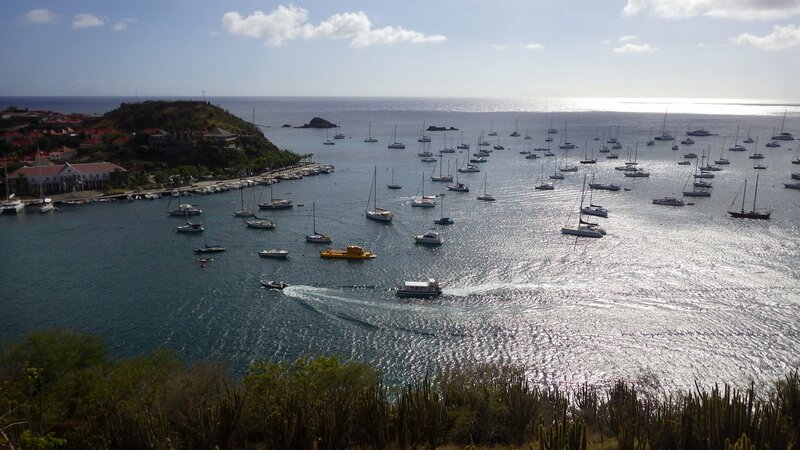 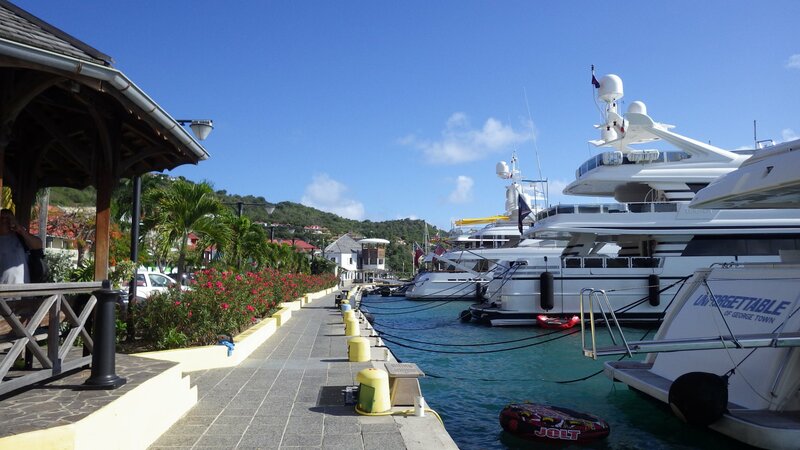 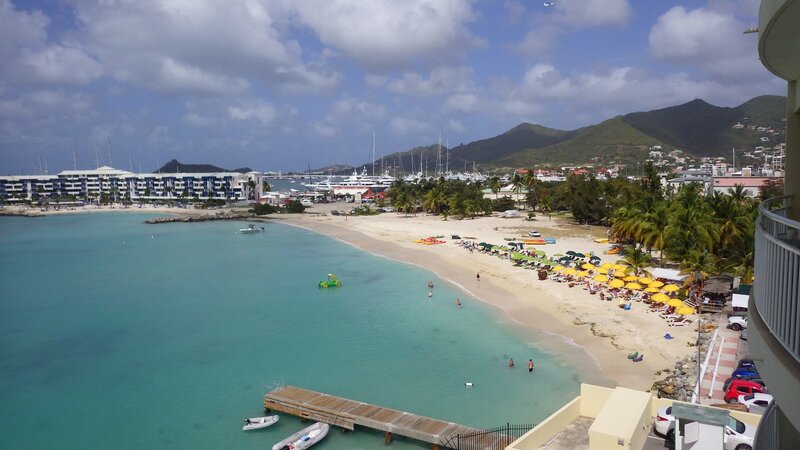 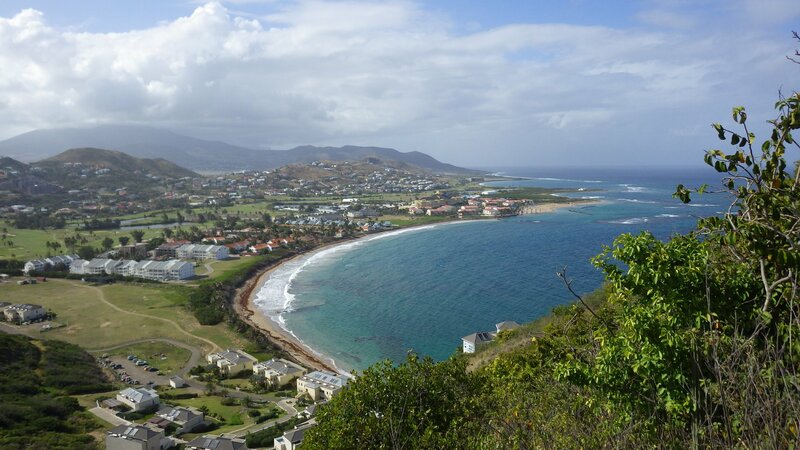 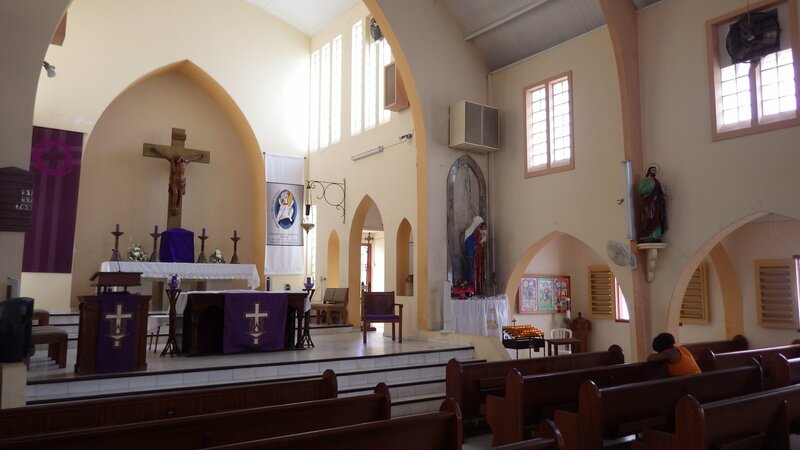 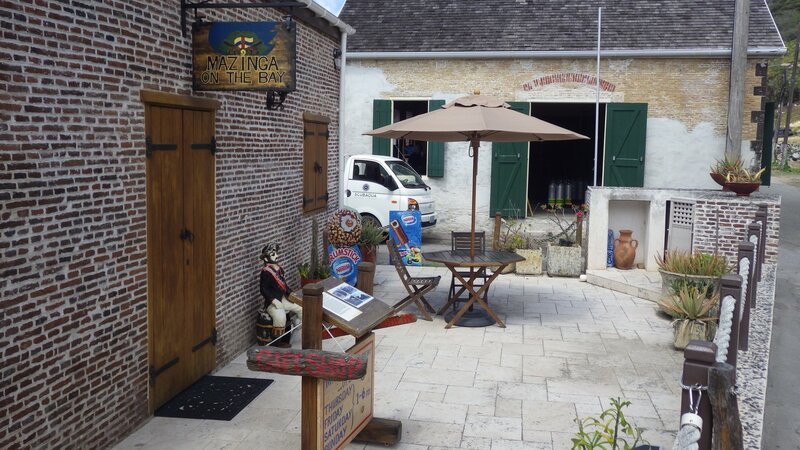 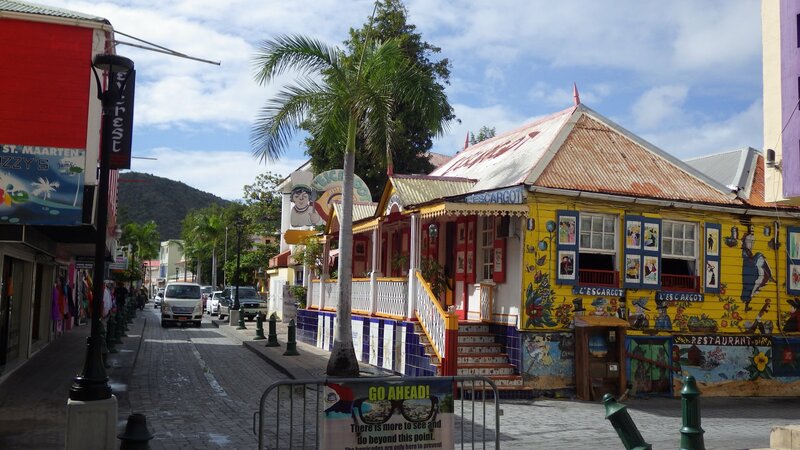 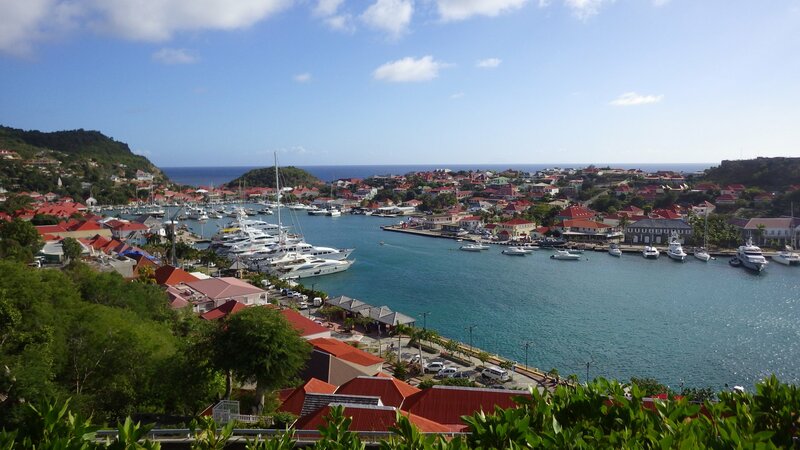 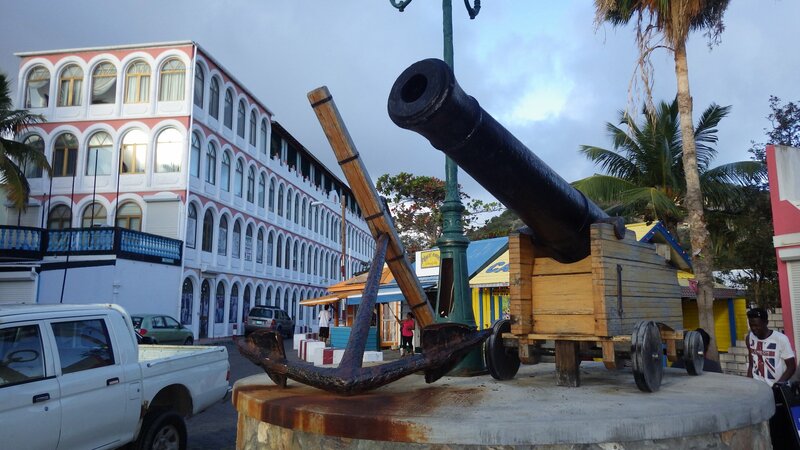 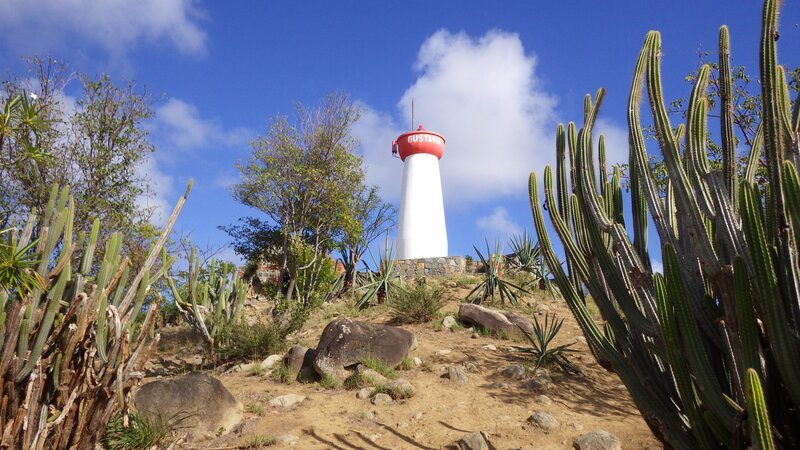 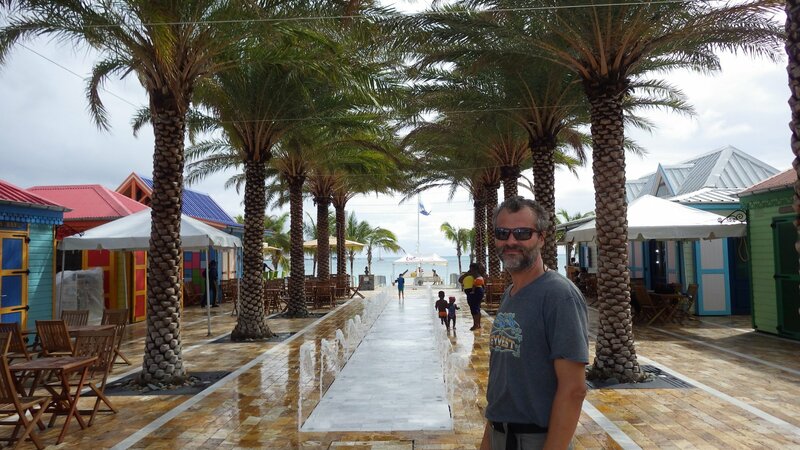 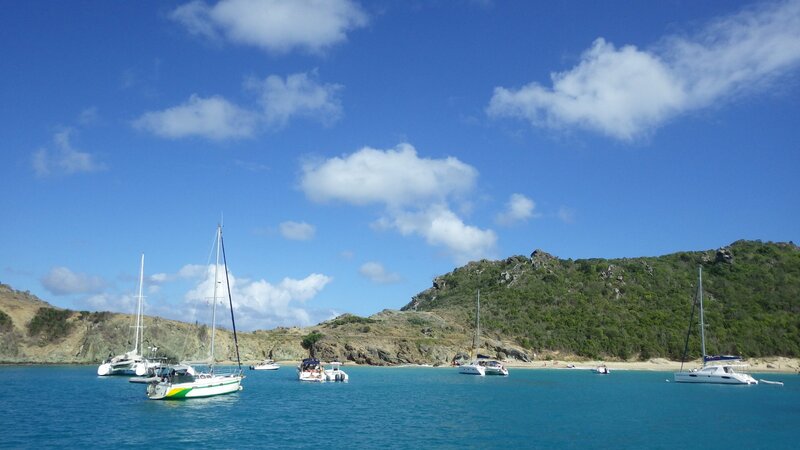 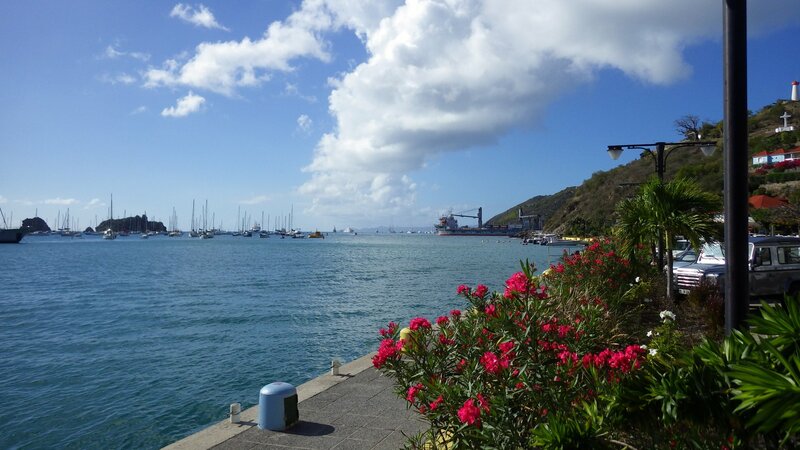 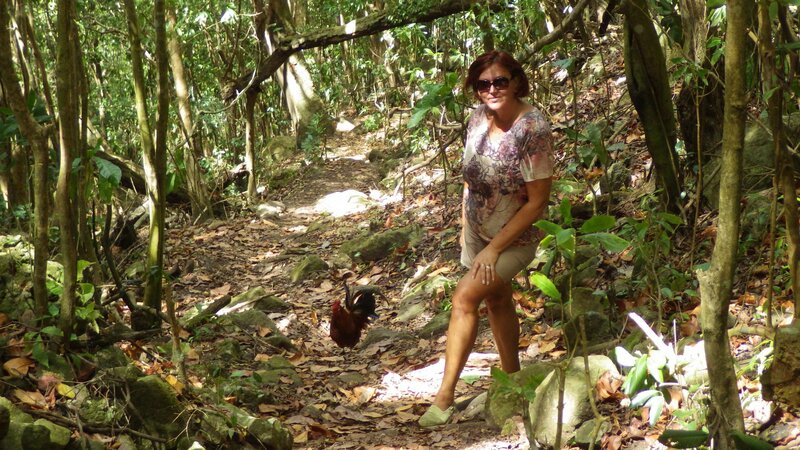 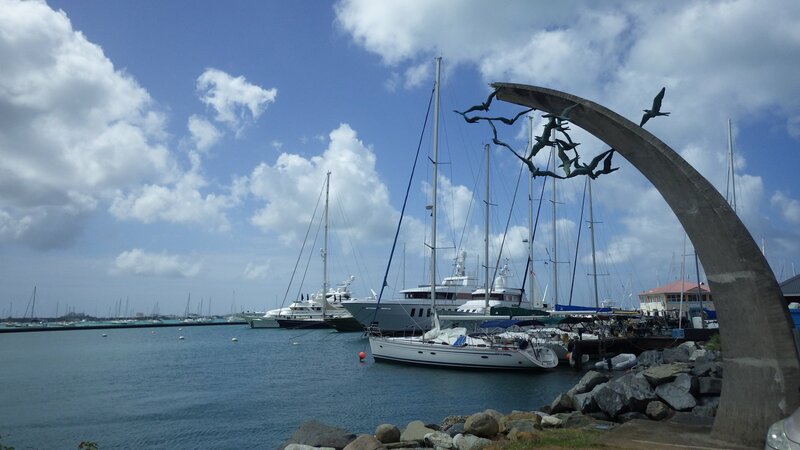 We anchored for a day at Philipsburg, the capital of the Dutch Sint Maarten Island. 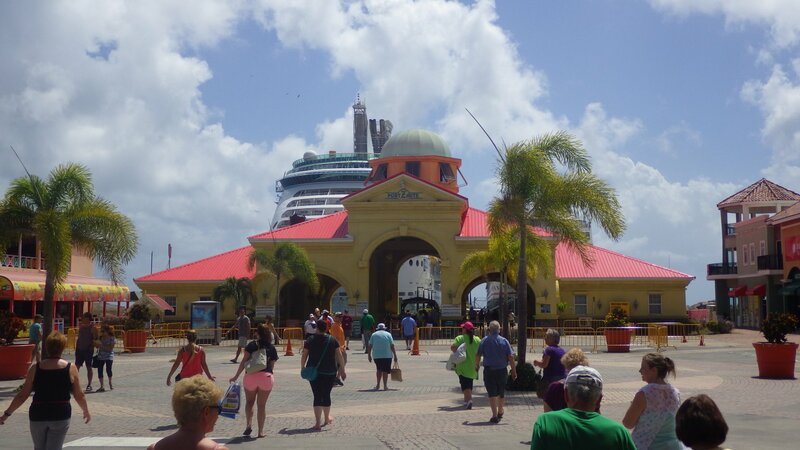 The town has a cruiseship dock and its services are geared toward their one-day tourist crowd. 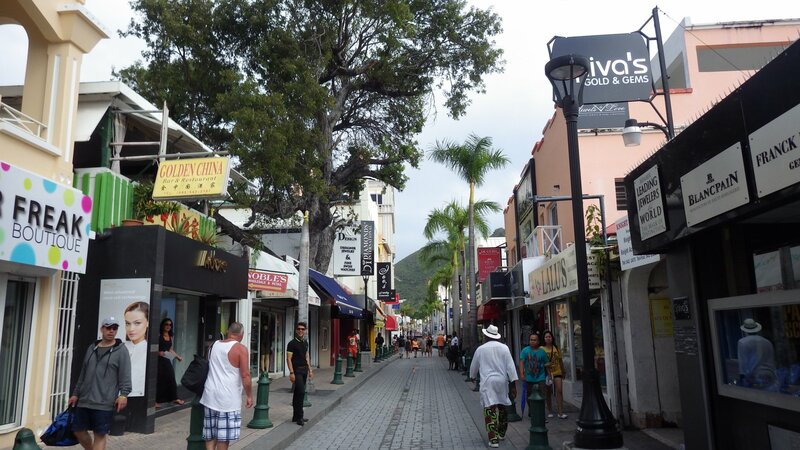 Pleasant walkway at the shore, live music, streets with lots of tourist type shops. 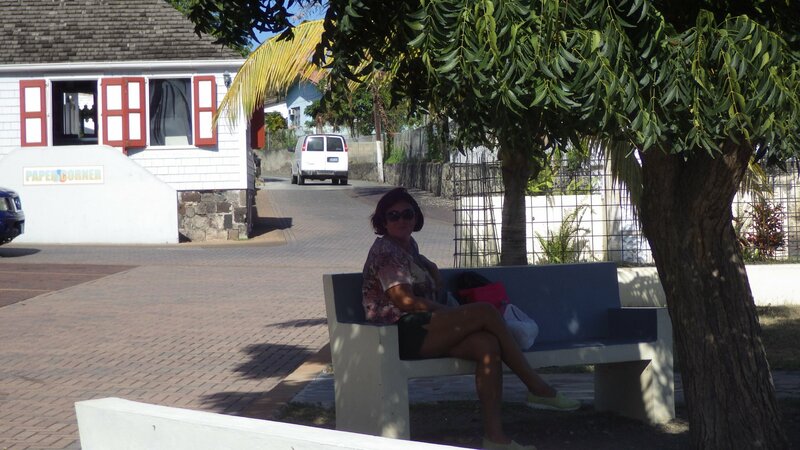 Although we didn't have a chance to visit other parts of the town. 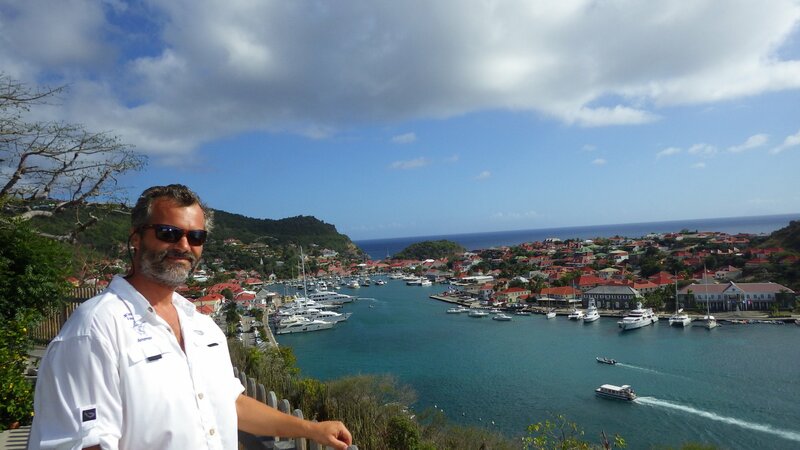 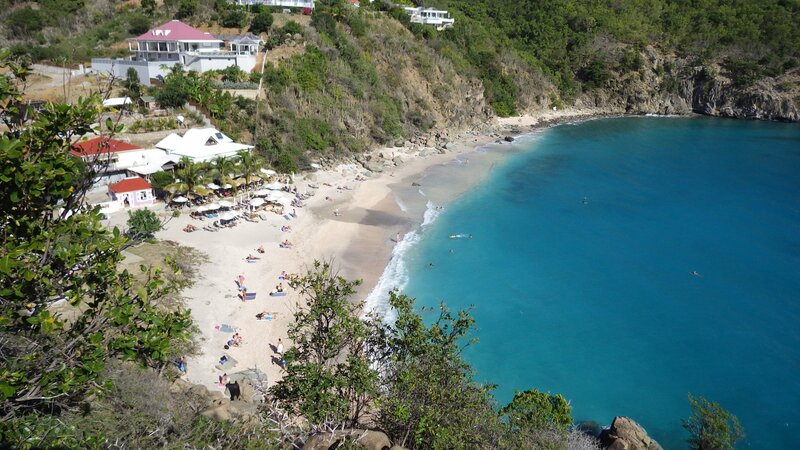 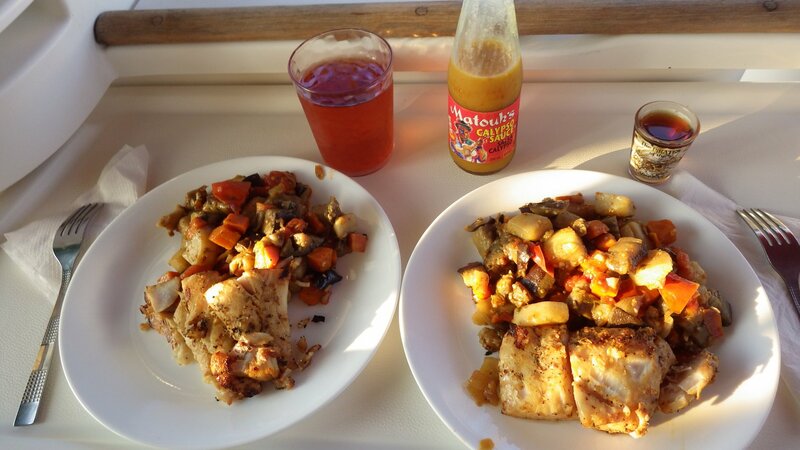 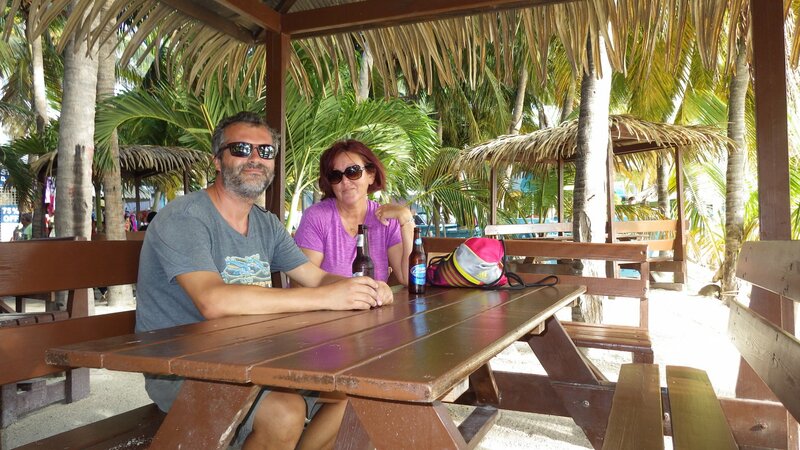 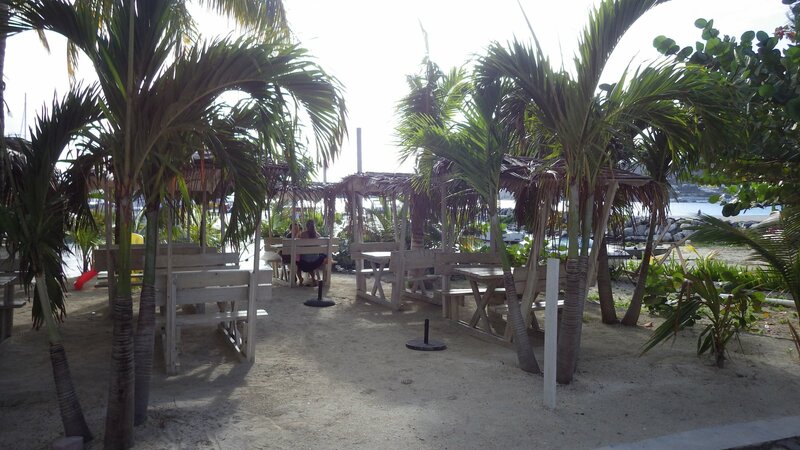 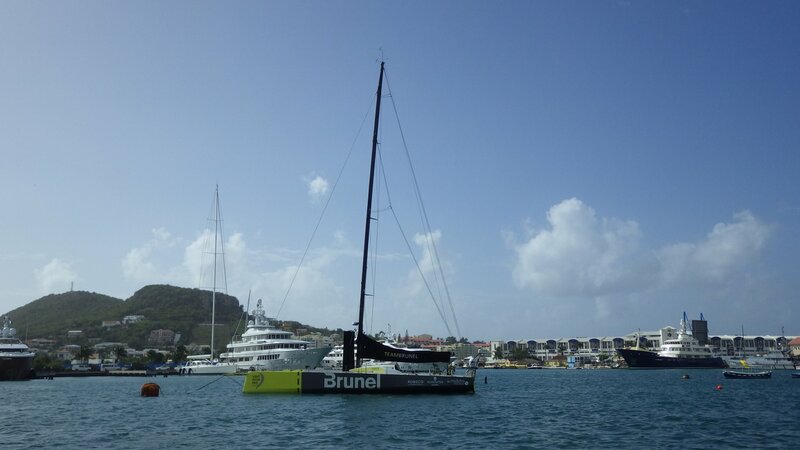 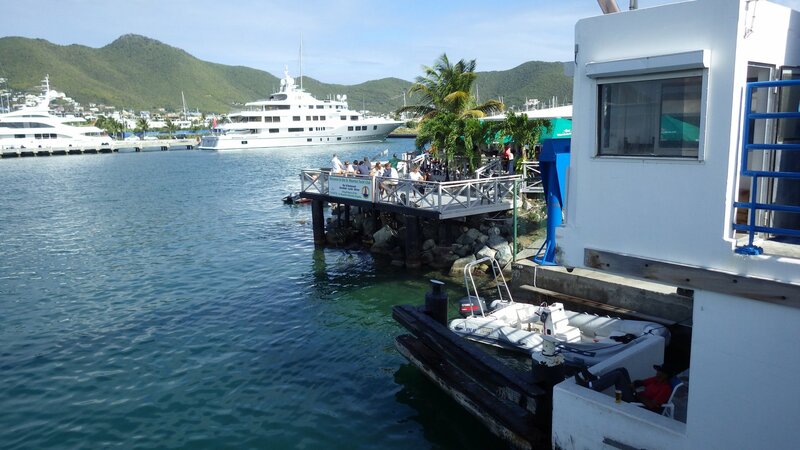 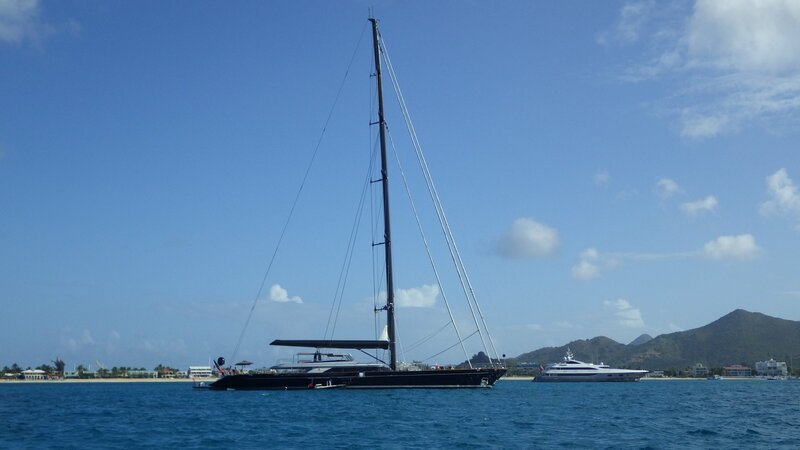 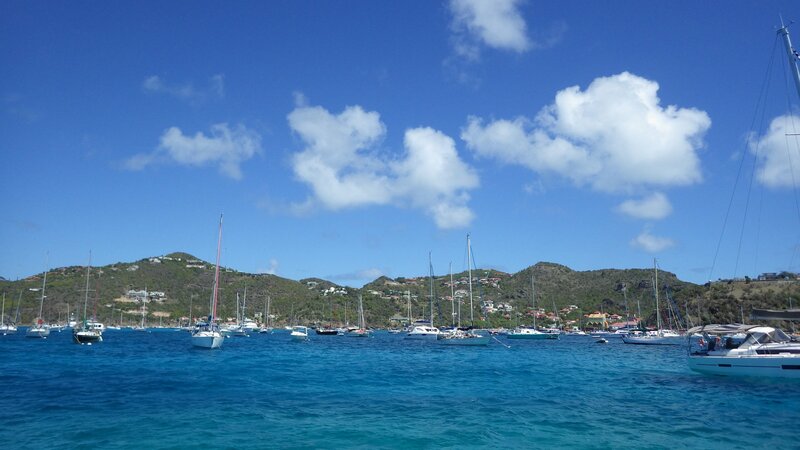 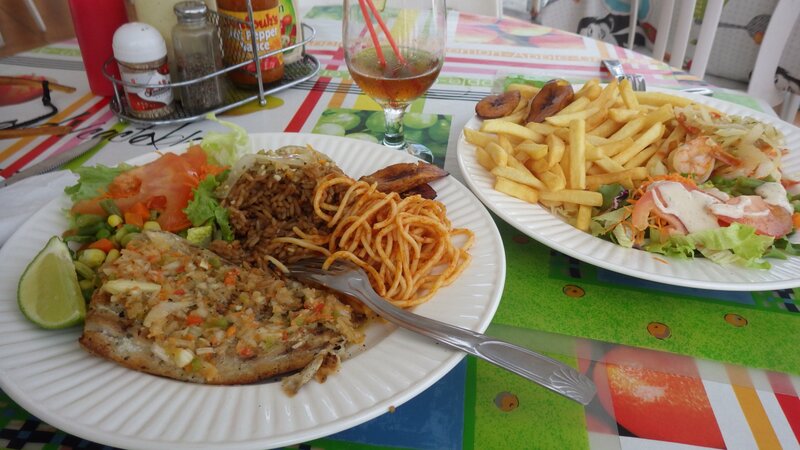 This was a short stopover for lunch on our way from Sint Maarten to St. Barths Island. 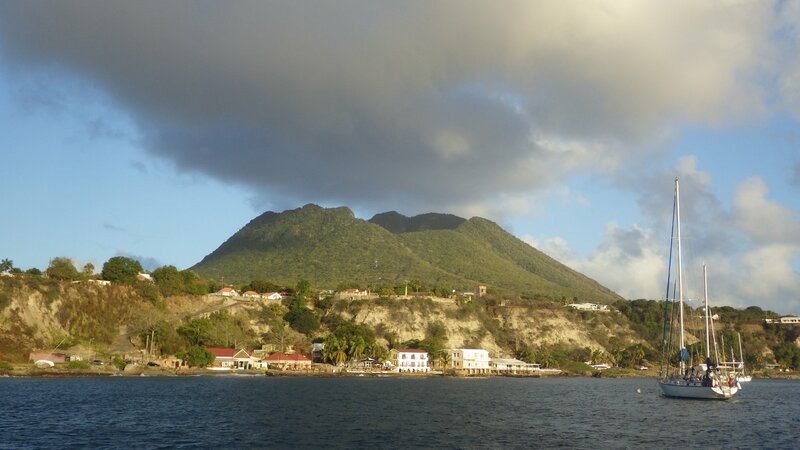 The small hilly island Ile Fourchue was once inhabited by goats. 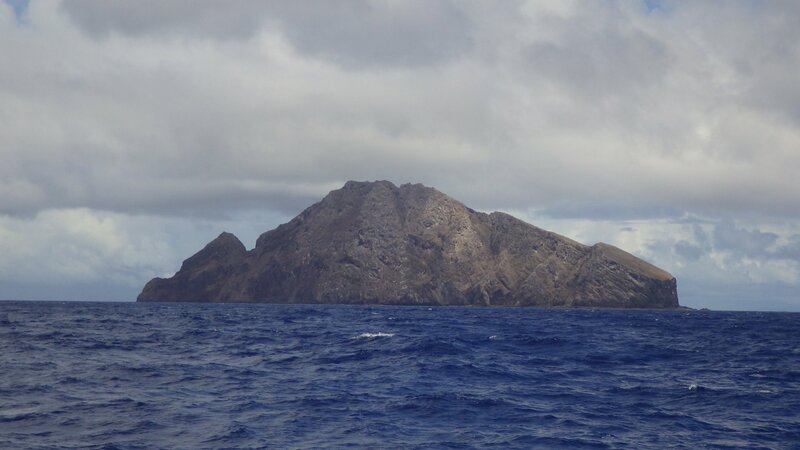 Introduced to the island and left along, they multiplied without control and eventually ate all vegetation, leaving bare mountains. 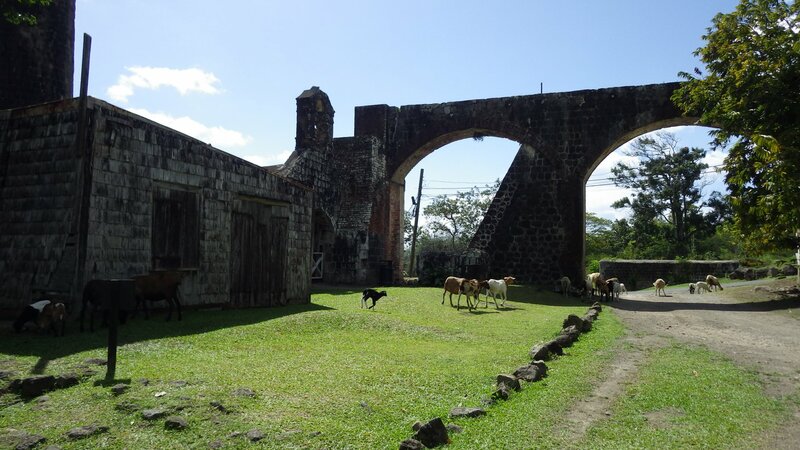 Consequently, the goat population collapsed. 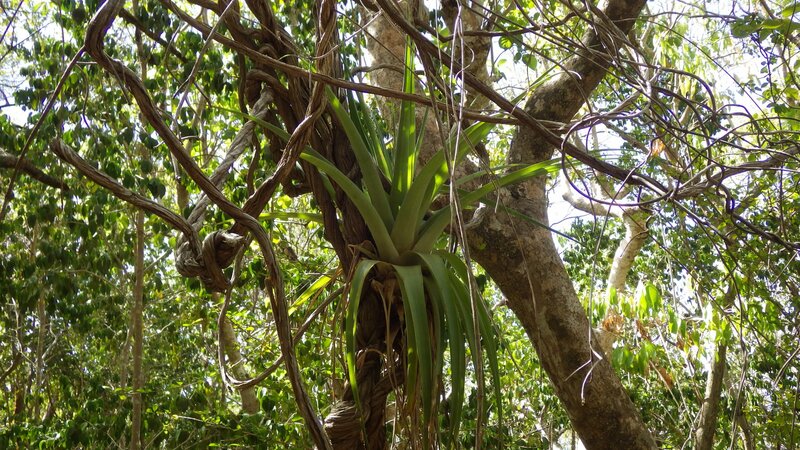 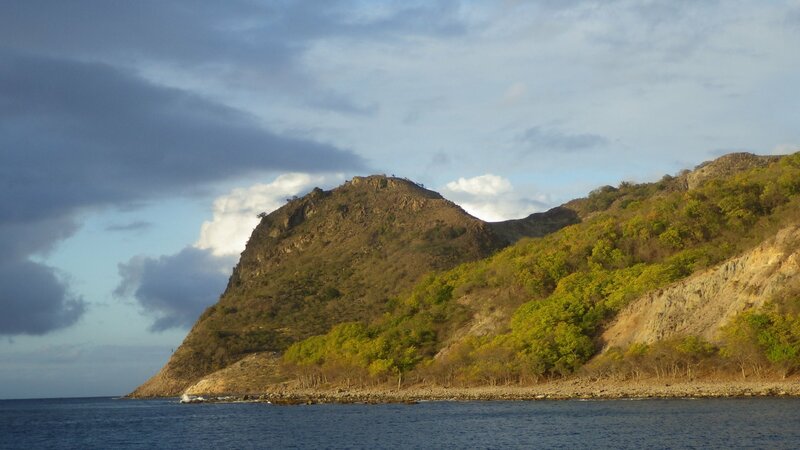 After relocating few remaining goats from the island the greenery starts to come back now. 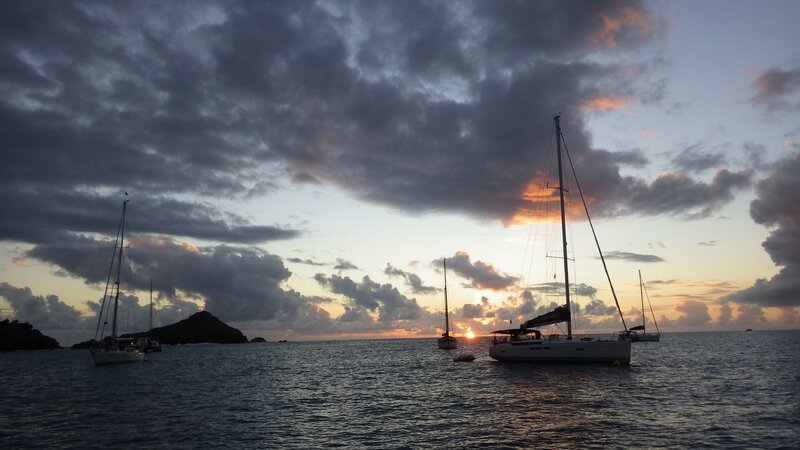 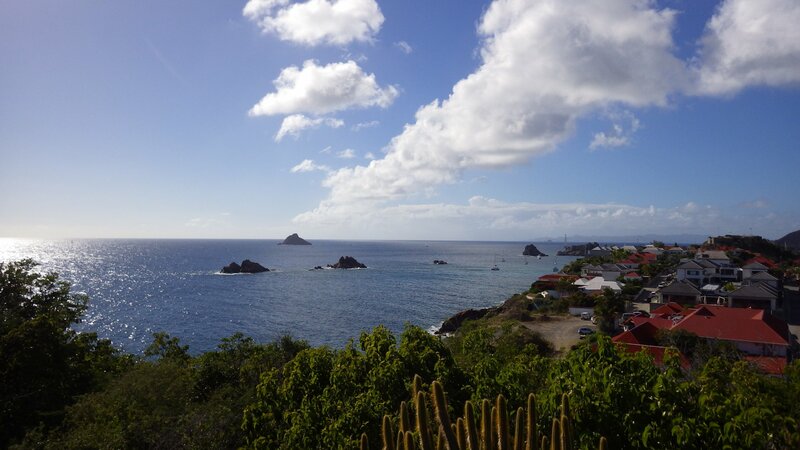 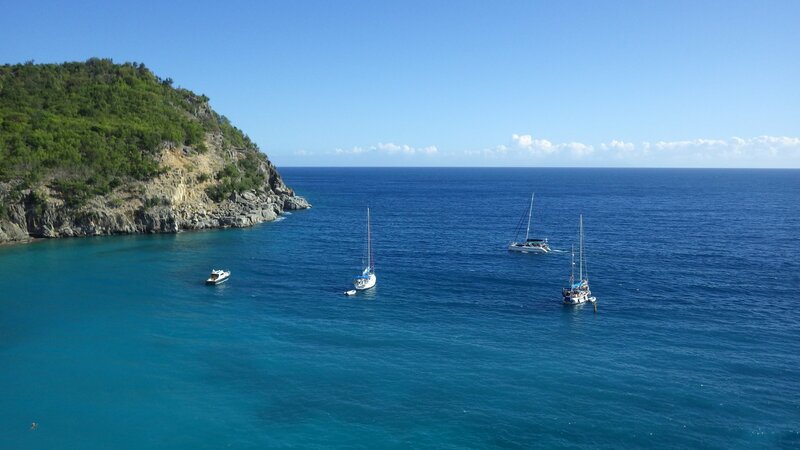 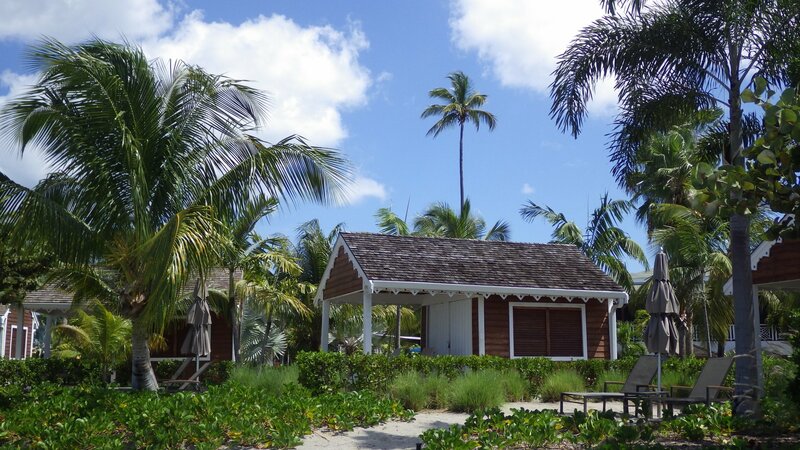 Overnight we stayed at Anse de Colombier, a picturesque bay on the northwest coast of St Barths Island. 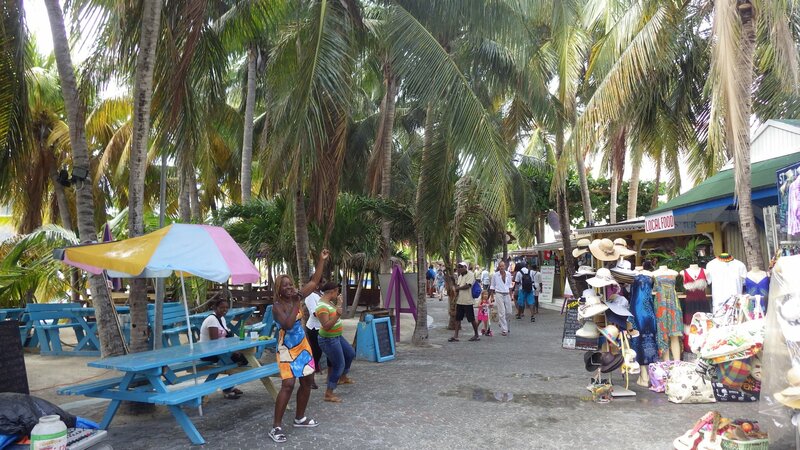 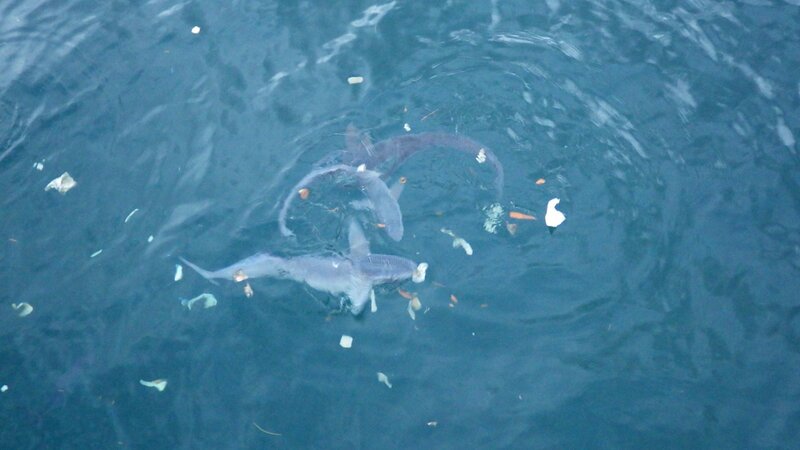 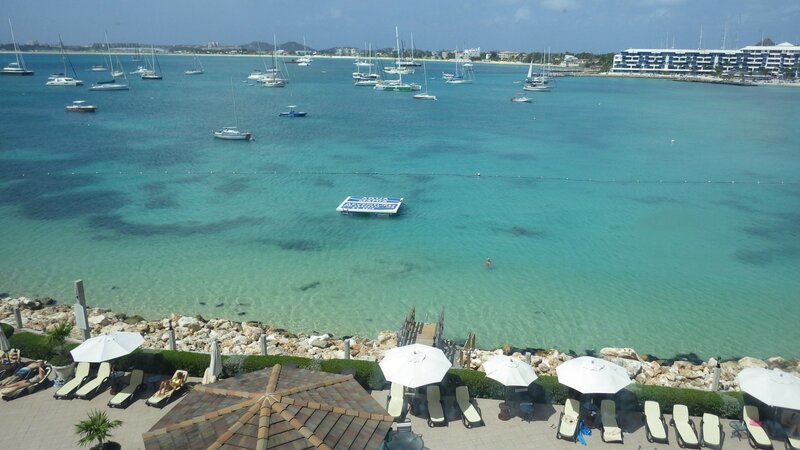 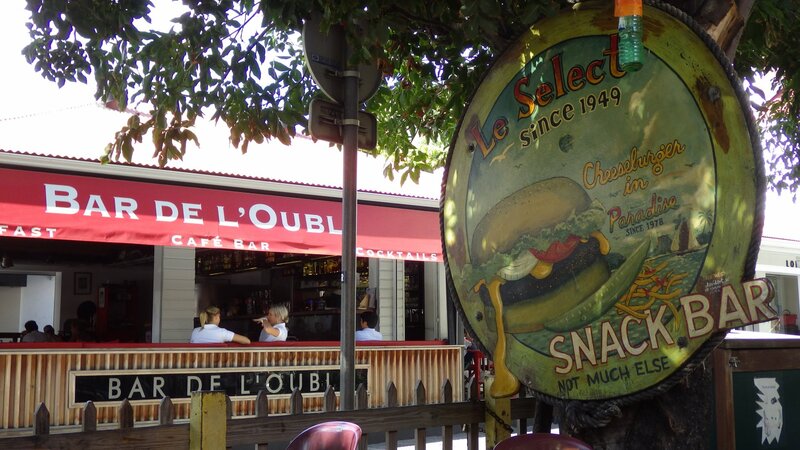 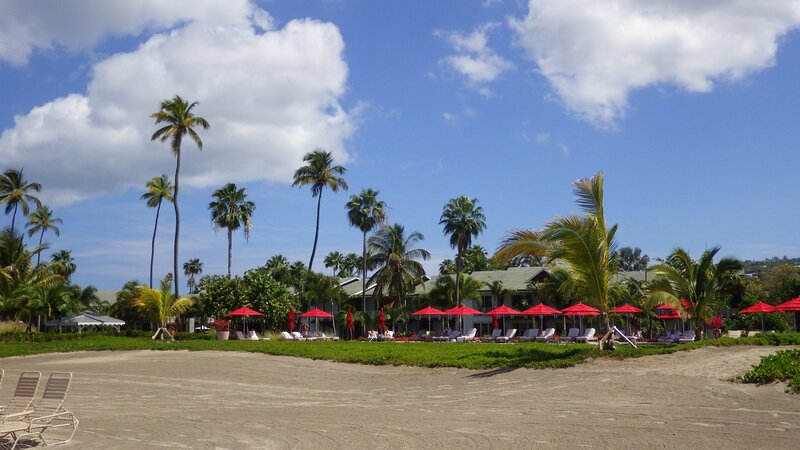 It is a very popular spot for day trippers � too much for our taste. 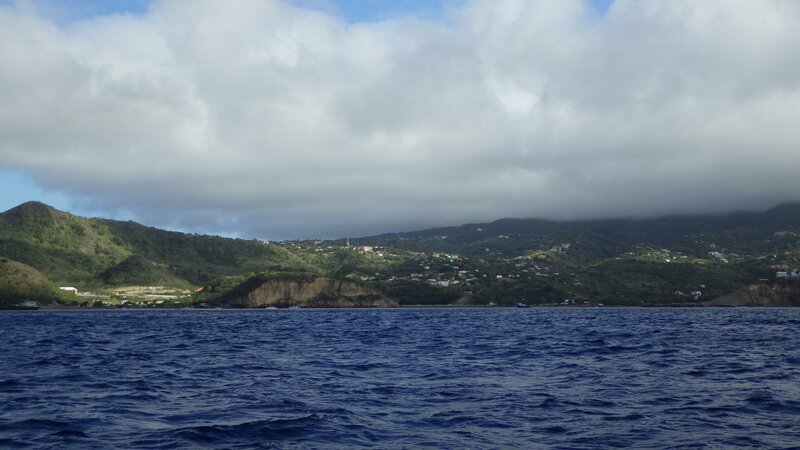 The northerly swell was wrapping around the cape and made our stay here not very comfortable. 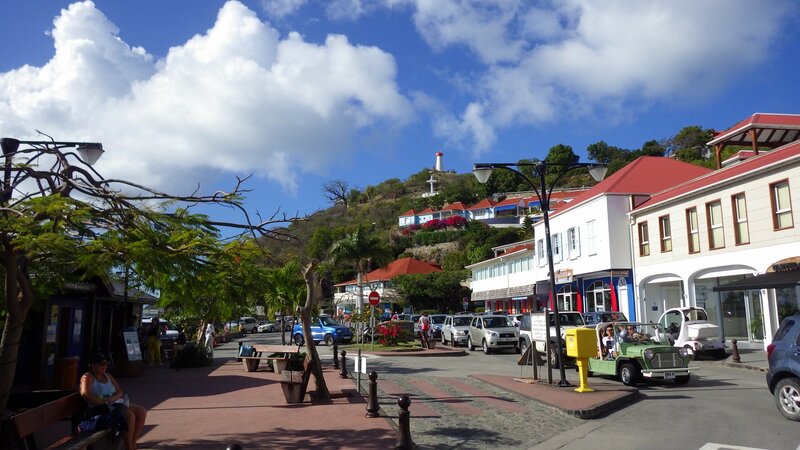 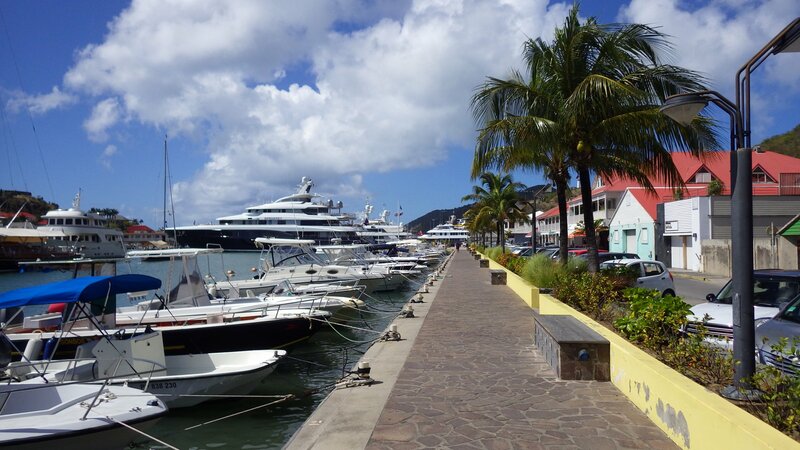 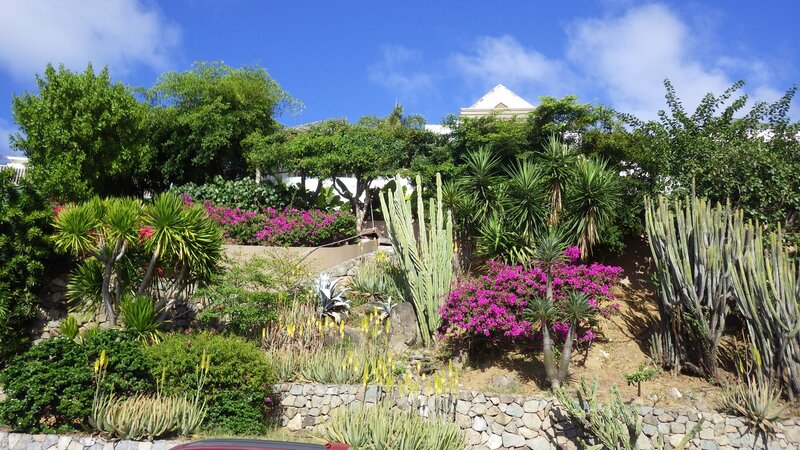 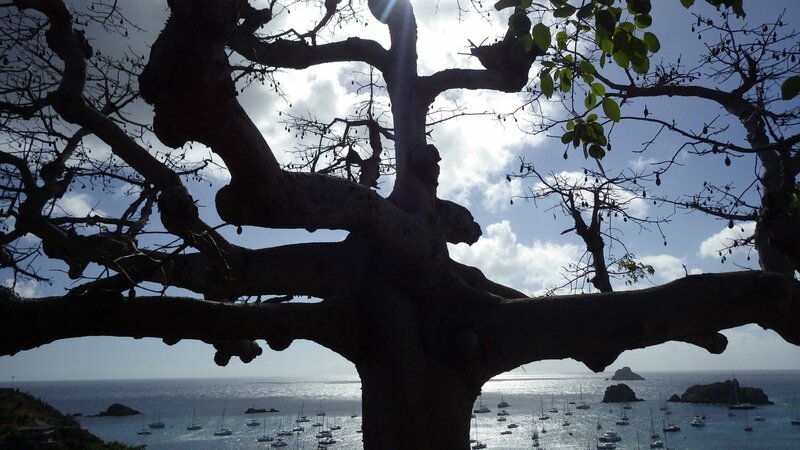 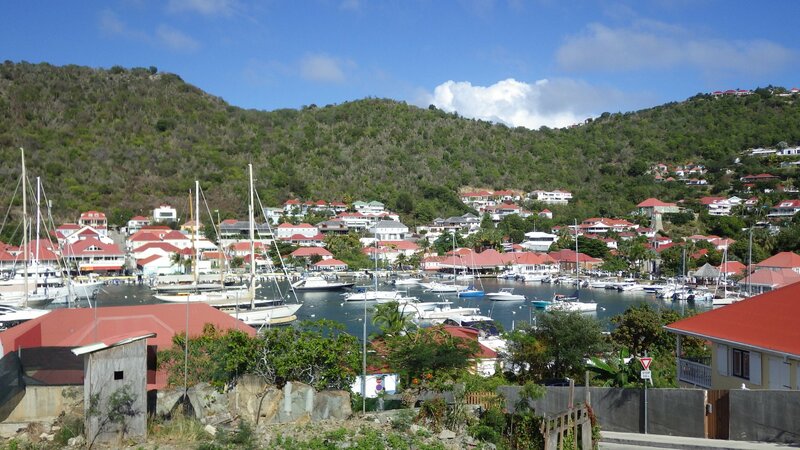 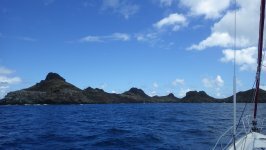 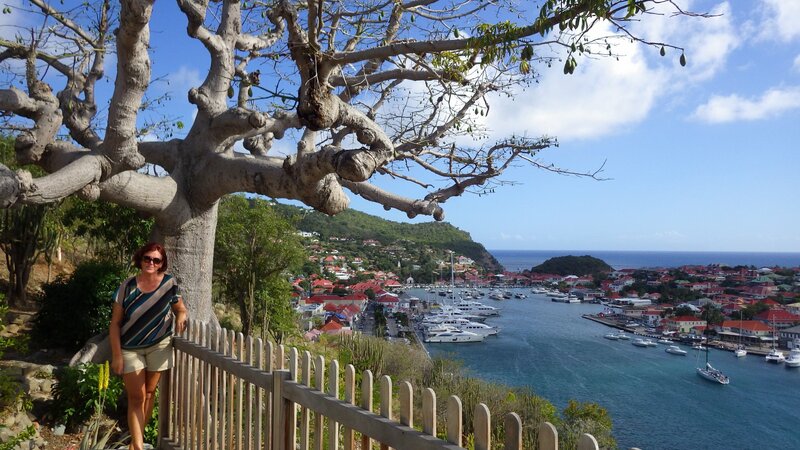 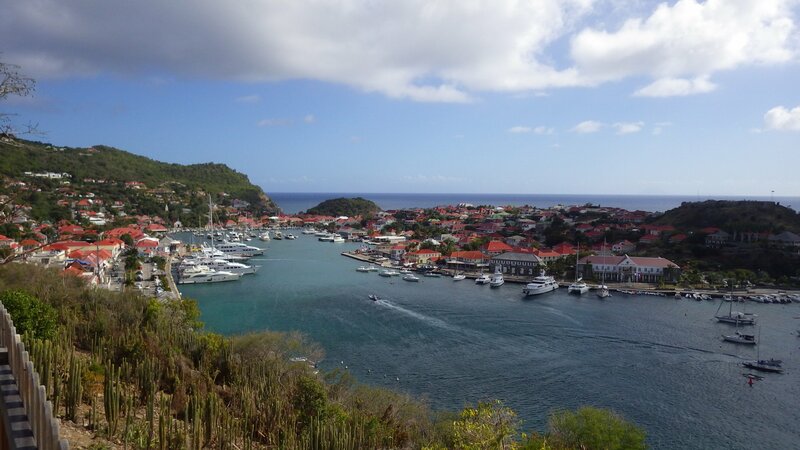 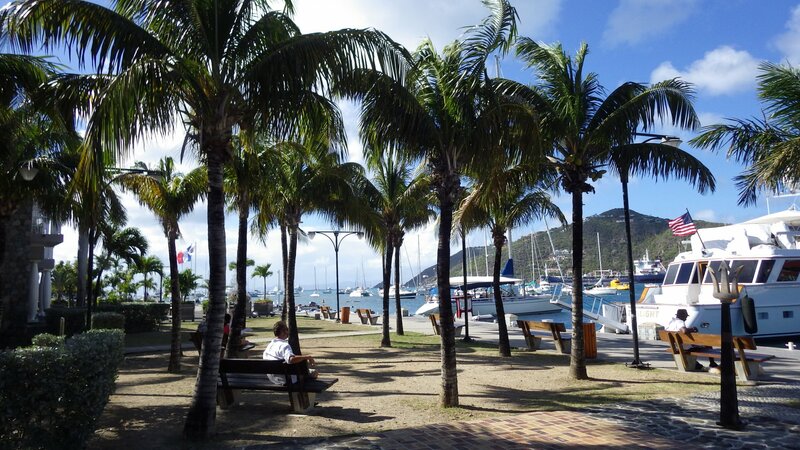 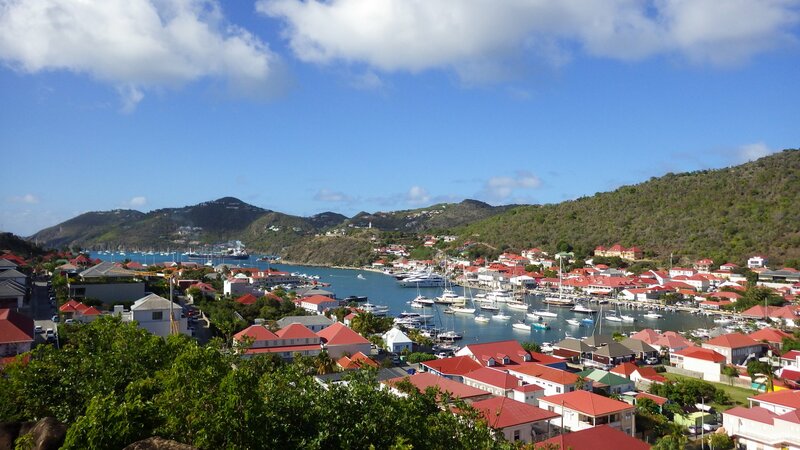 Part of the French overseas territories, Gustavia and the Island of St. Barthelemy (St. Barths) are very pretty looking, with European and French character. 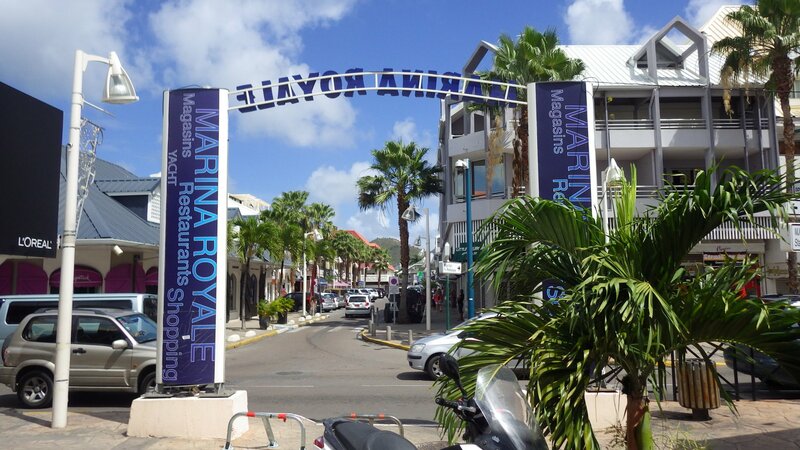 It has been said, celebrities hang out here. 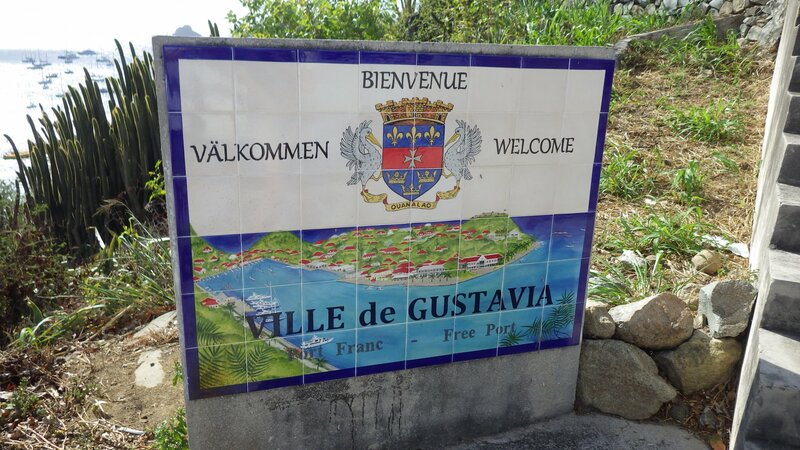 We haven't seen any during our stay, but the class of the place surely reflects this assumption. 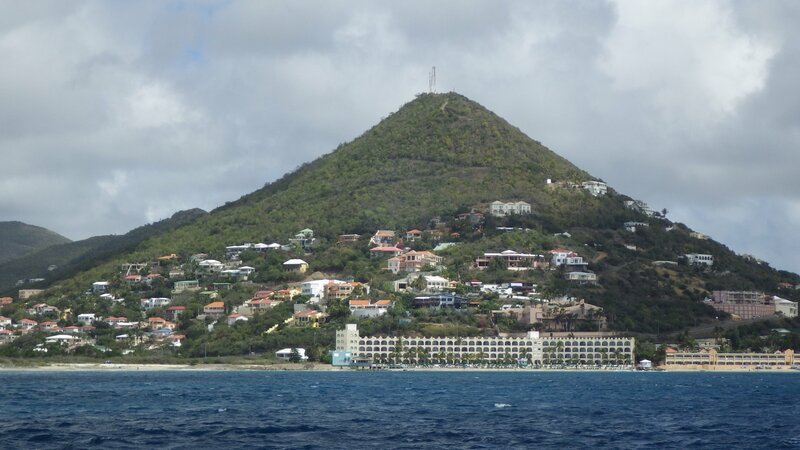 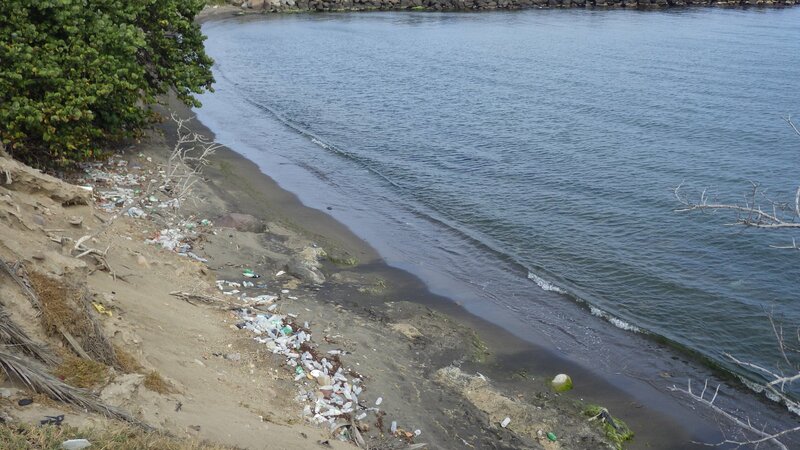 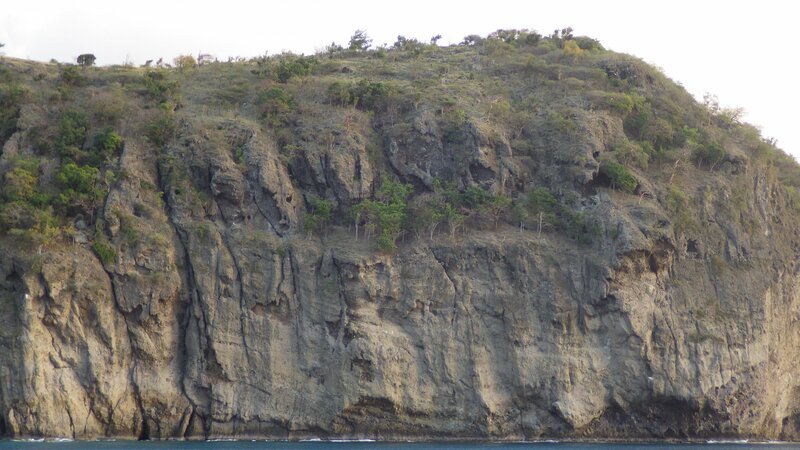 It is also said that this is the most expensive island in the Caribbean. 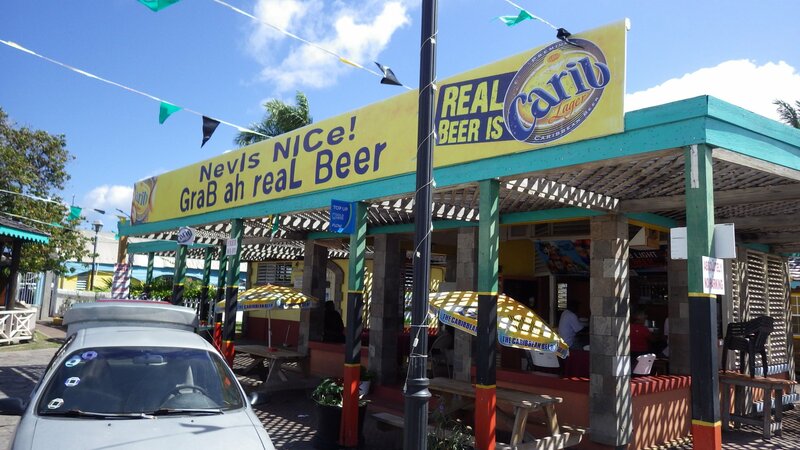 Sure I can attest to that. 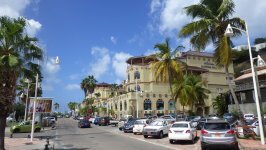 Nice high end / high price stores, restaurants and services. 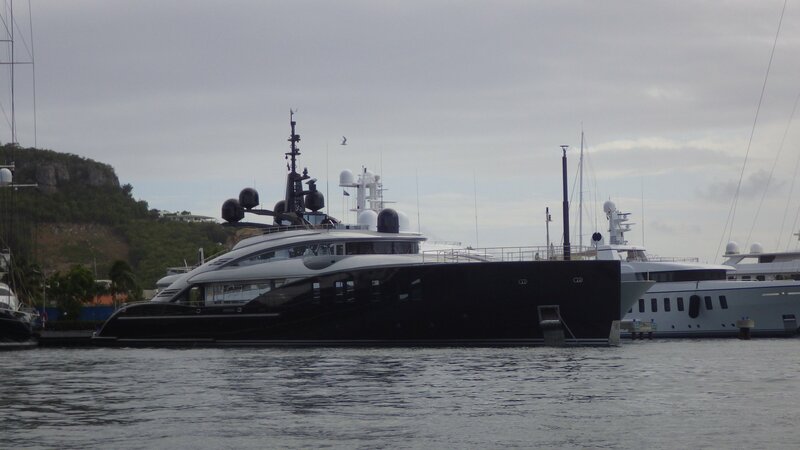 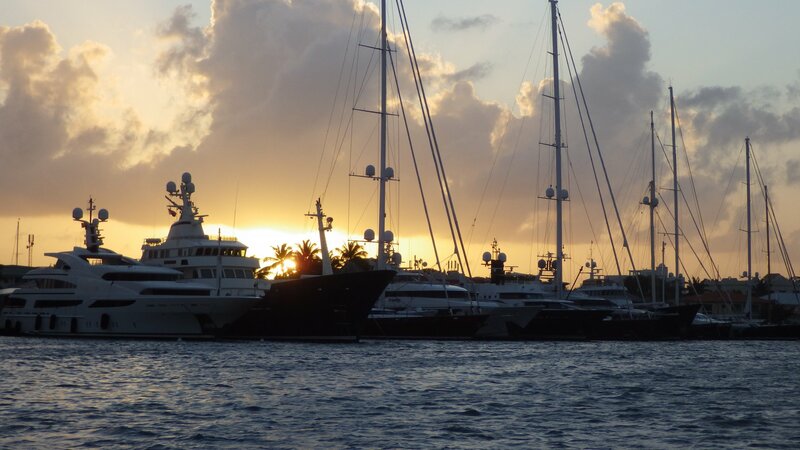 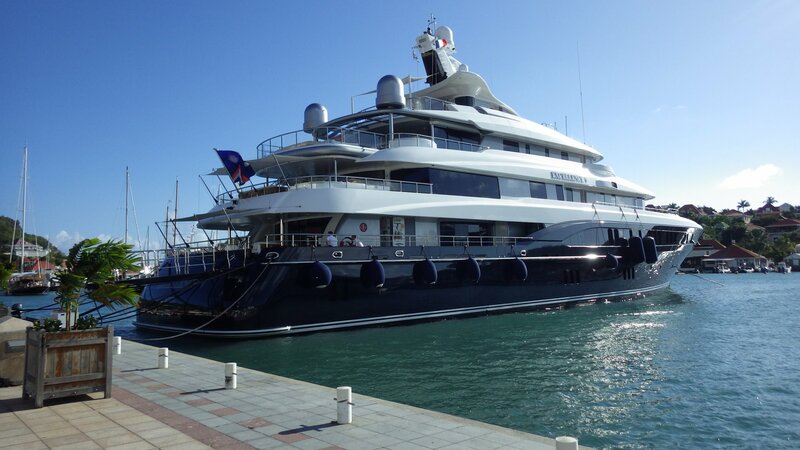 Best looking superyachts. 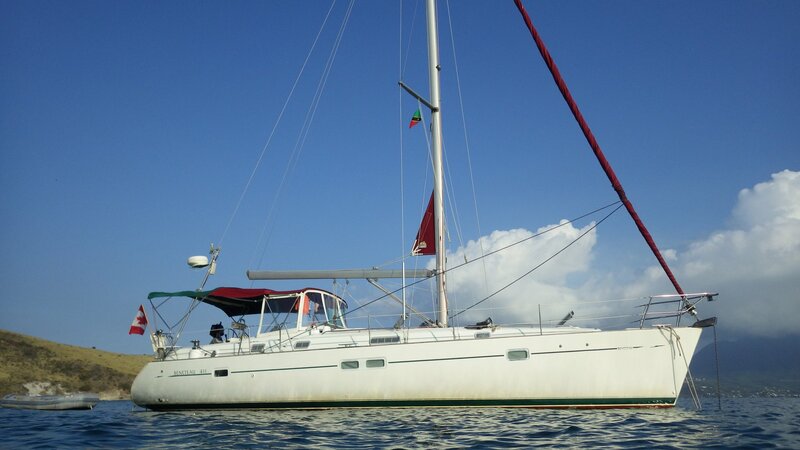 And you are being charged per day just to anchor outside the harbour. 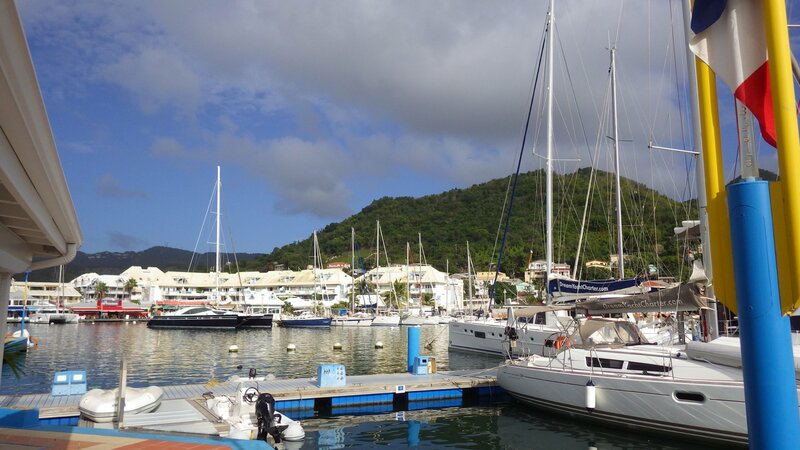 On our last morning here, we have been boarded by the French Coastguard for a routine check. 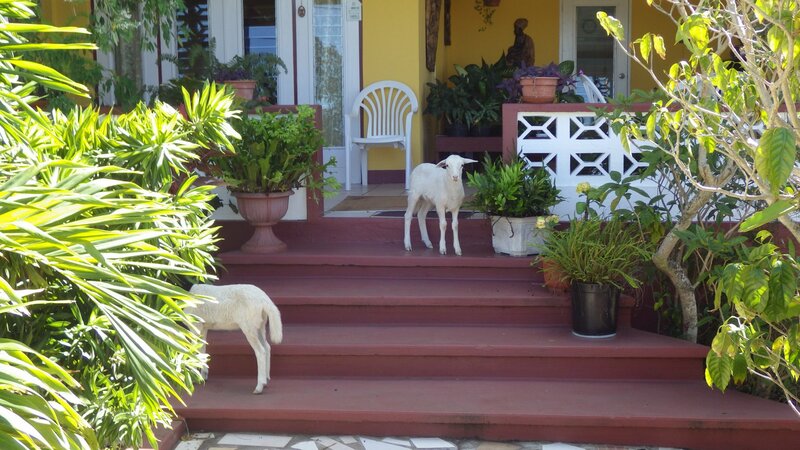 Security is obviously important on the island. 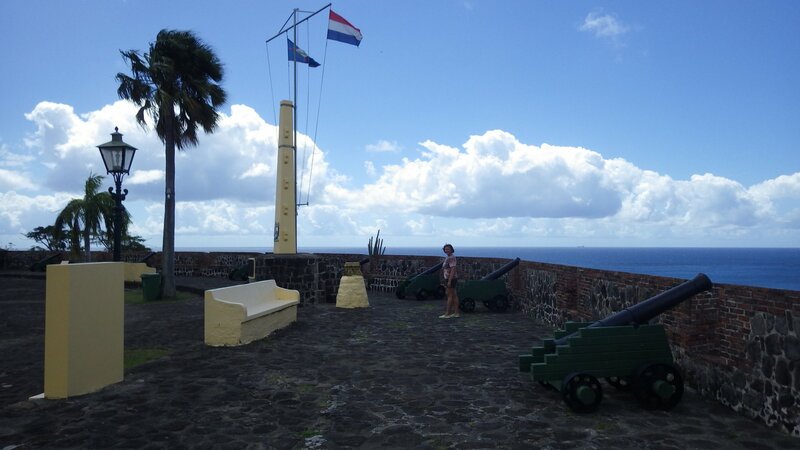 We spent several pleasurable days here � visiting historic forts on the high hills, wondering streets, looking for inexpensive places to eat. 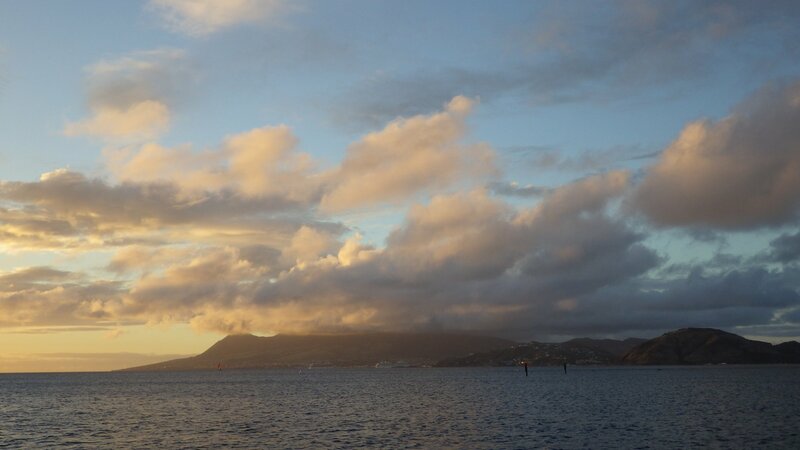 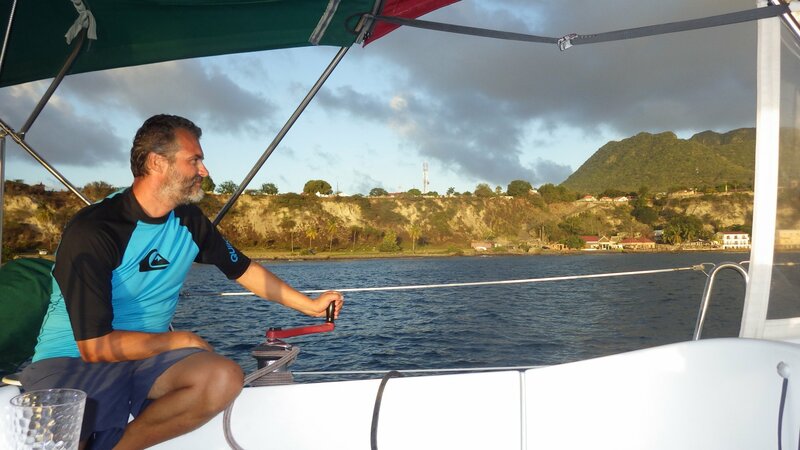 Although the outside anchorage is far and quite rough in strong easterly winds. 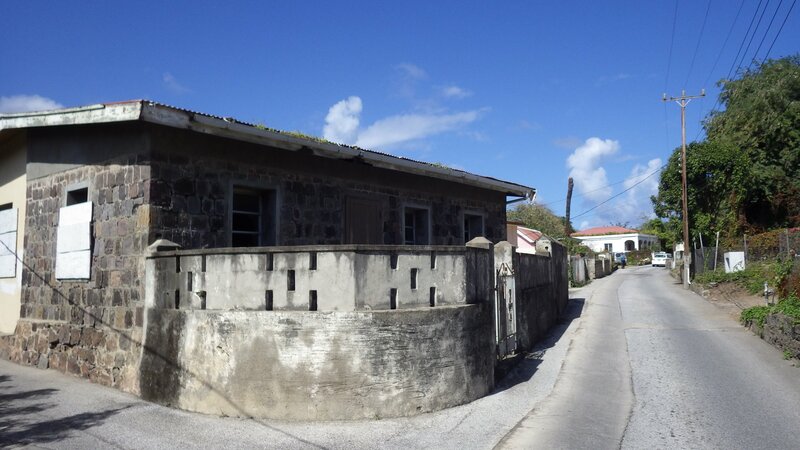 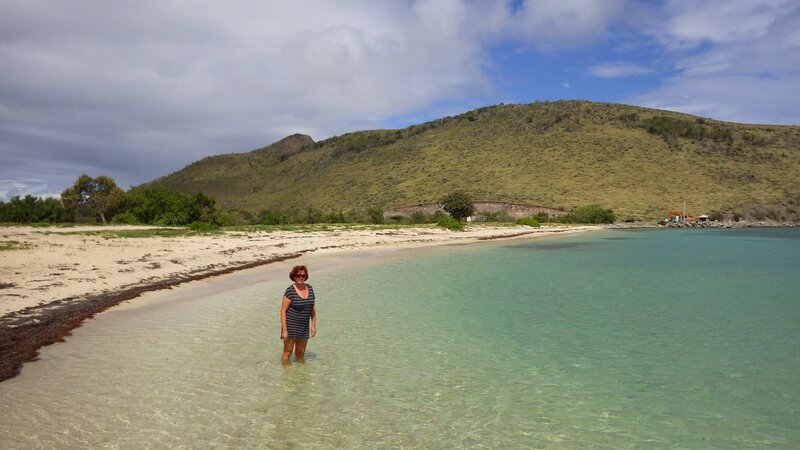 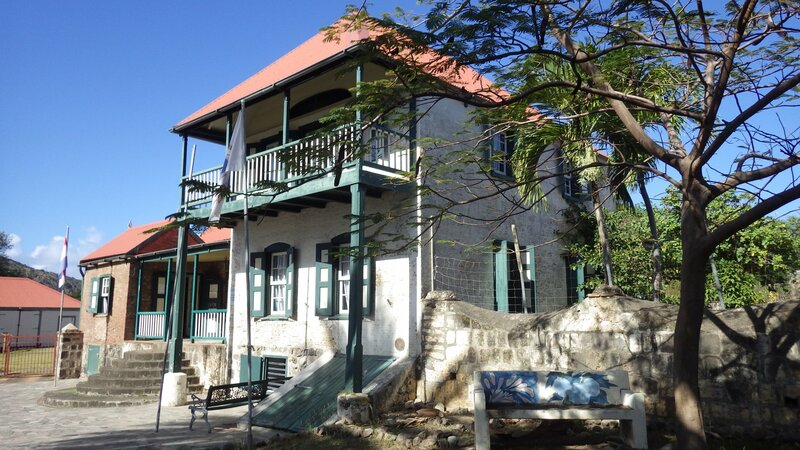 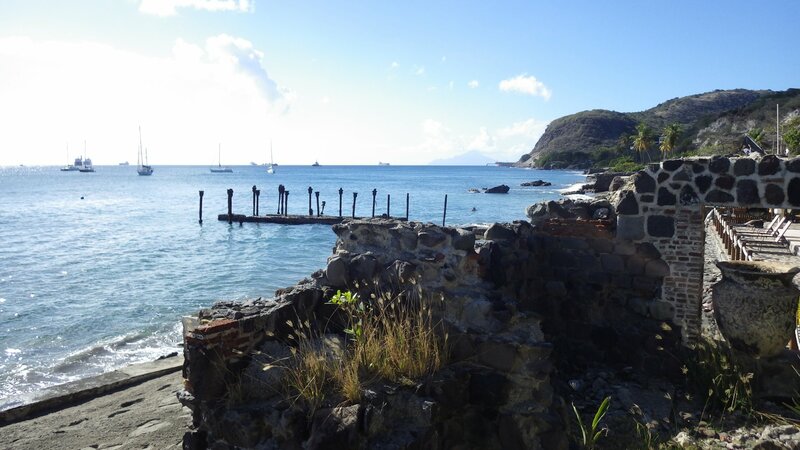 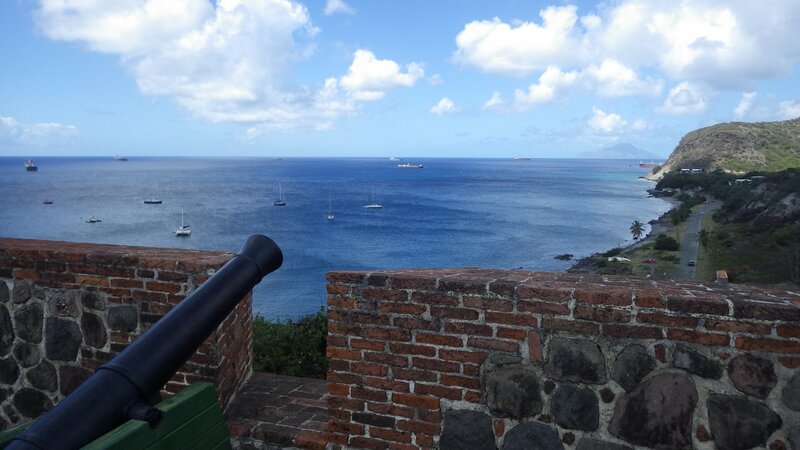 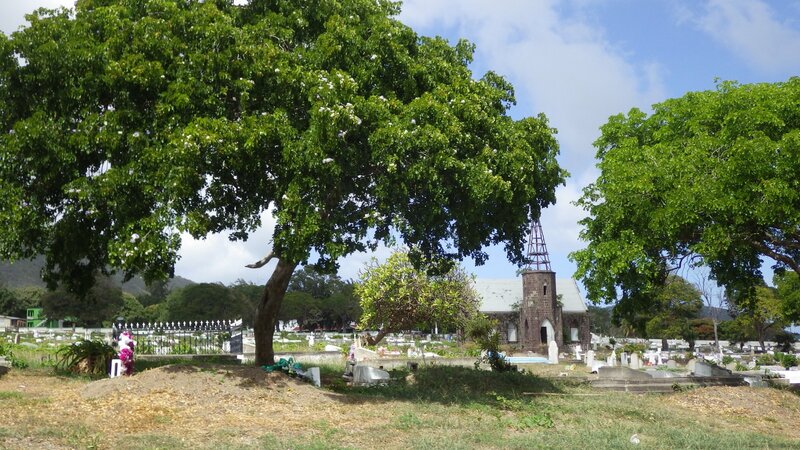 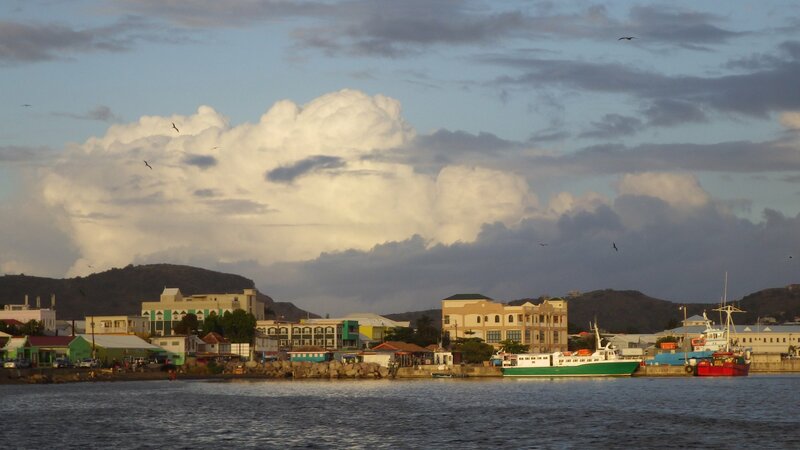 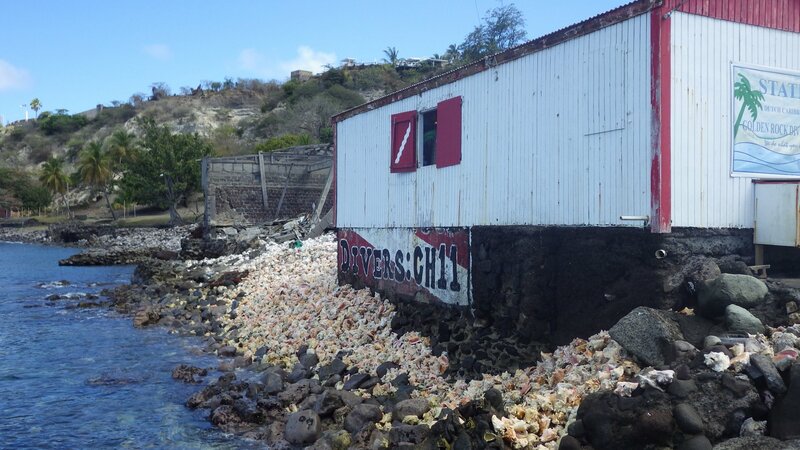 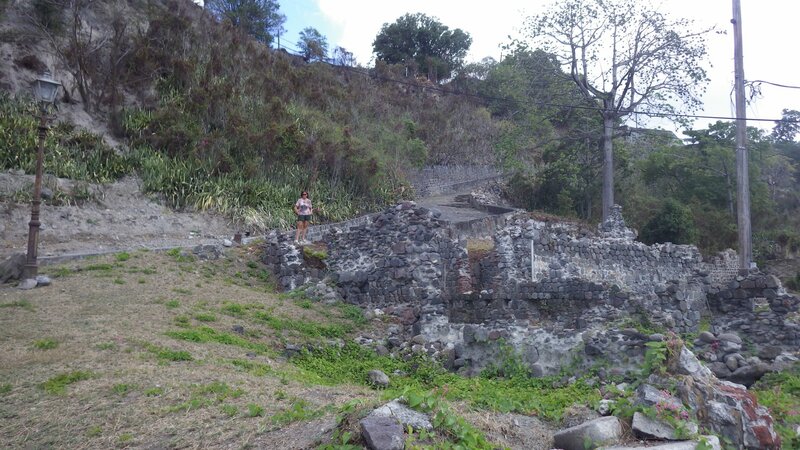 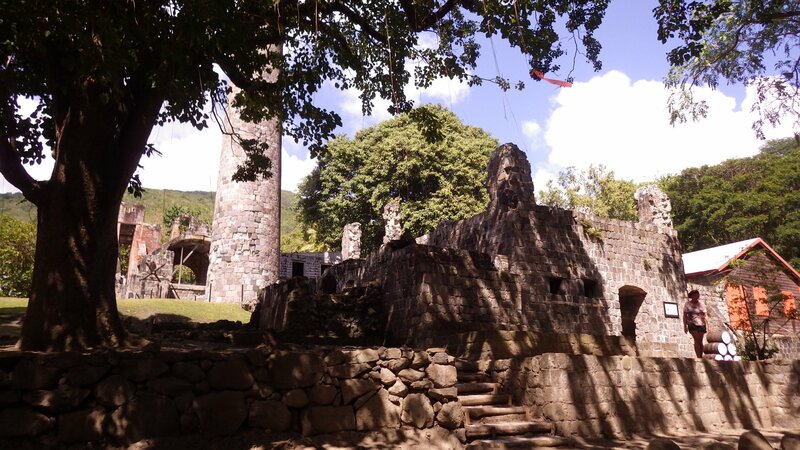 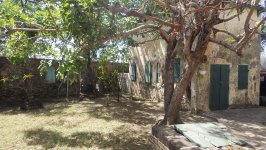 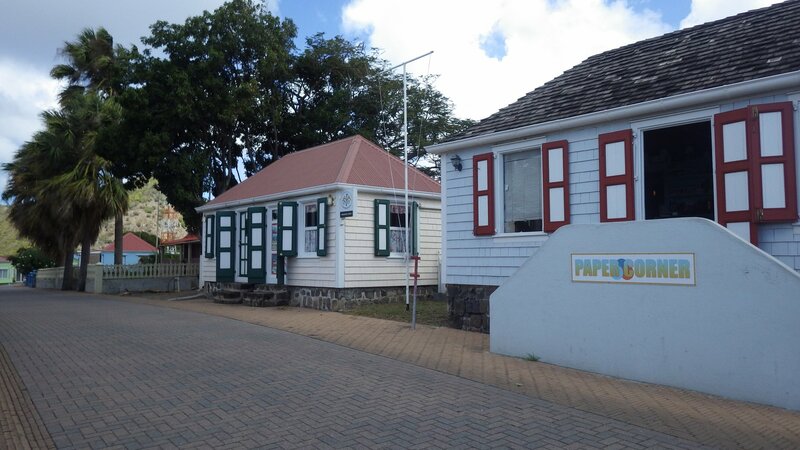 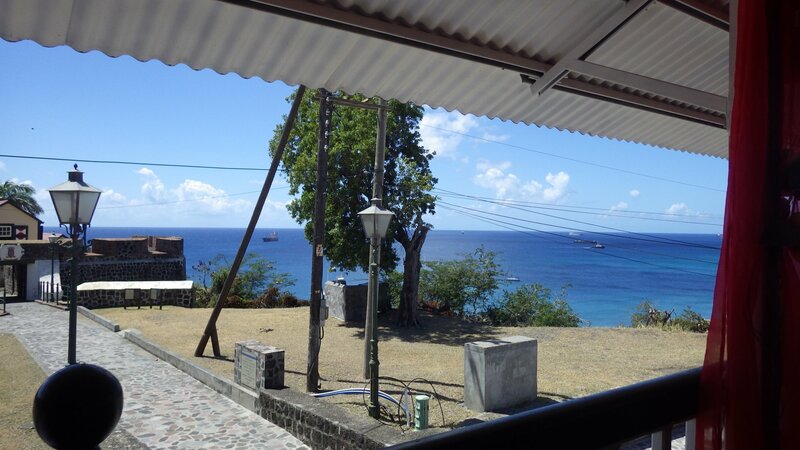 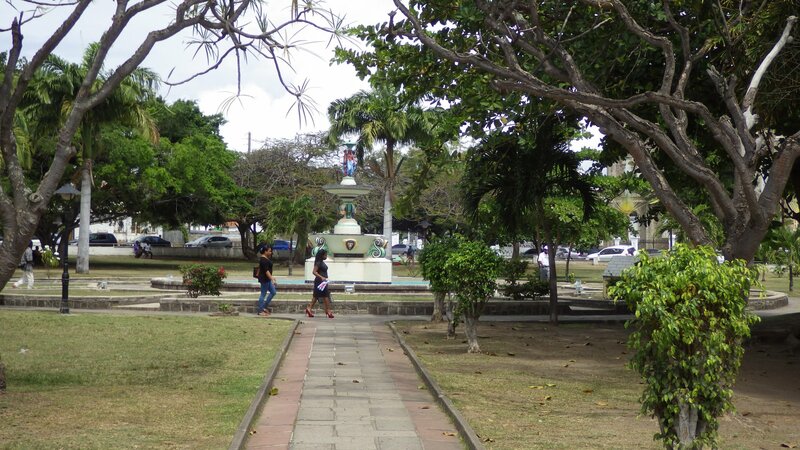 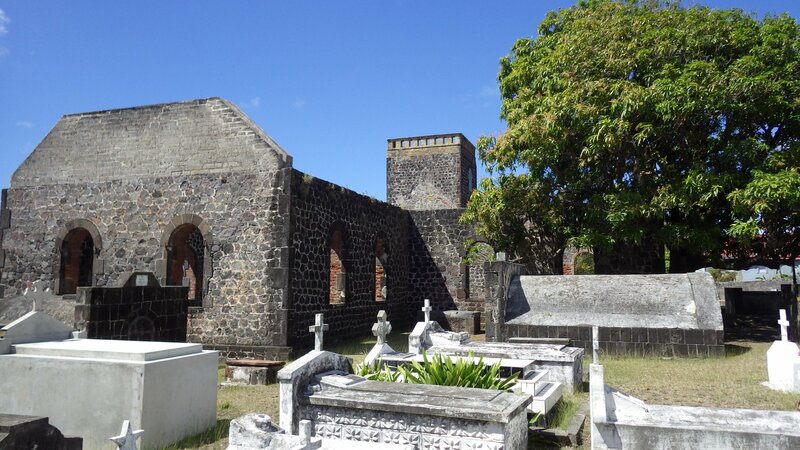 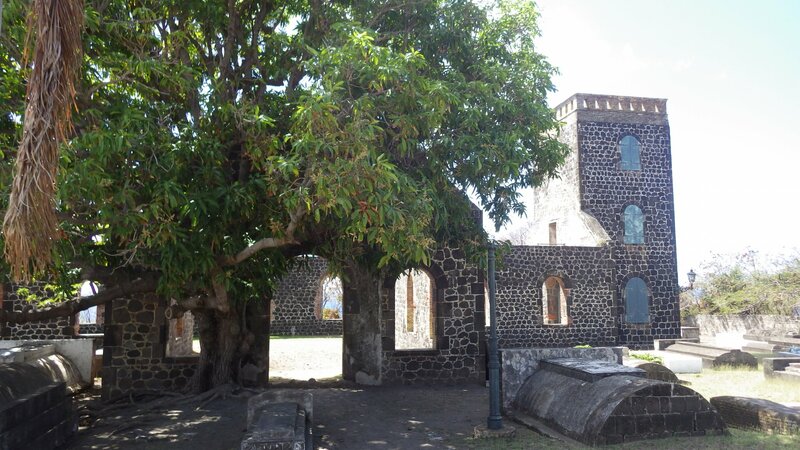 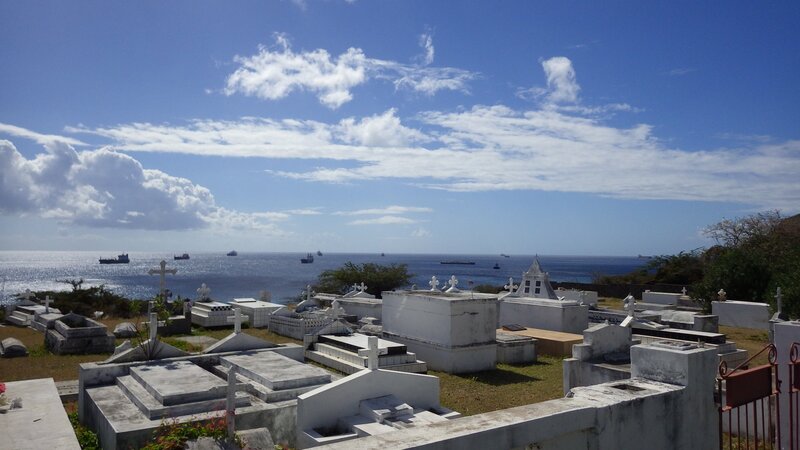 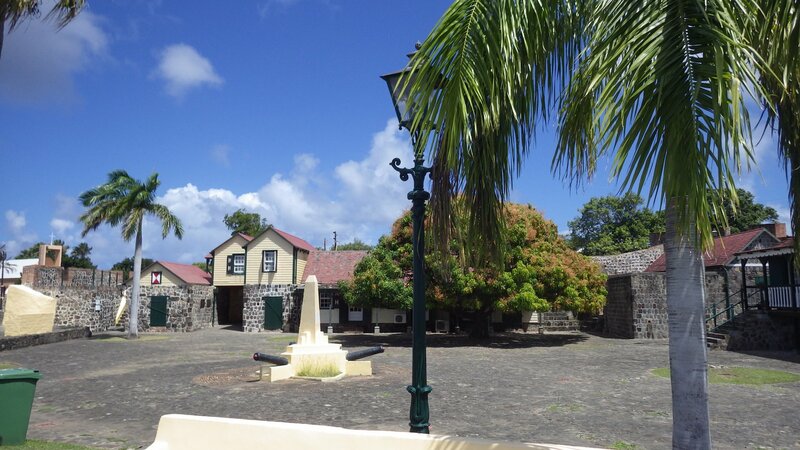 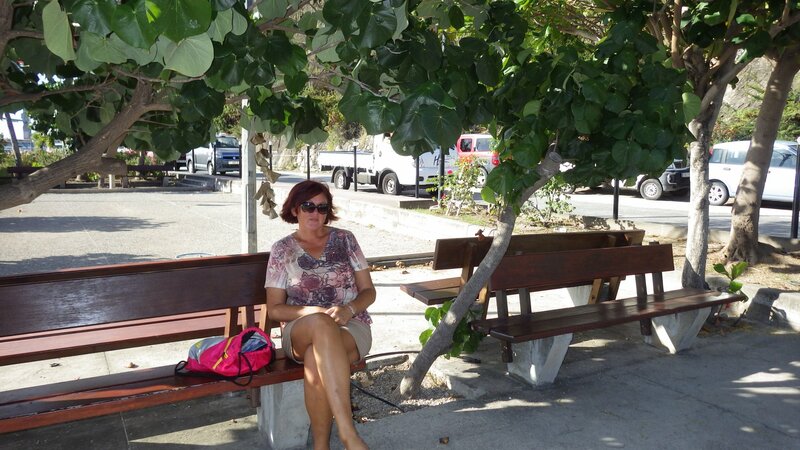 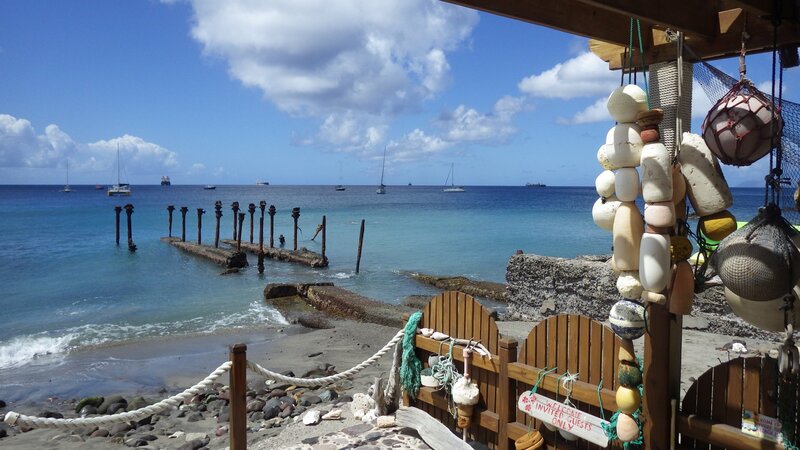 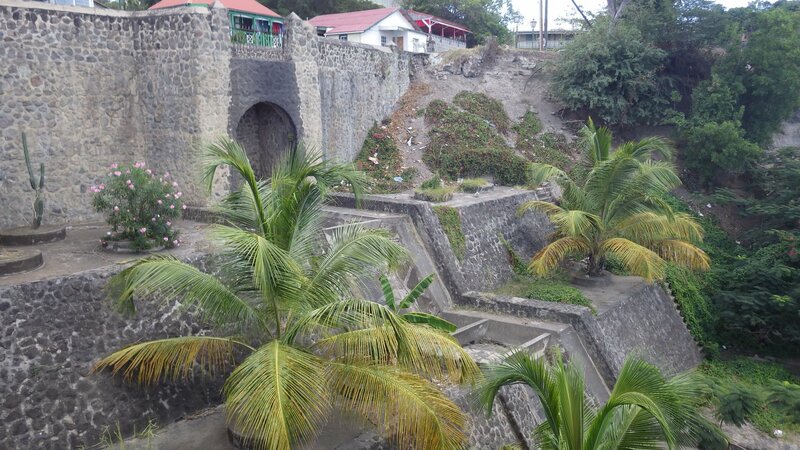 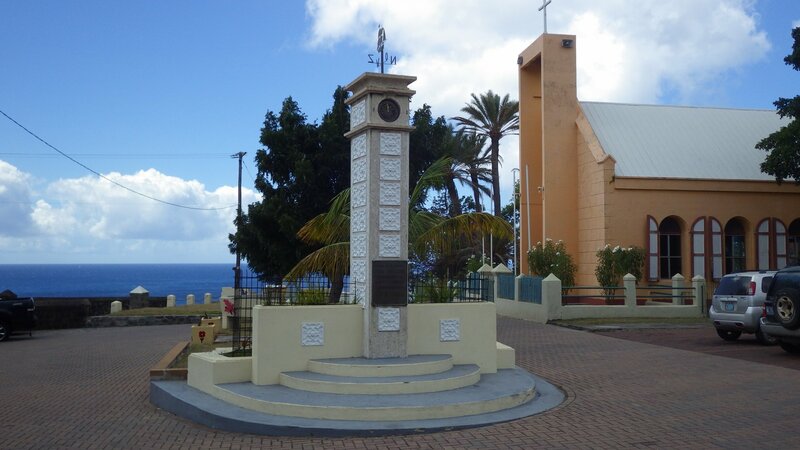 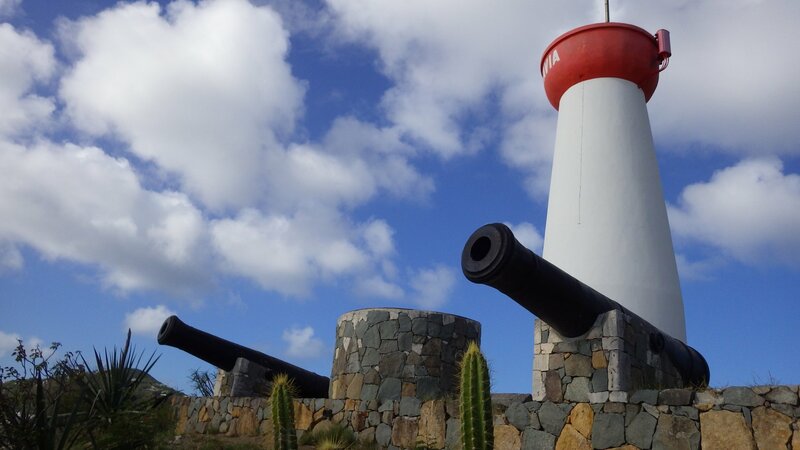 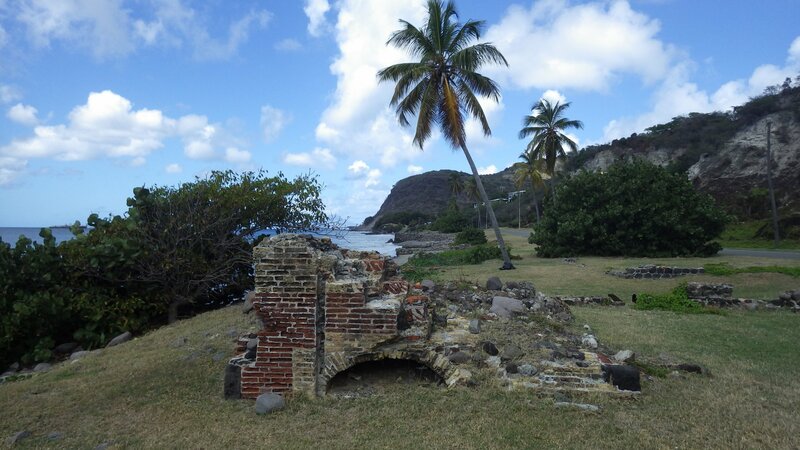 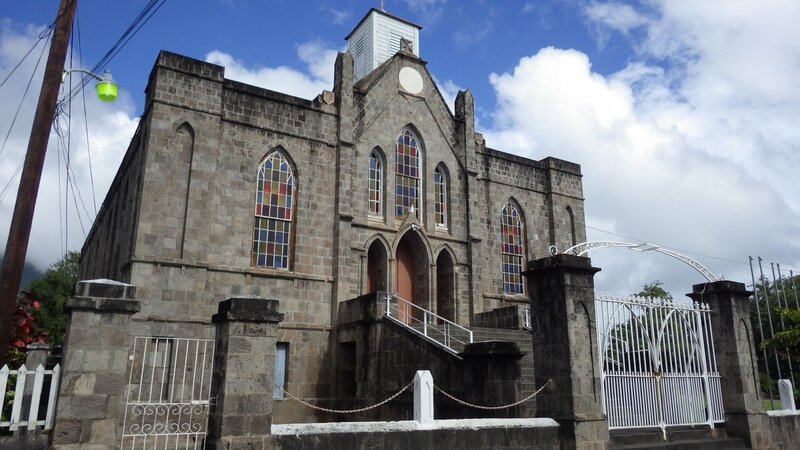 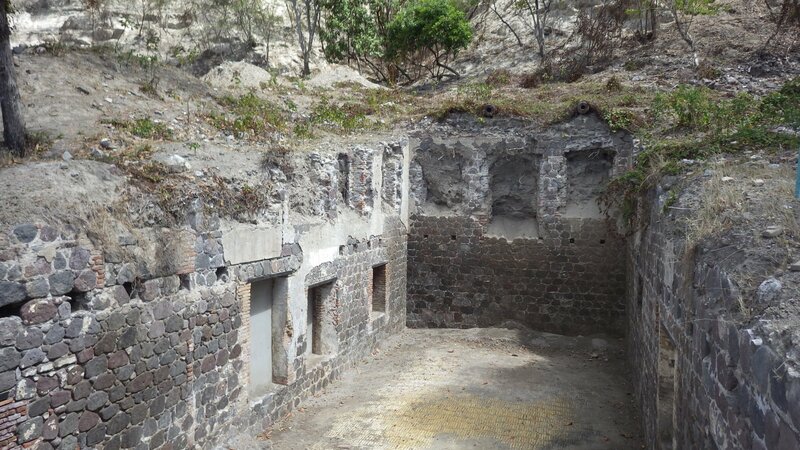 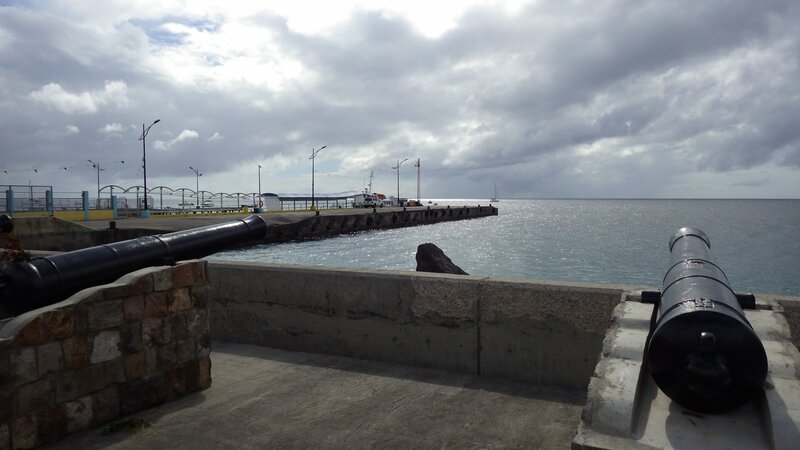 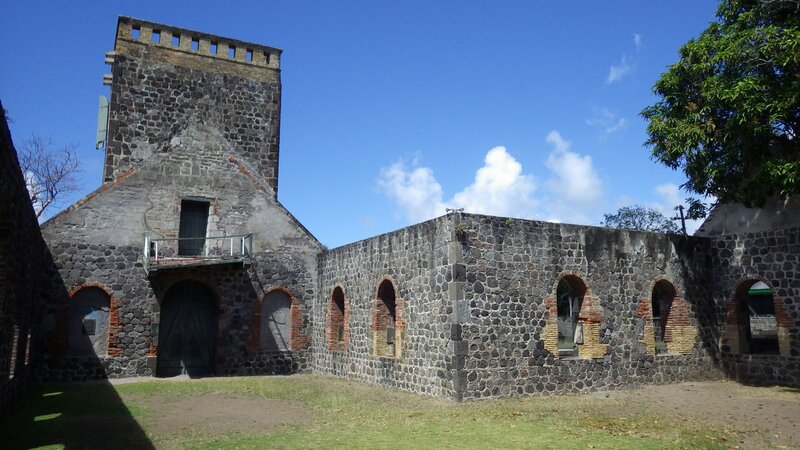 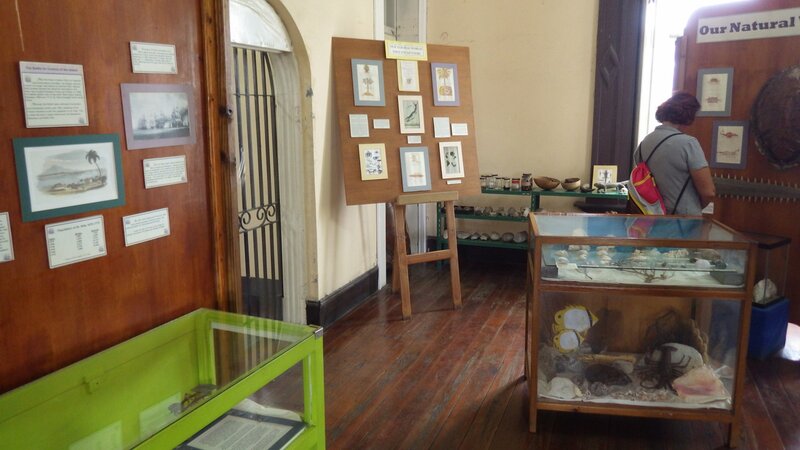 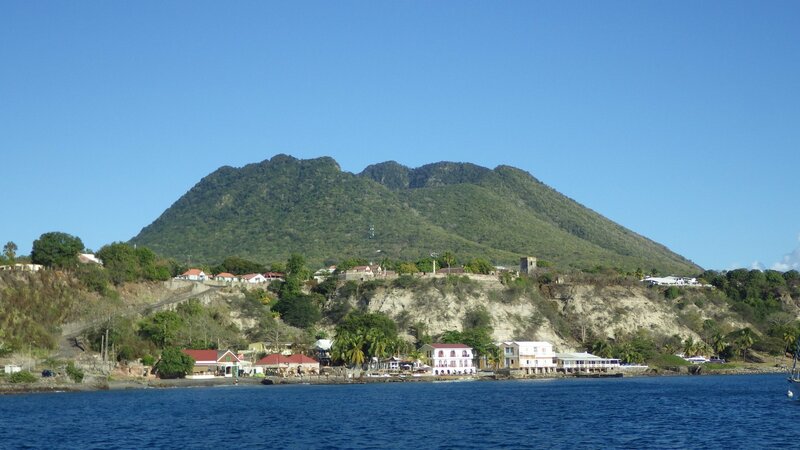 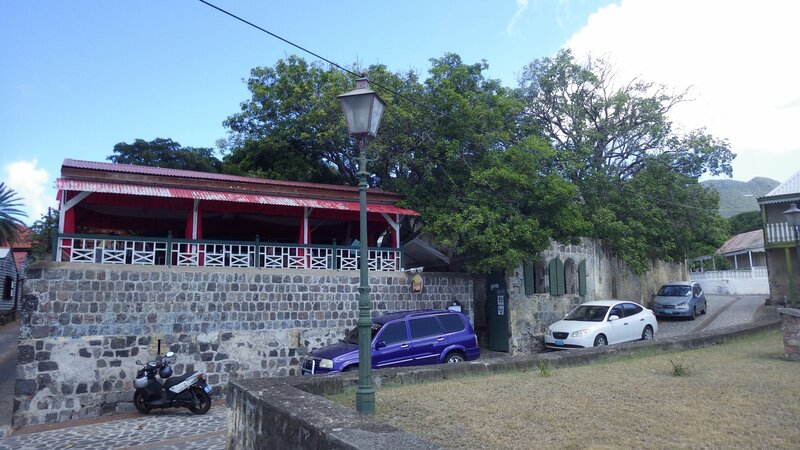 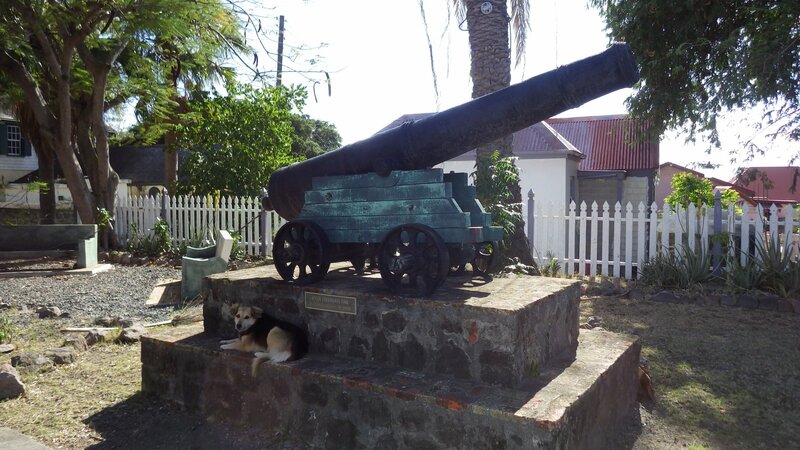 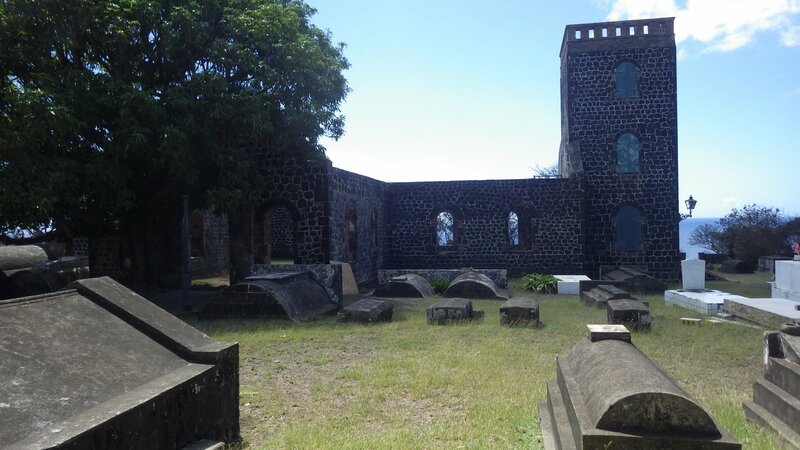 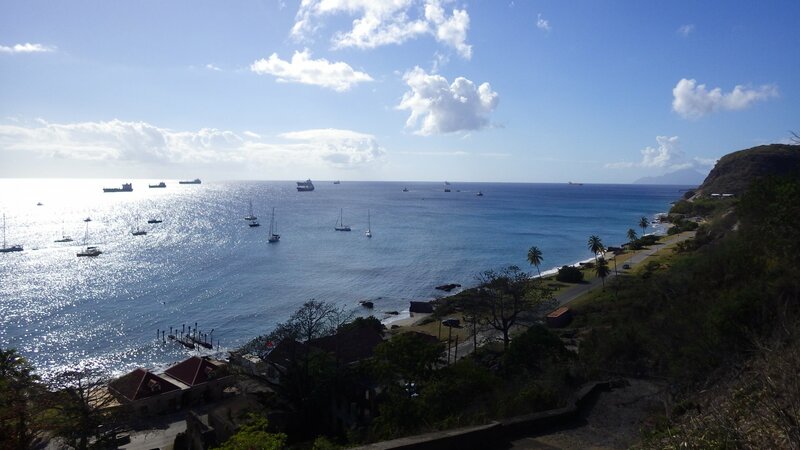 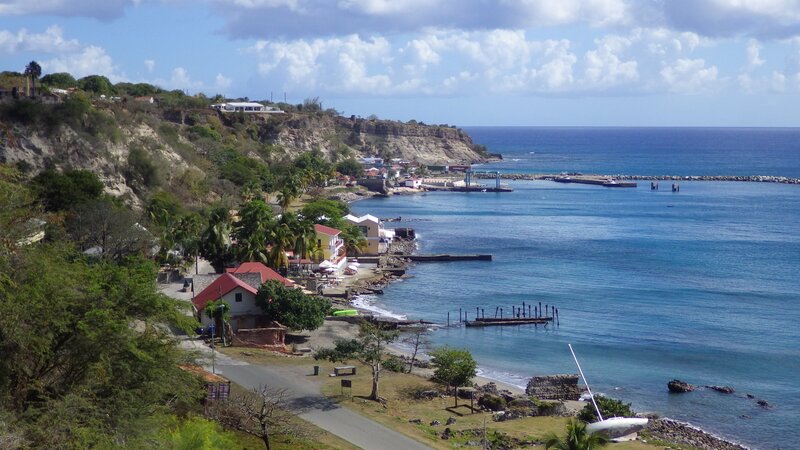 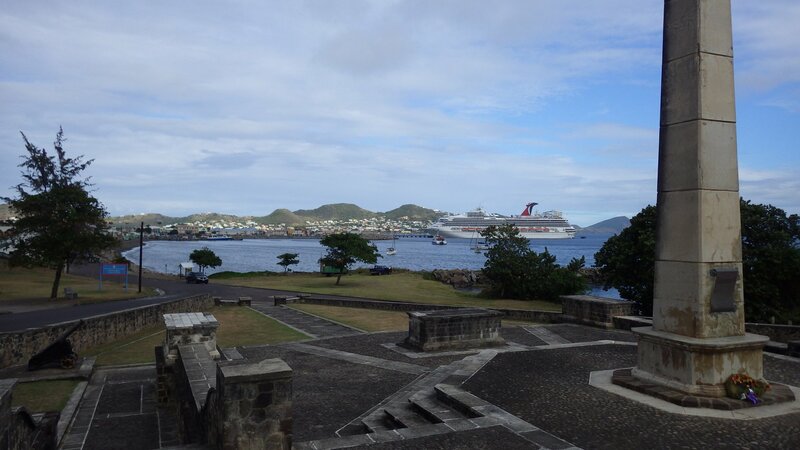 Statia (St. Eustatius) is a small island with lots of history. 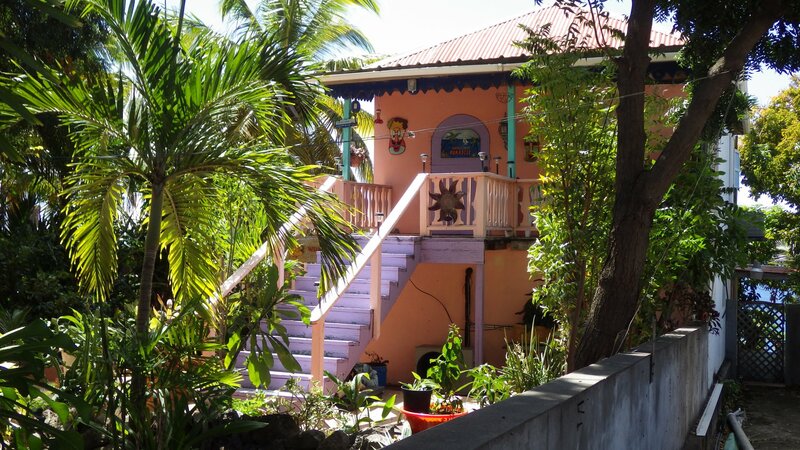 It has a quiet charm. 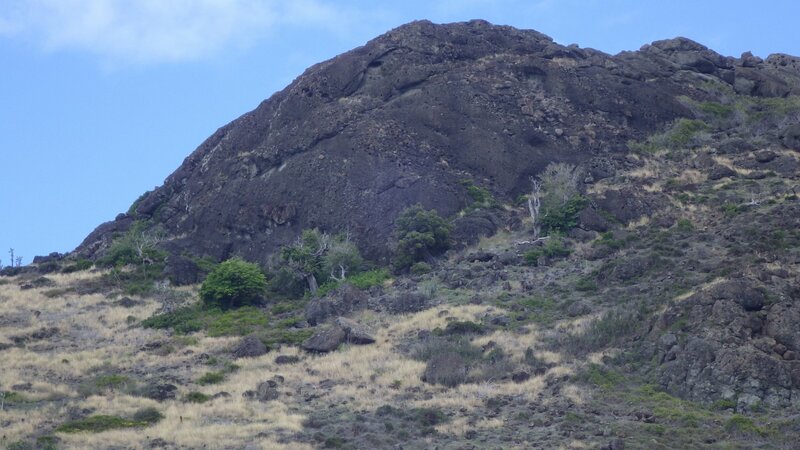 Unspoiled by the tourists, it sleeps under the dormant volcano crater. 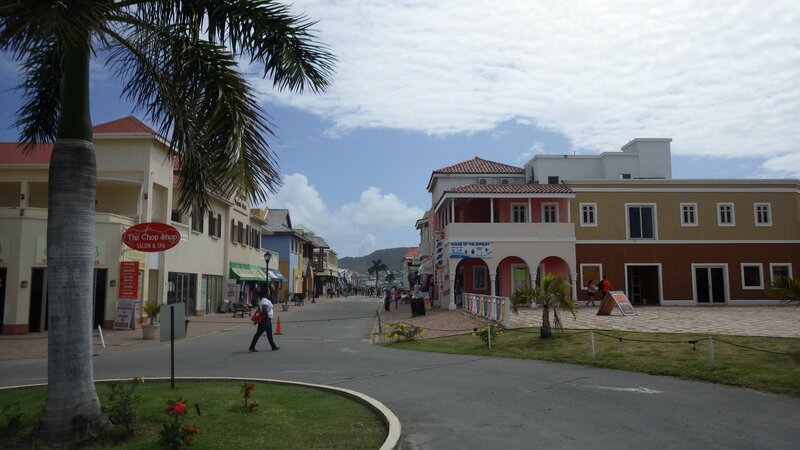 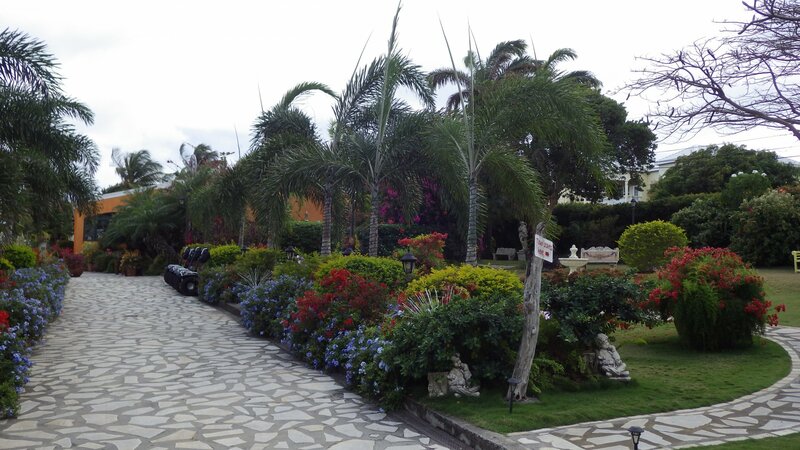 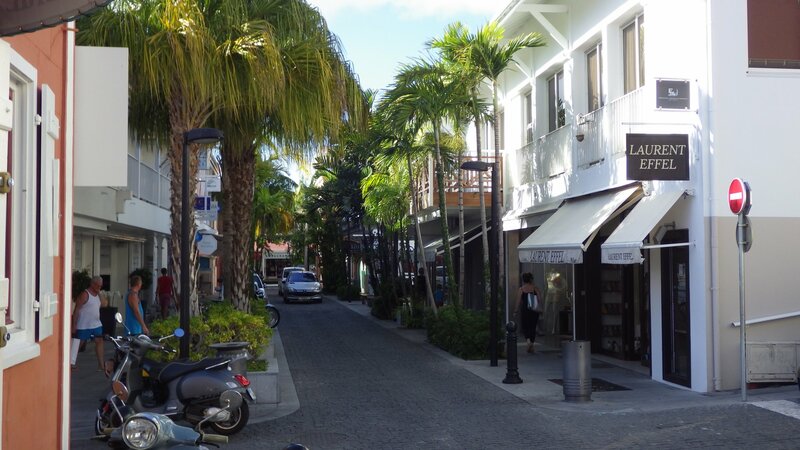 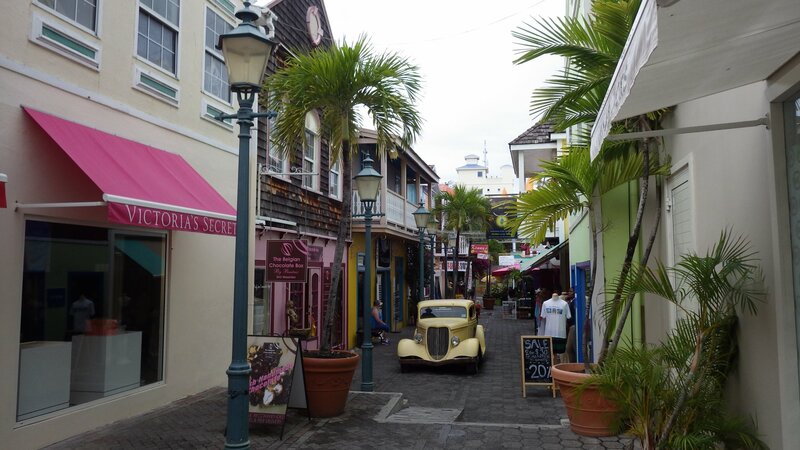 Many streets of the main town Oranjestad are stone paved, tightly lined up with colorful gingerbread houses. 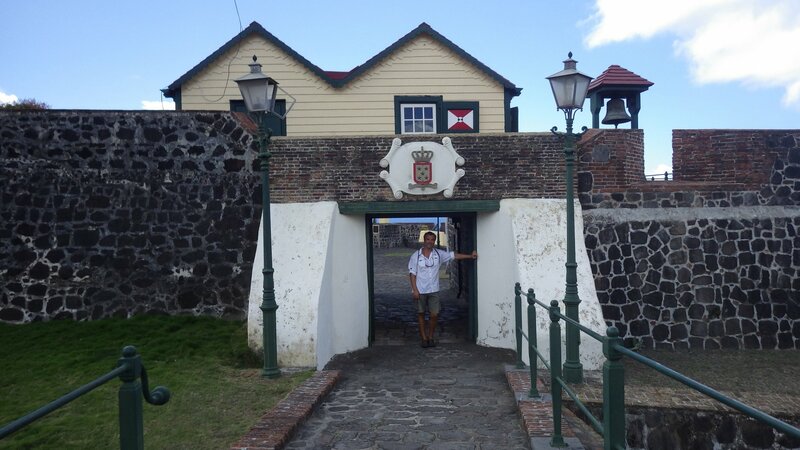 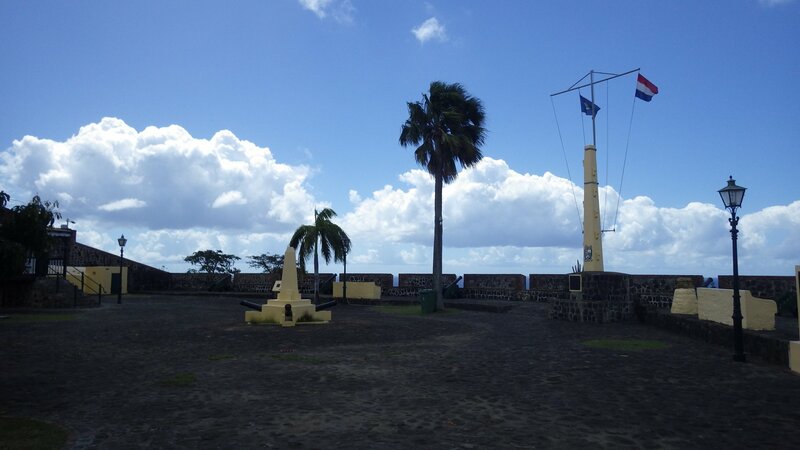 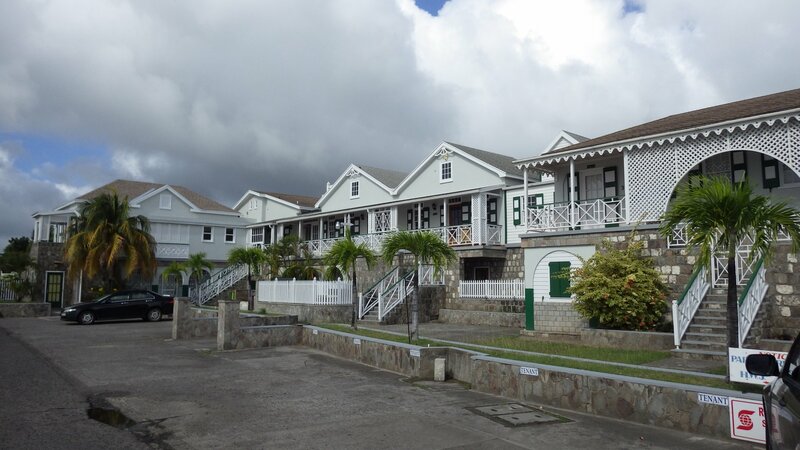 The historic Fort Oranje is nicely restored. 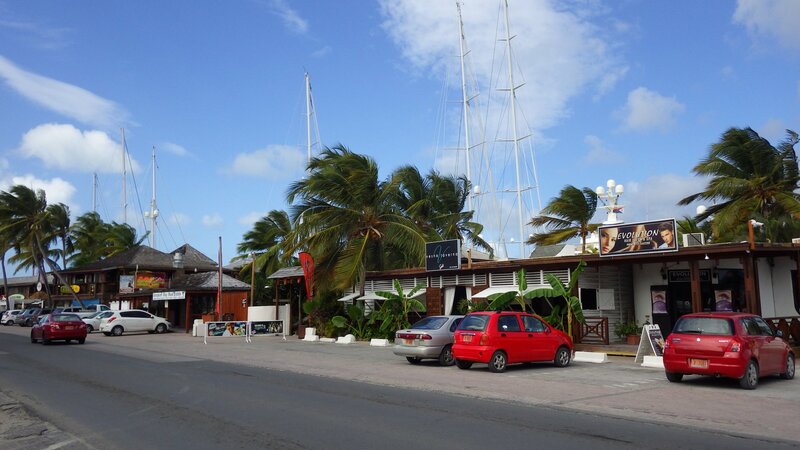 There are basic stores and services, noting for yachties though. 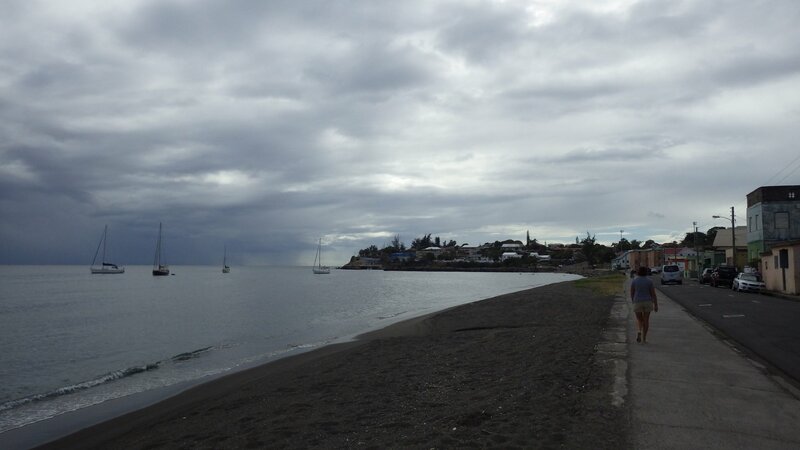 The main harbour, Oranje Baai, is fairly open for wild weather to roam, the shores are eroded with time. 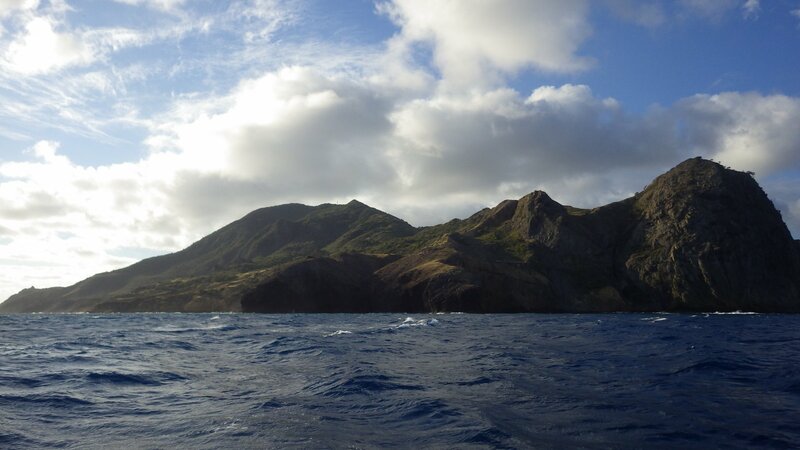 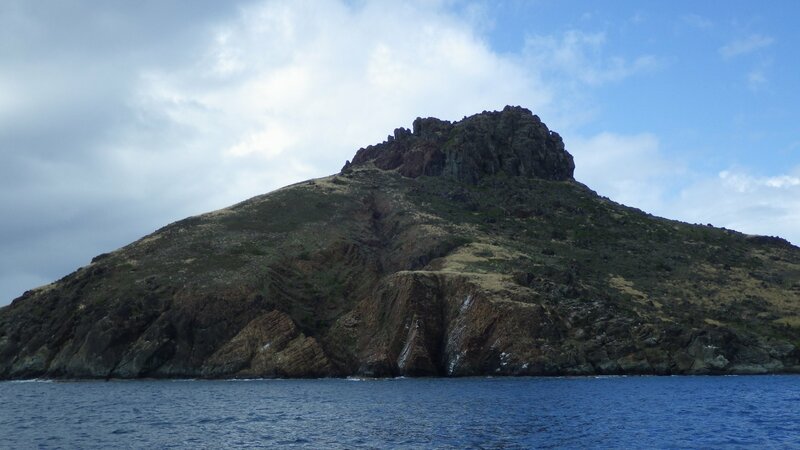 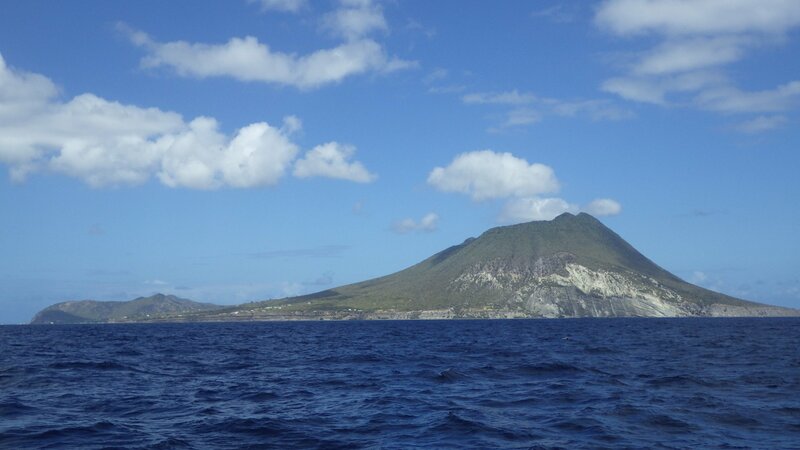 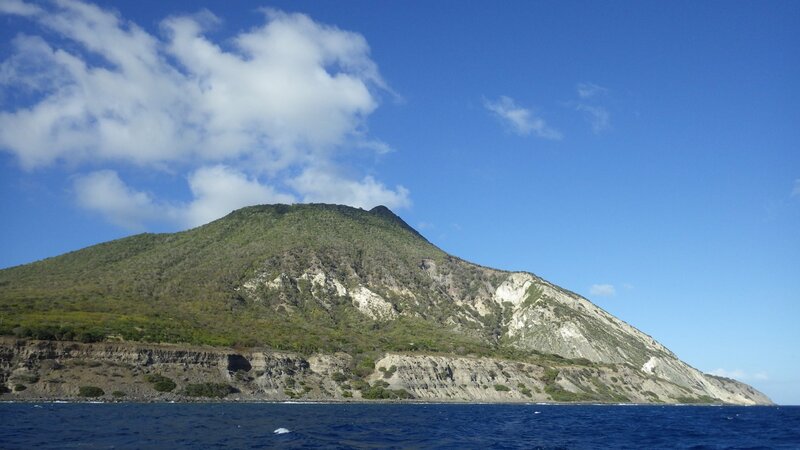 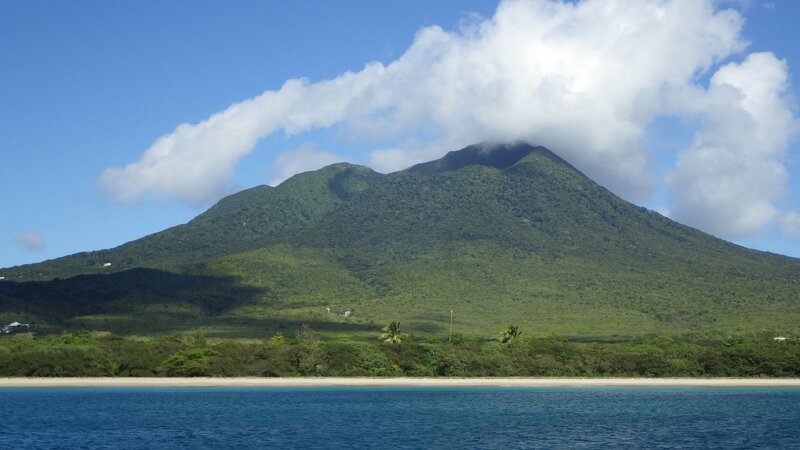 One day we took a day-long rewarding hike to The Quill, a 1970 ft dormant volcano towering over the St. Estatius island. 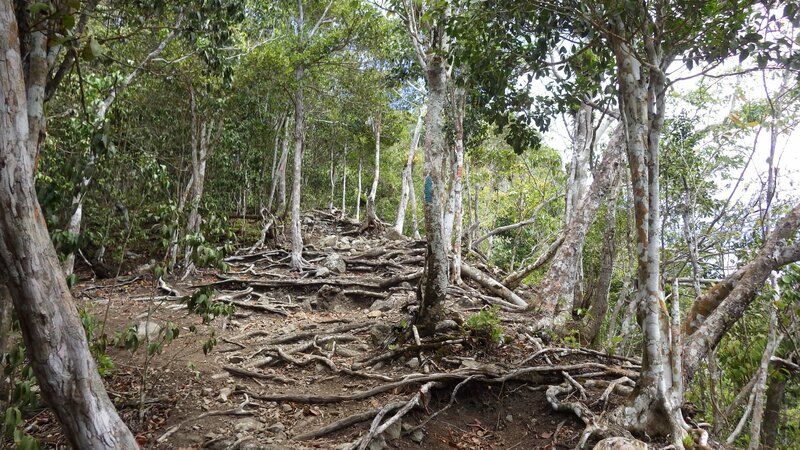 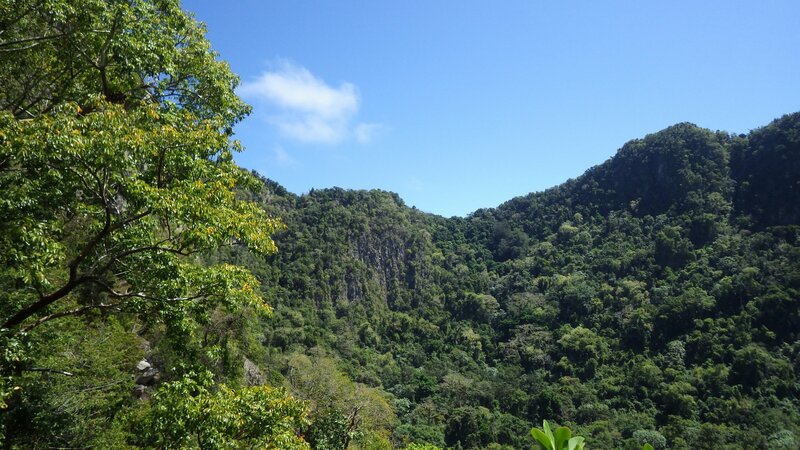 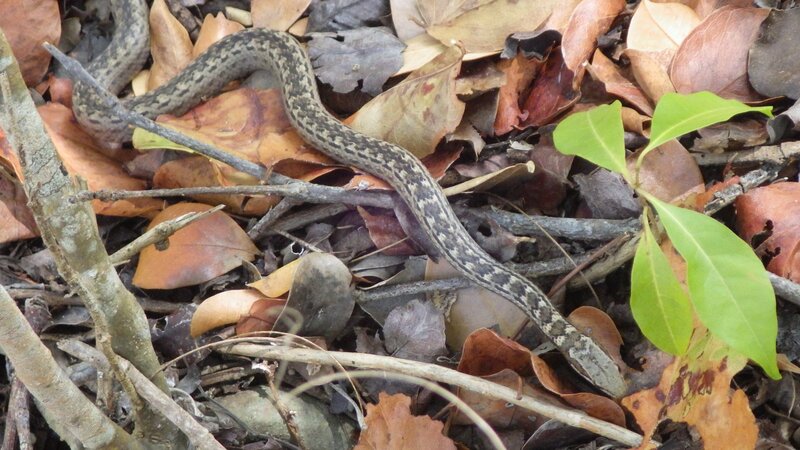 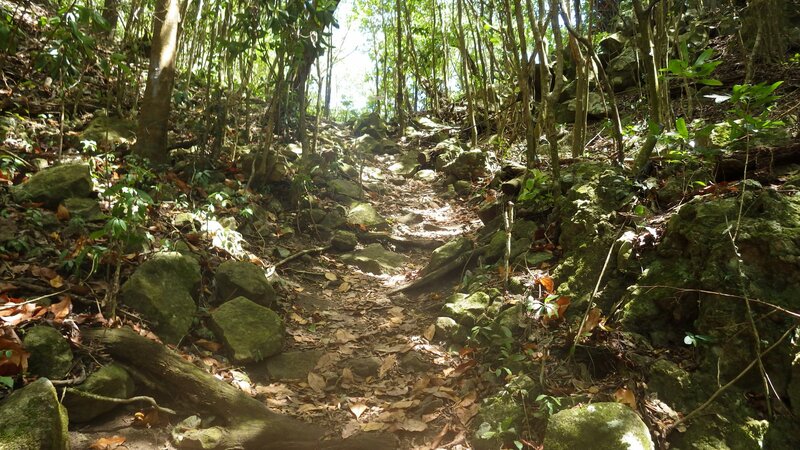 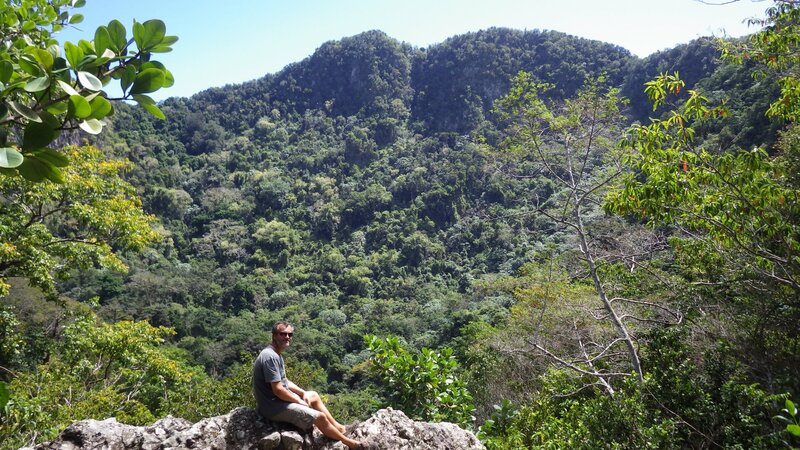 It was part uphill hike and part climb over the rocks in the jungle forest. 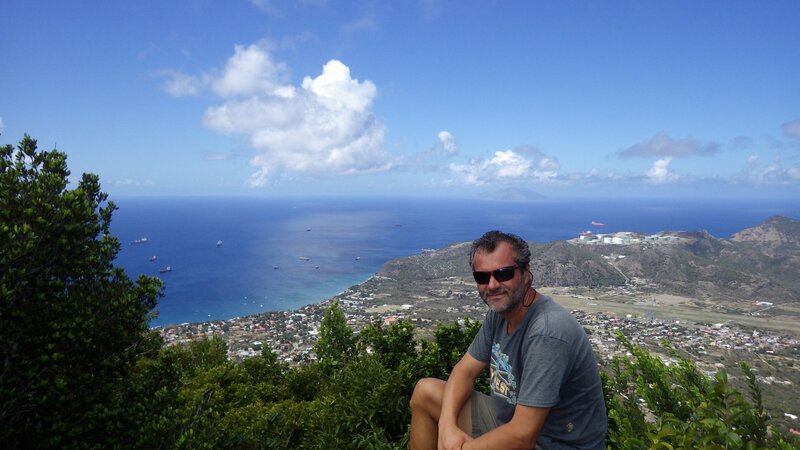 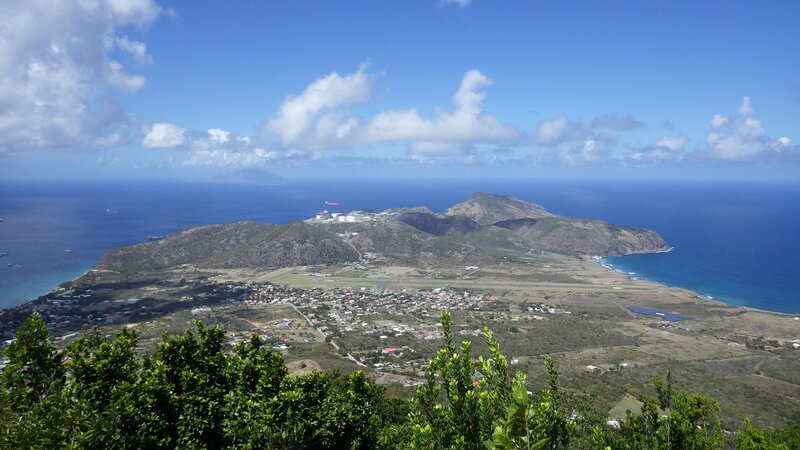 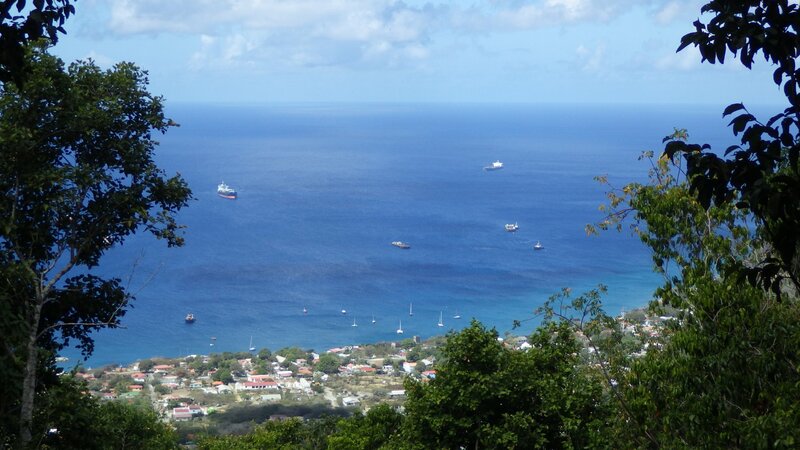 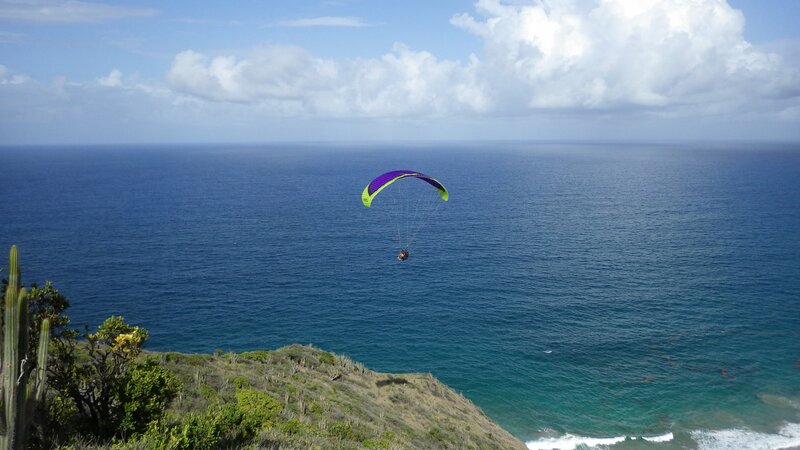 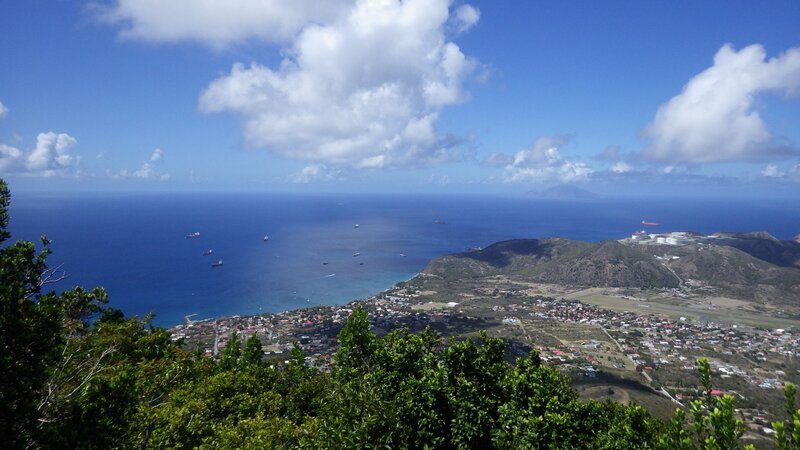 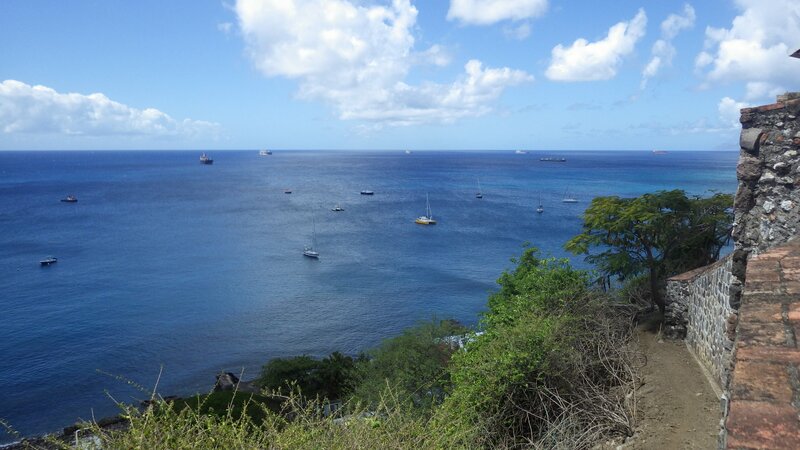 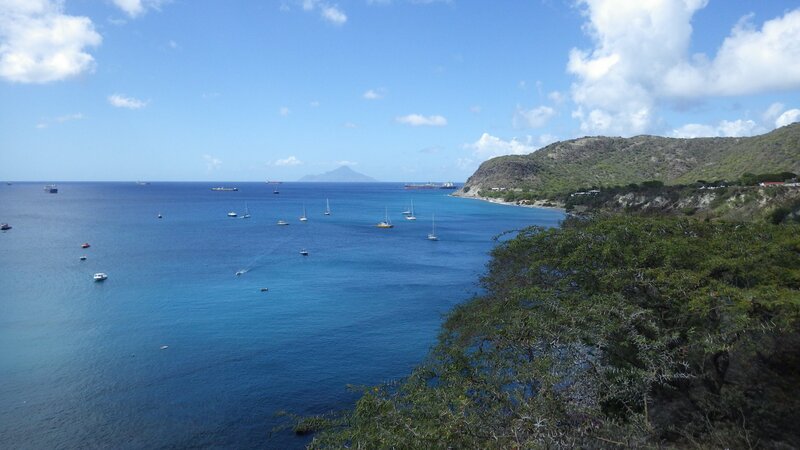 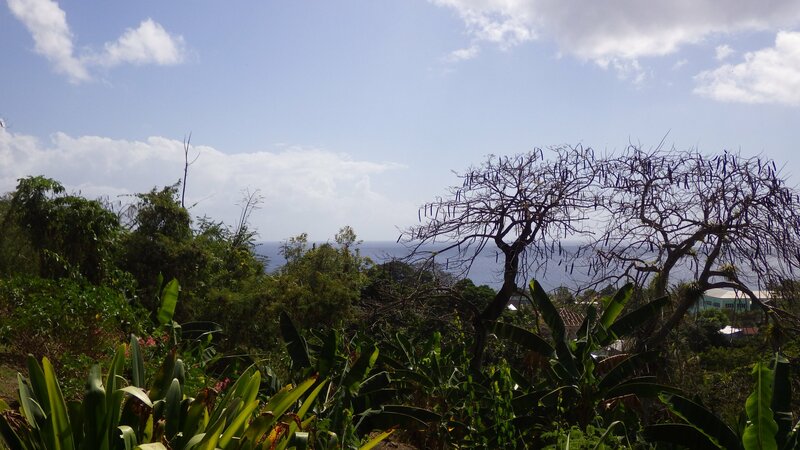 The panoramic views of Statia, surrounding islands and crater bottom from the rim are gorgeous. 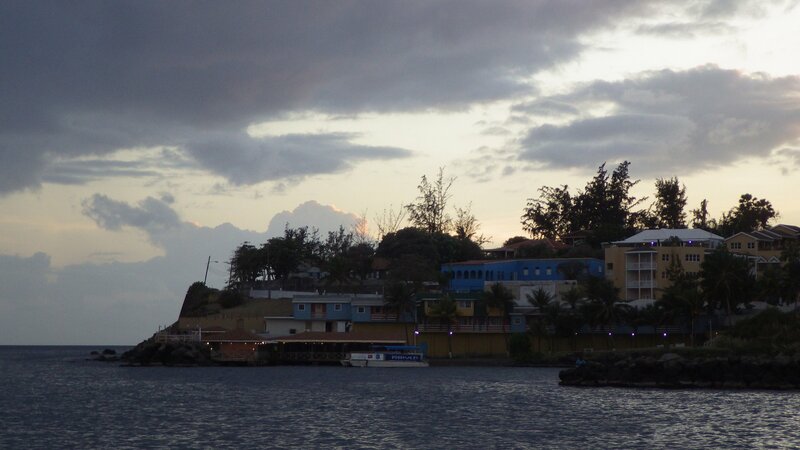 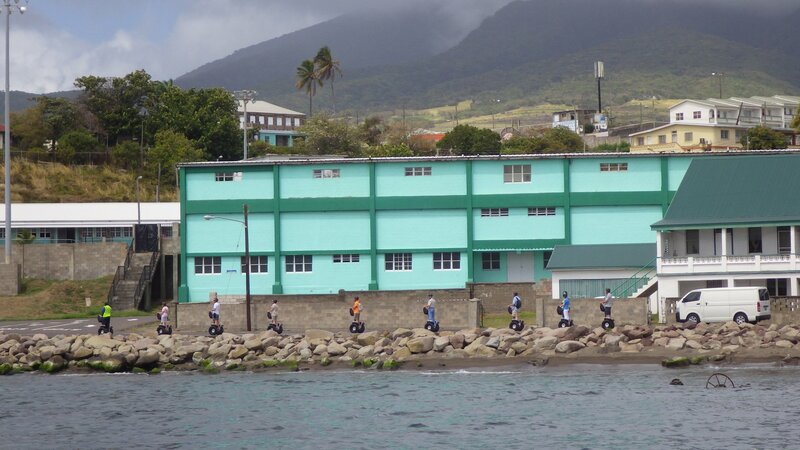 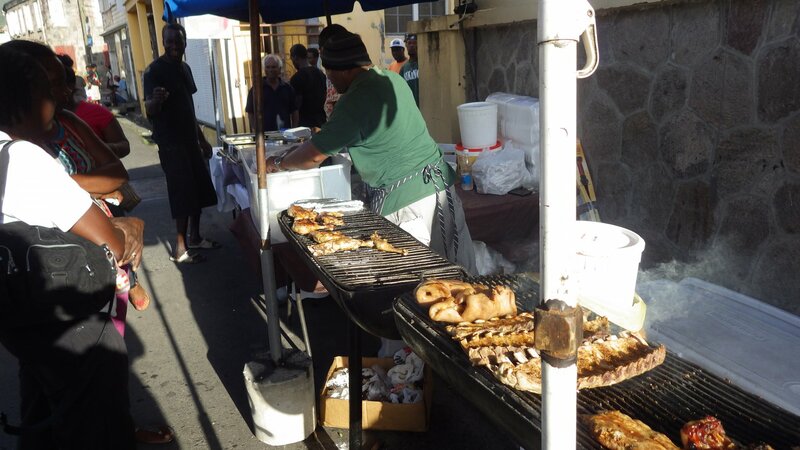 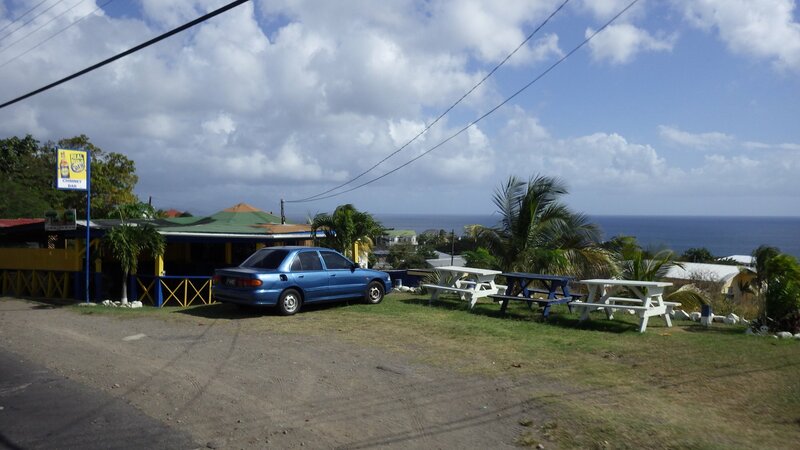 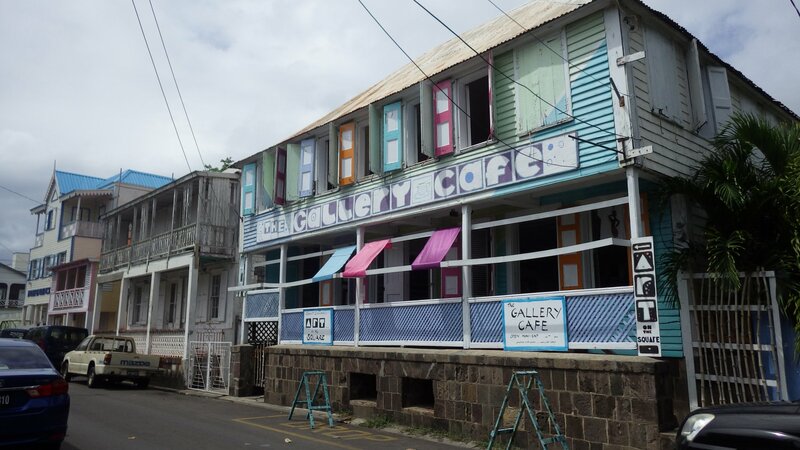 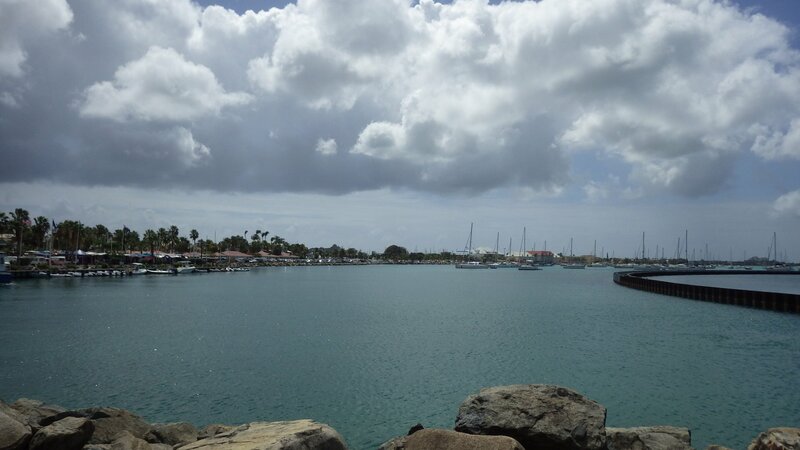 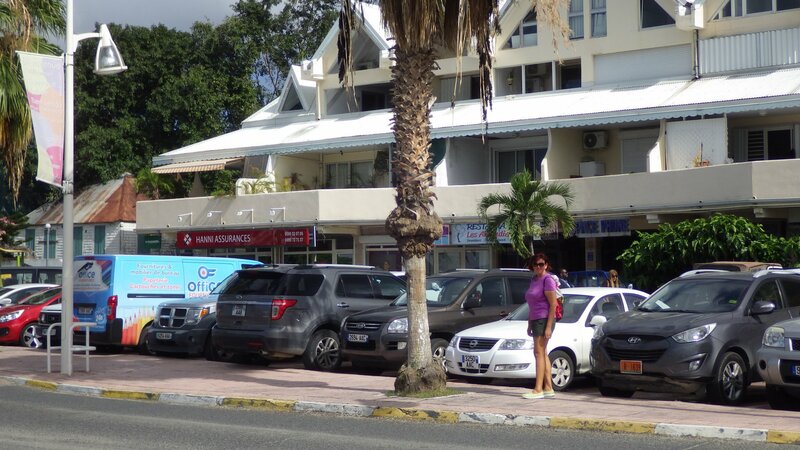 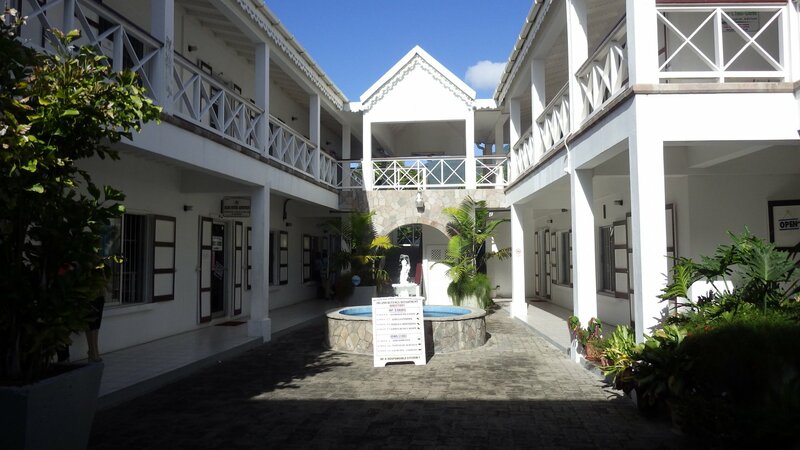 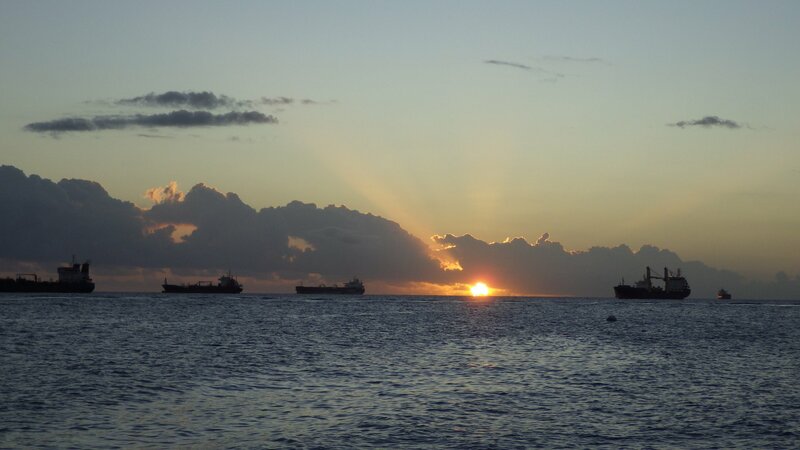 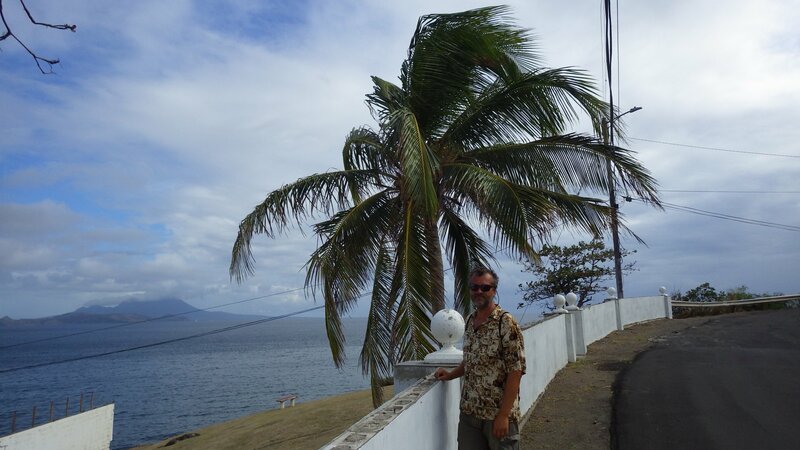 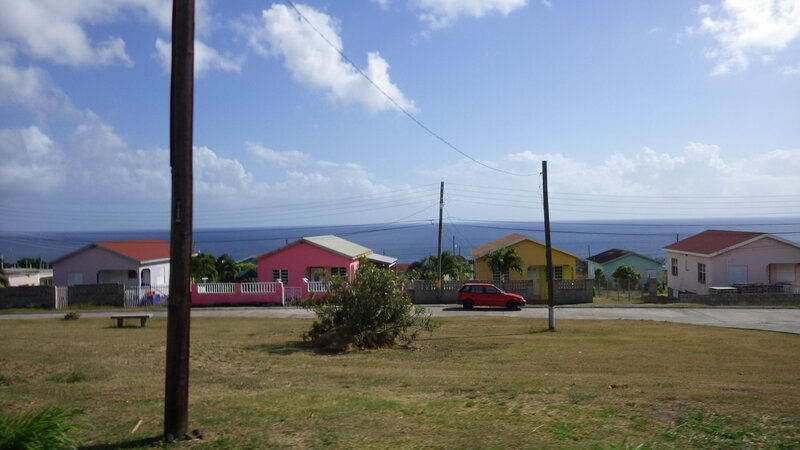 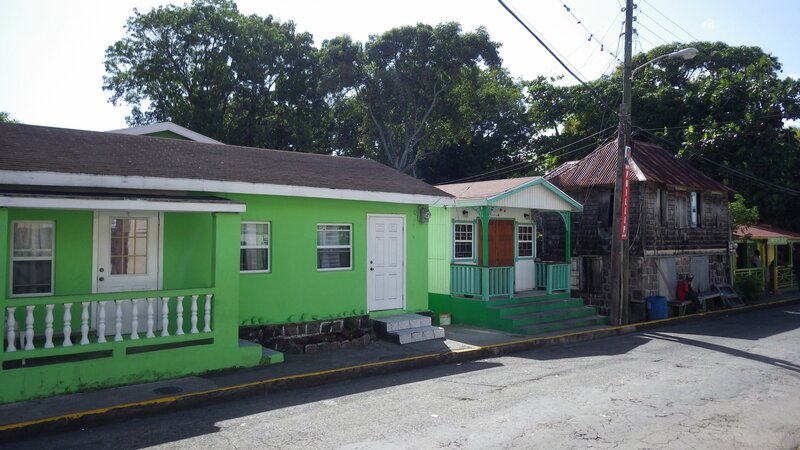 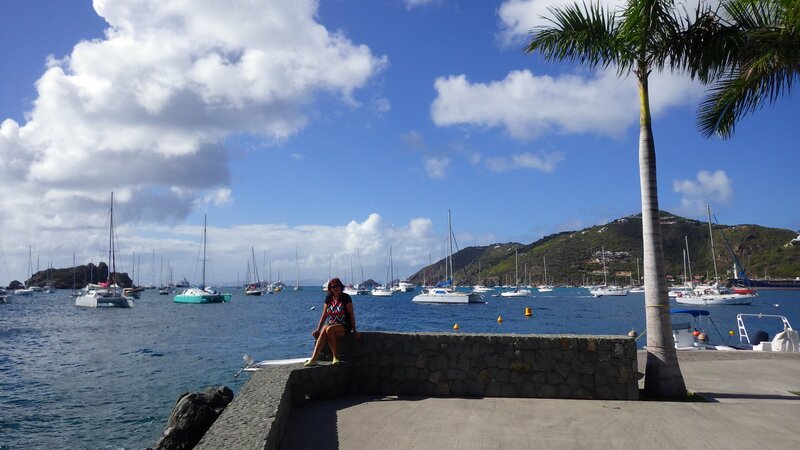 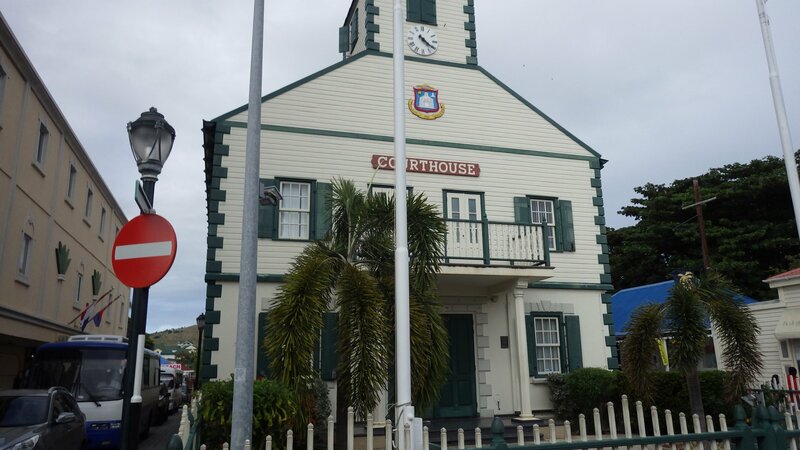 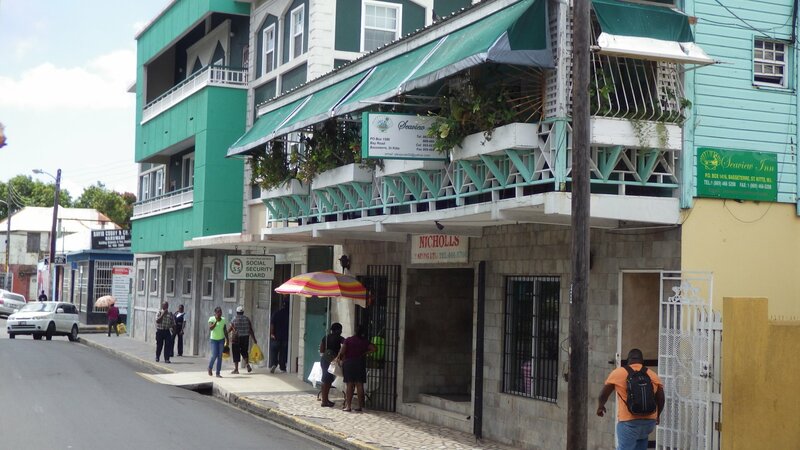 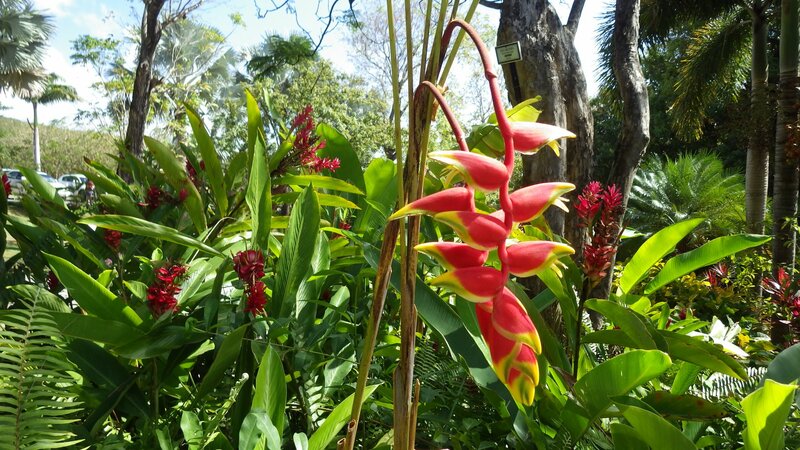 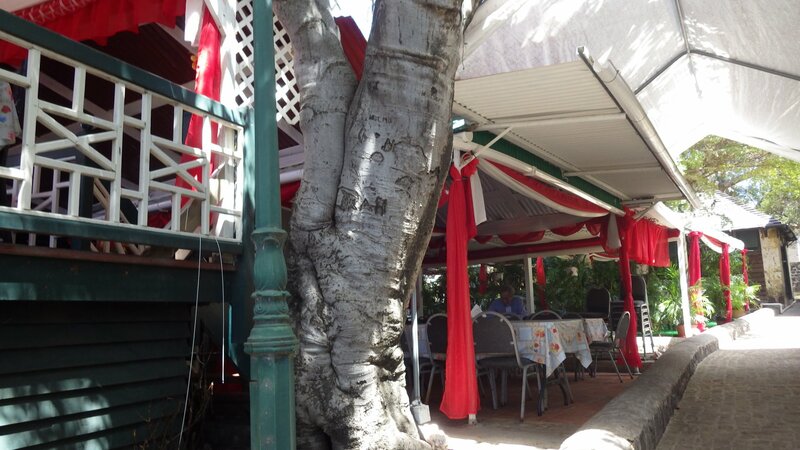 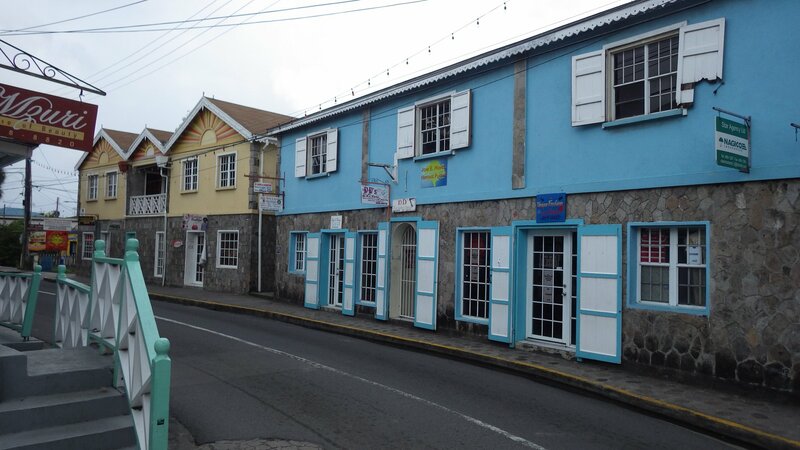 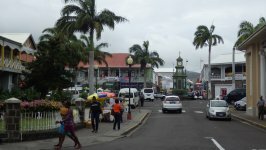 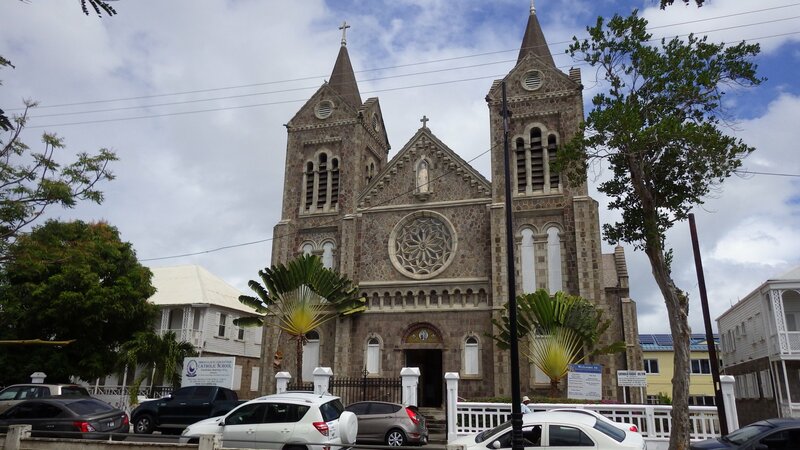 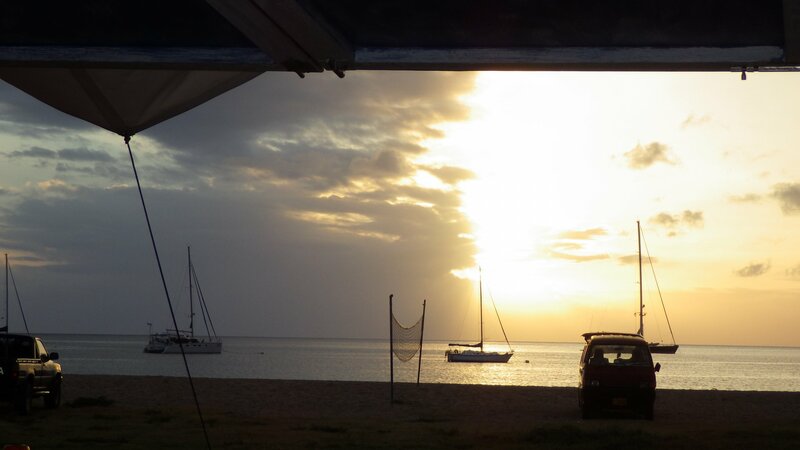 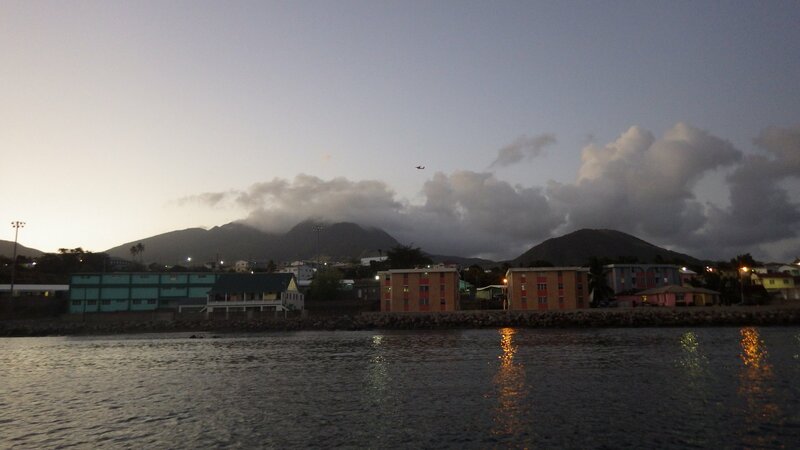 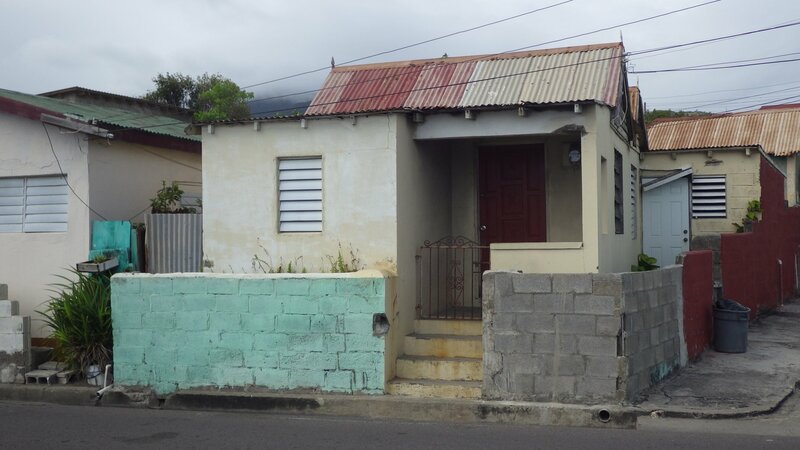 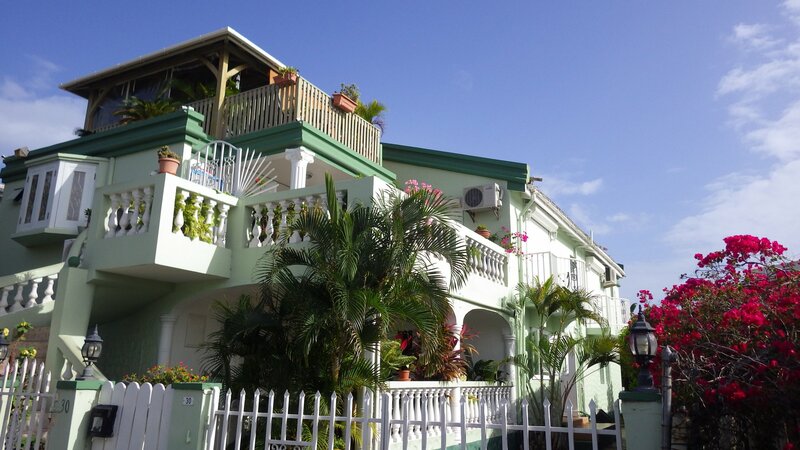 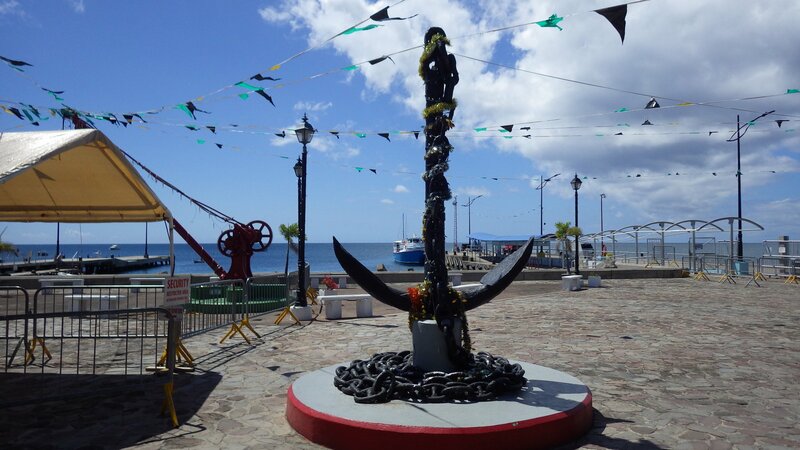 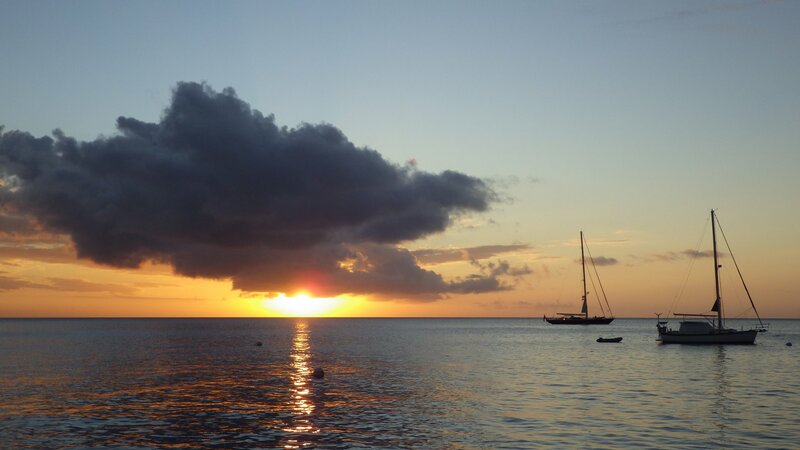 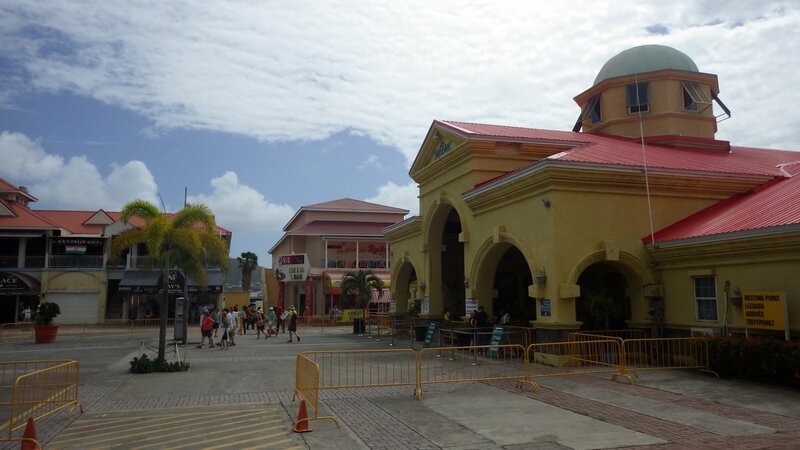 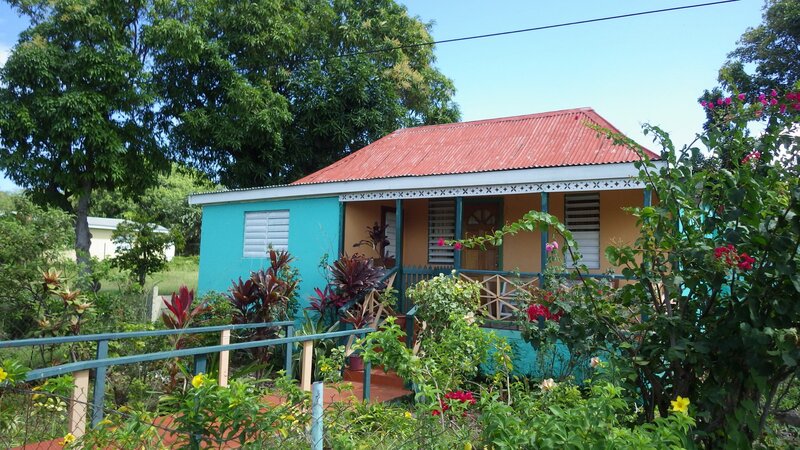 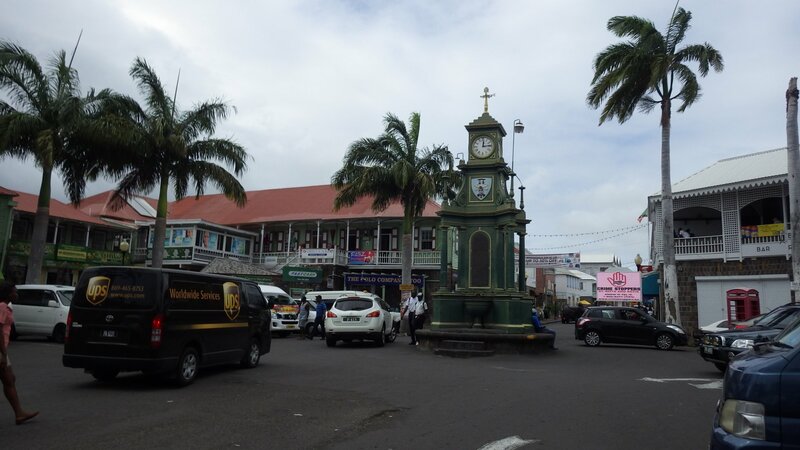 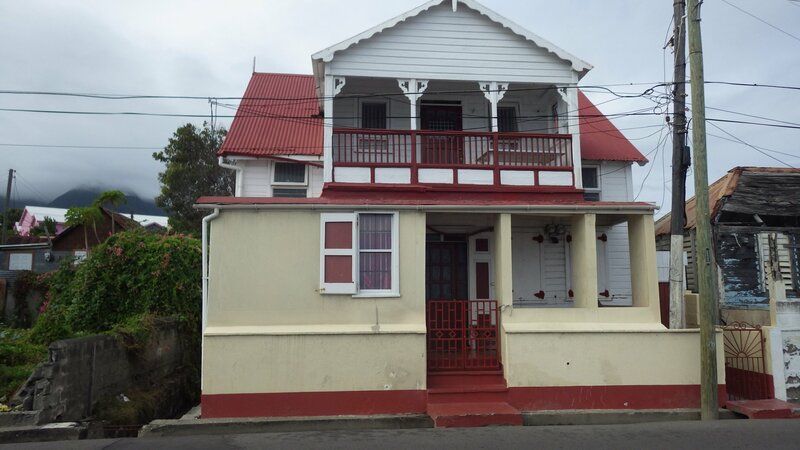 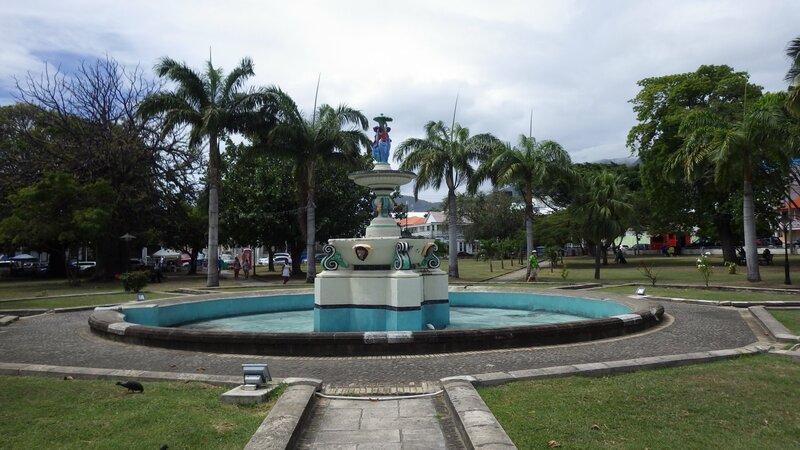 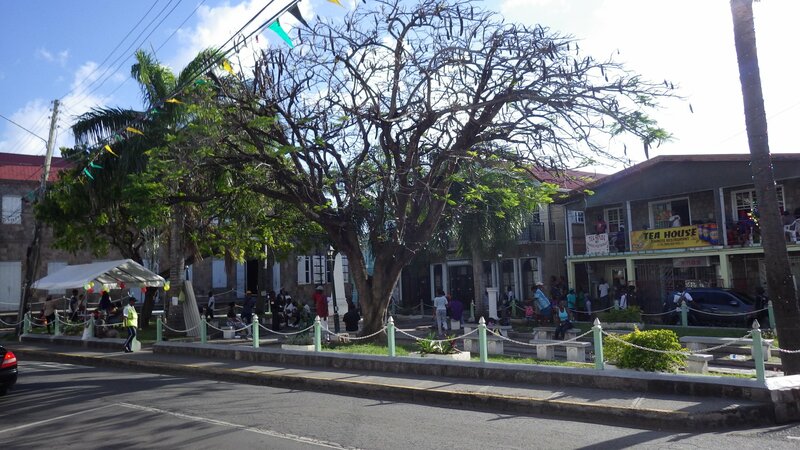 We stayed couple days in Basseterre. 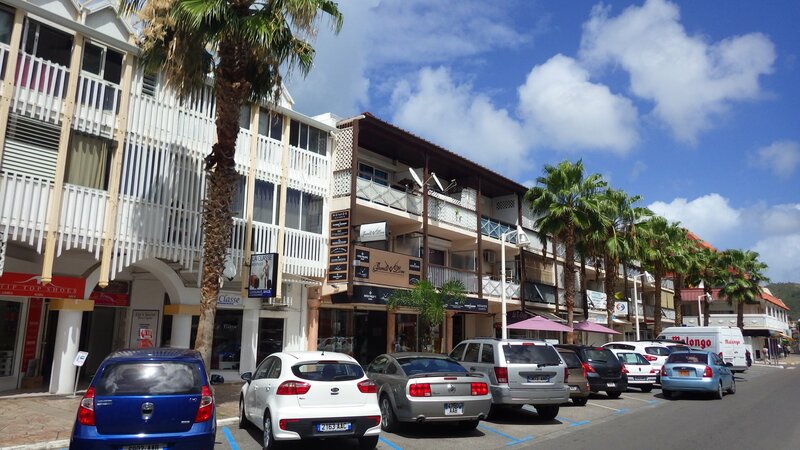 Its tourist's section, Port Zante, is basically a big shopping mall for the cruiseship crowd just at the pier. 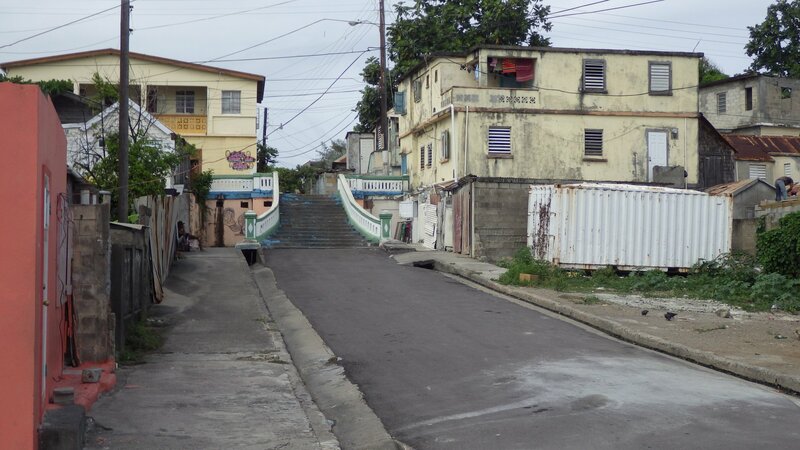 Step outside, and you are in a low key, somewhat run down town where locals live their lives. 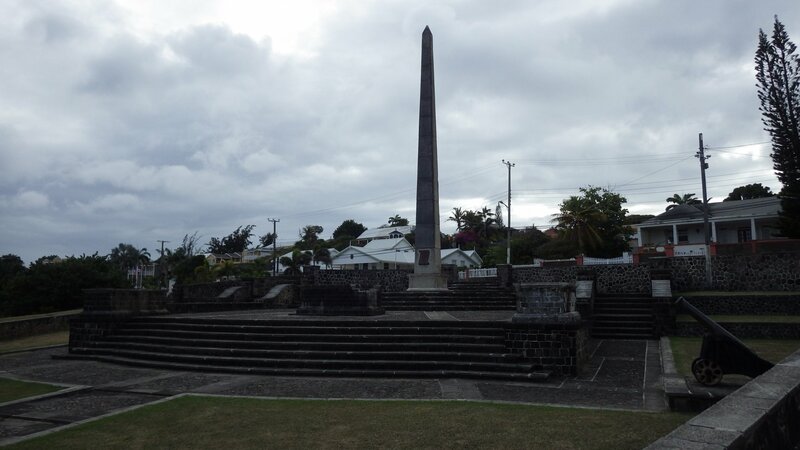 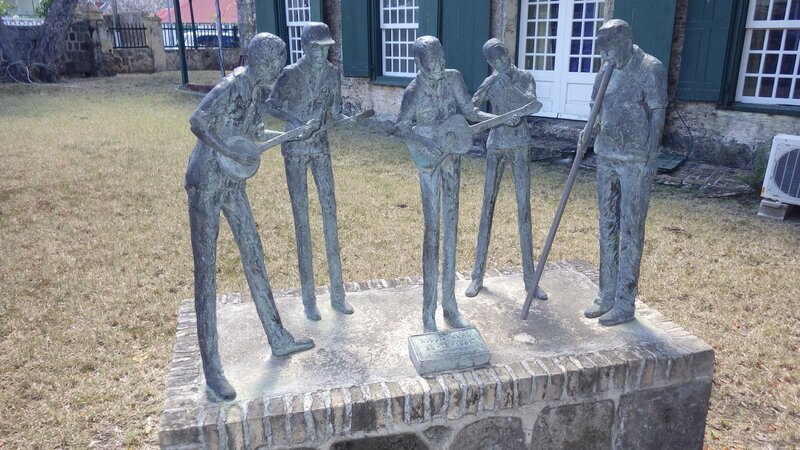 There are few historical places which are interesting. 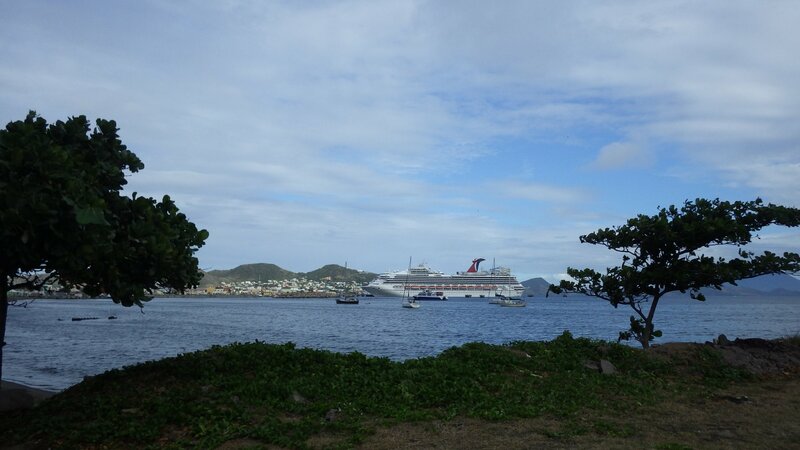 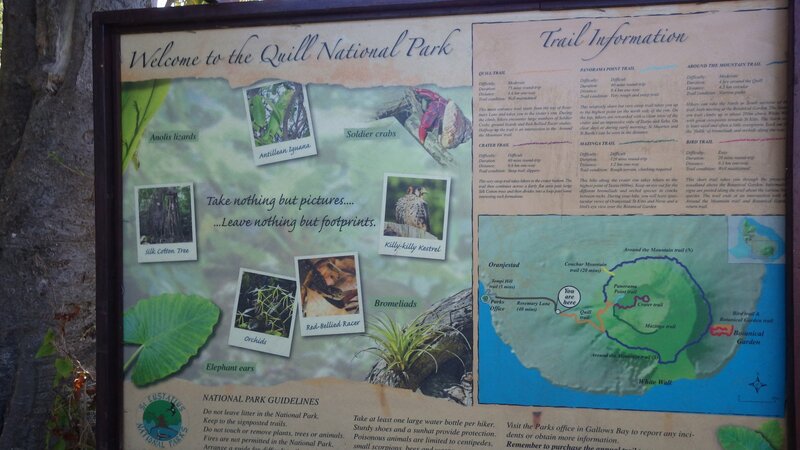 One day we took an excursion around the island. 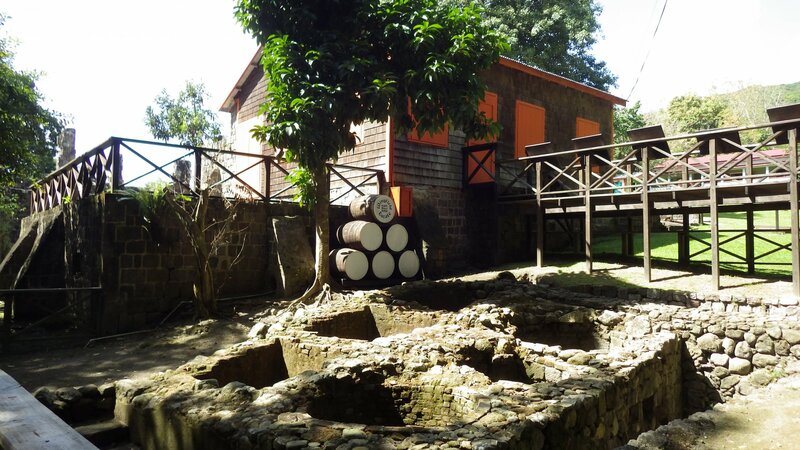 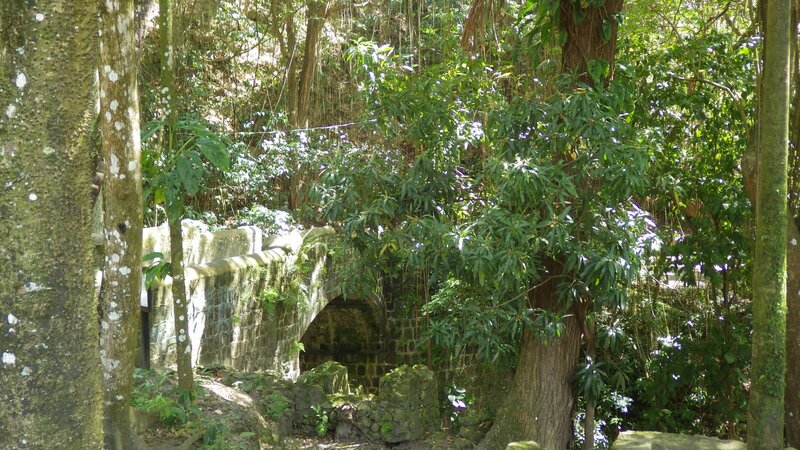 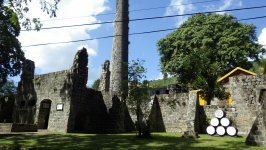 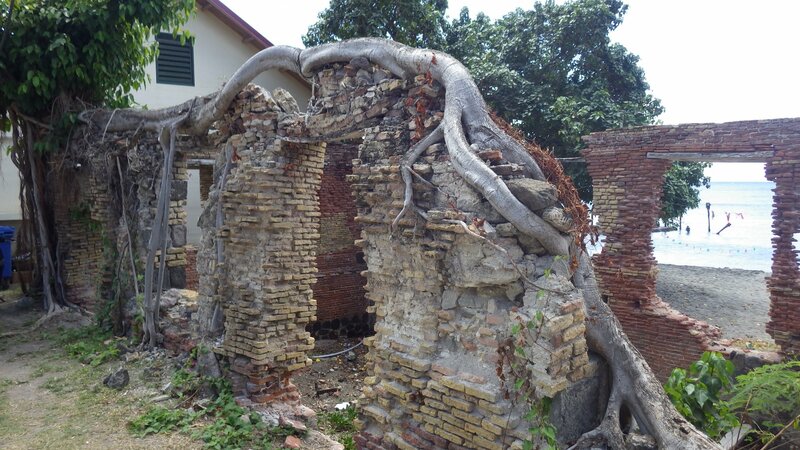 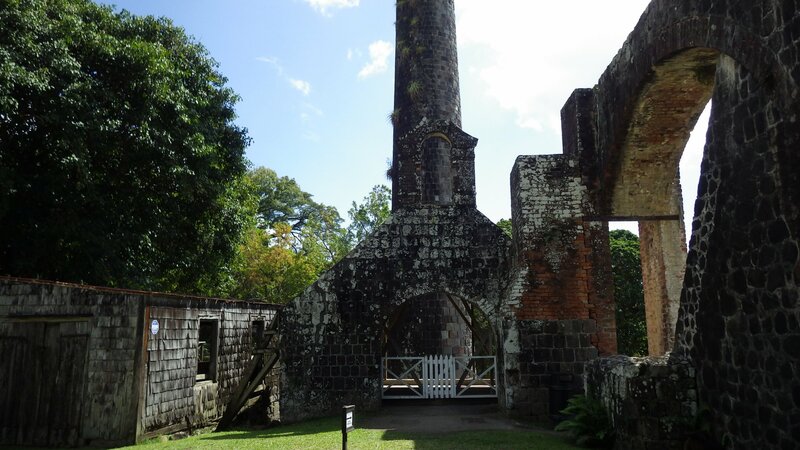 There are lots of old sugar mill ruins - some turned into hotels or estates, some restored into historical sites, and some just left there. 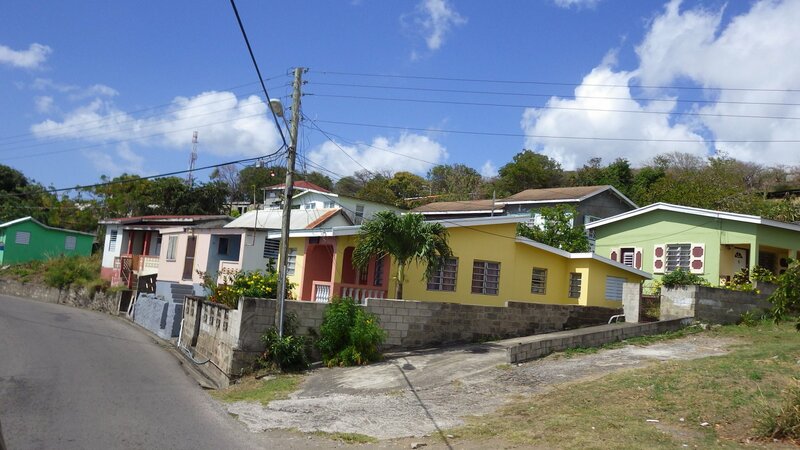 Small unassuming villages dot the road. 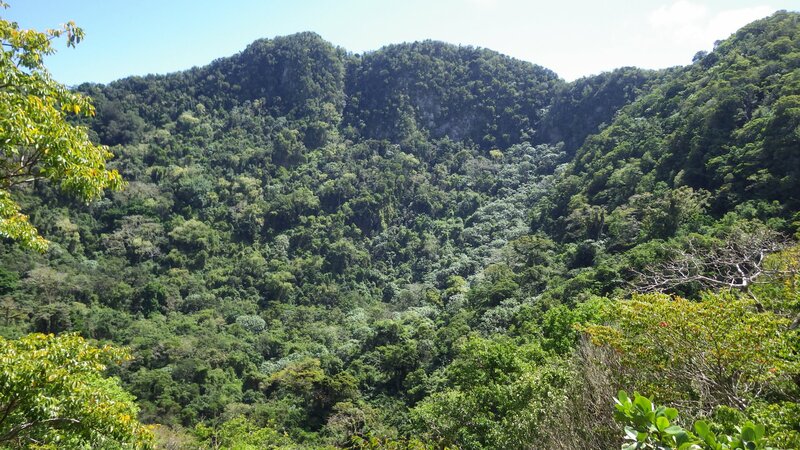 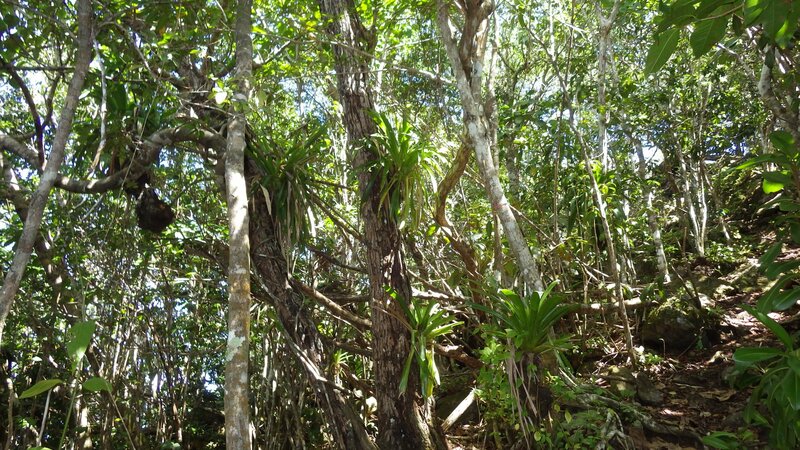 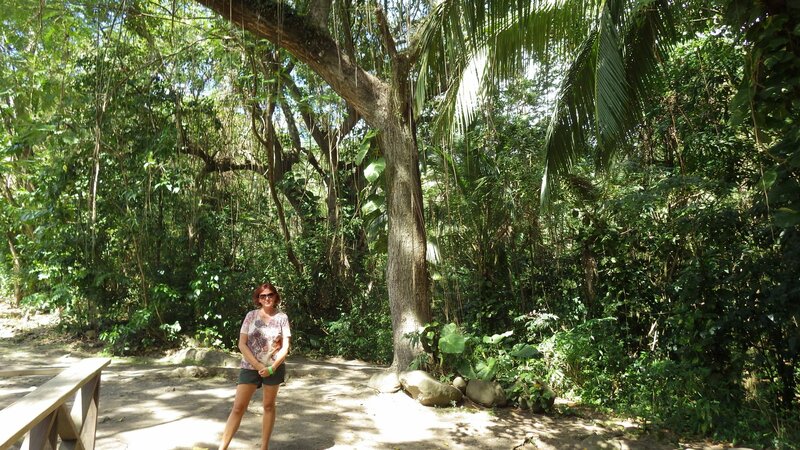 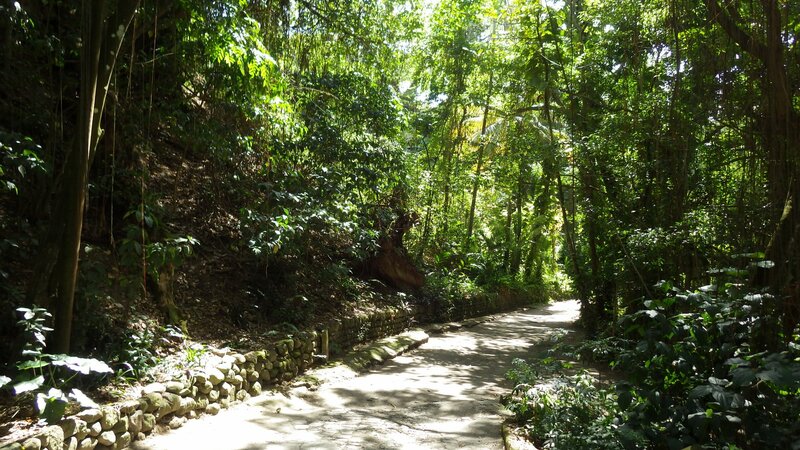 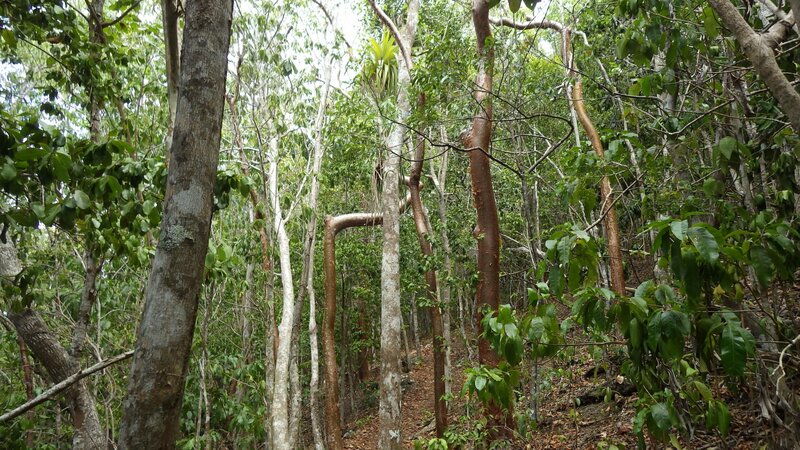 The lush tropical forest in the mountains with large trees is impressive. 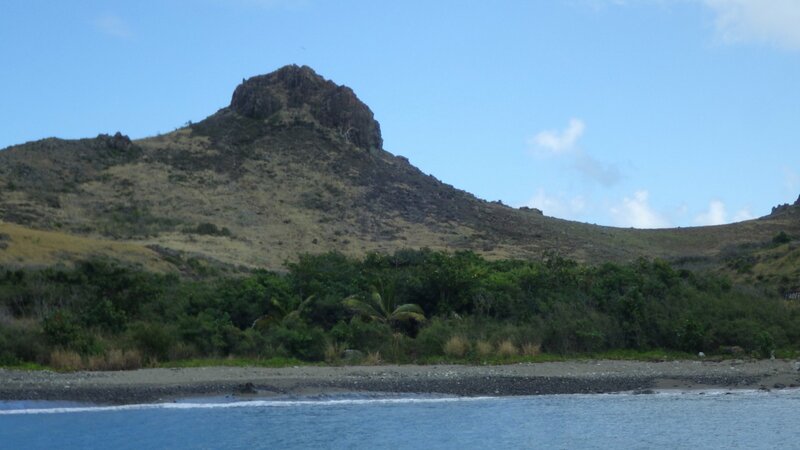 One of our stops was at the high peak near Frigate Bay. 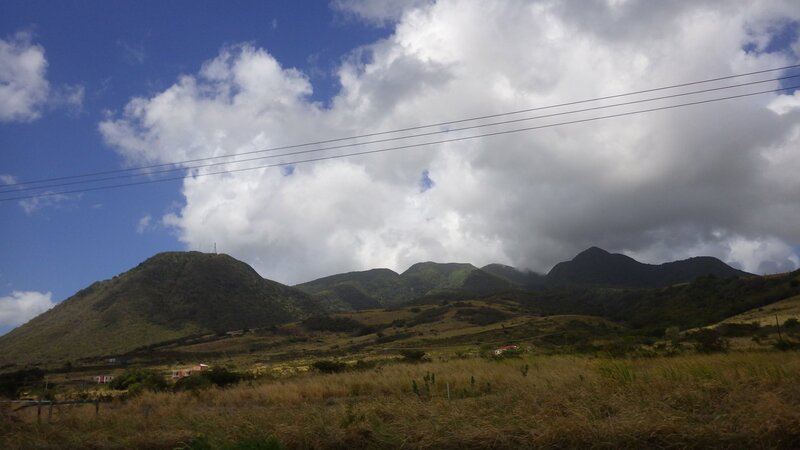 The views from there were quite something you don't see every day. 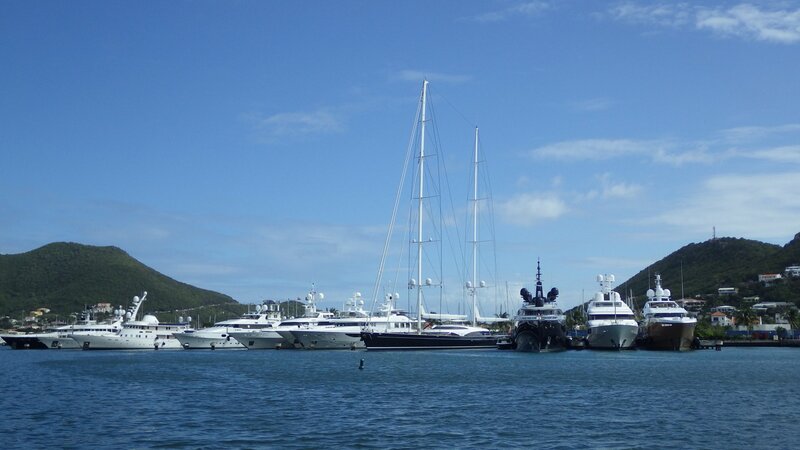 There seem to be lot of new luxury developments in that area. 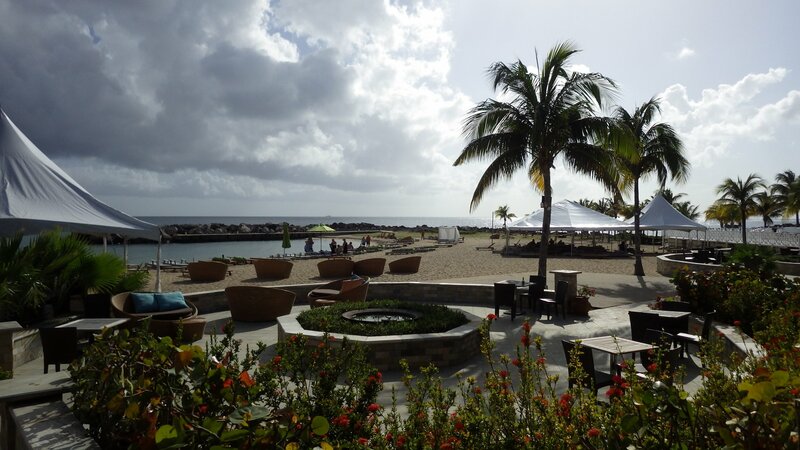 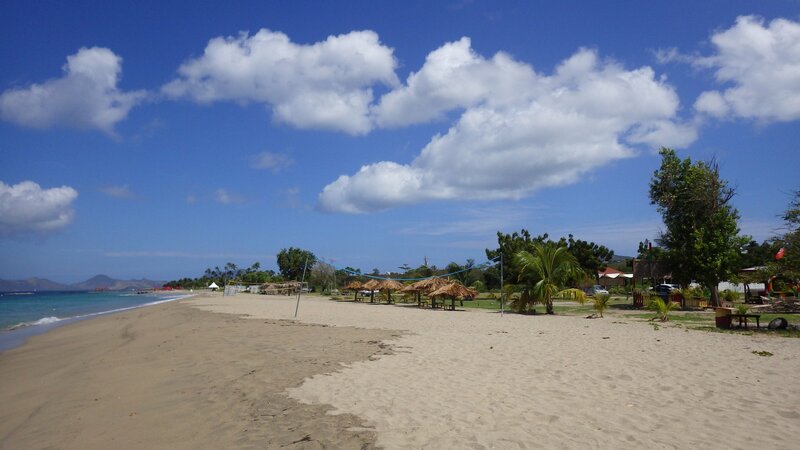 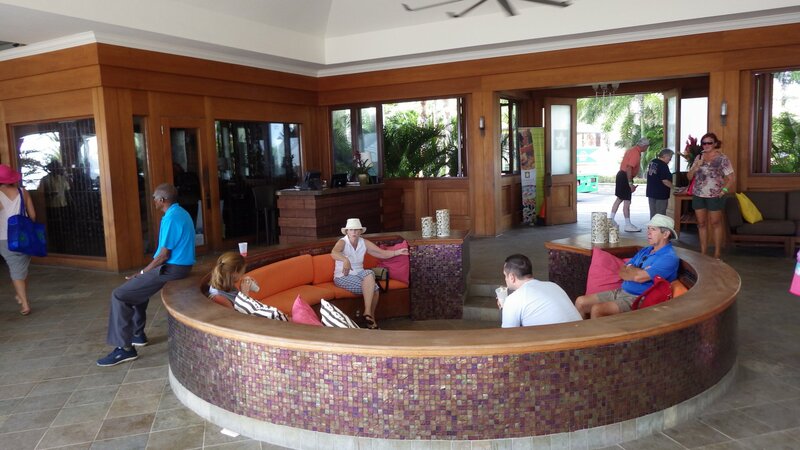 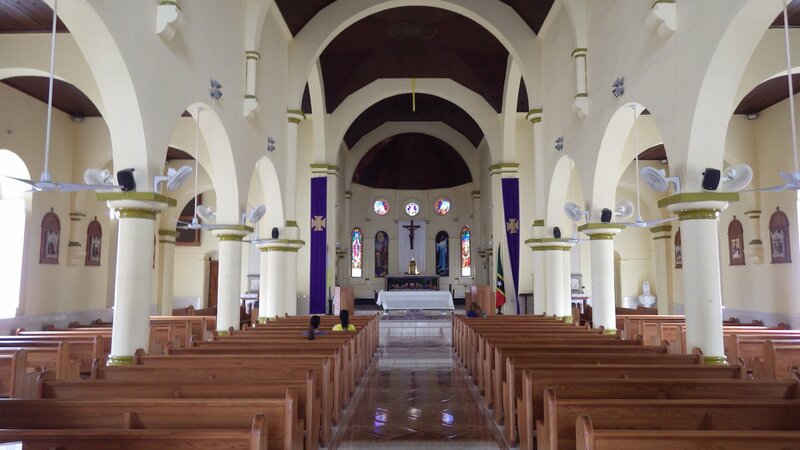 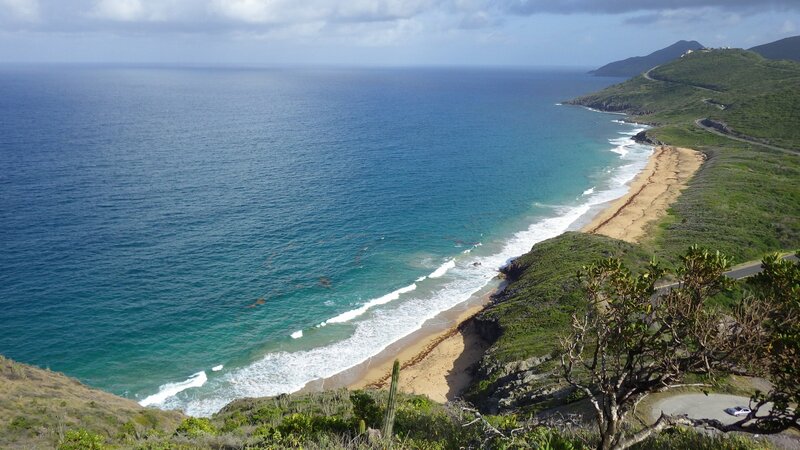 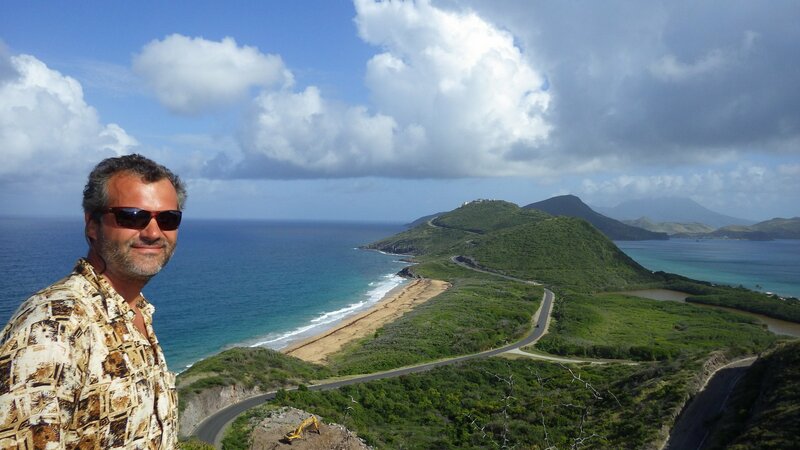 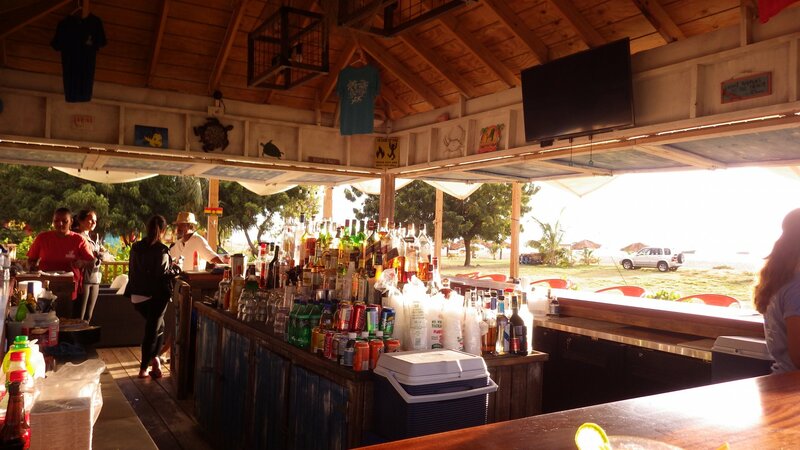 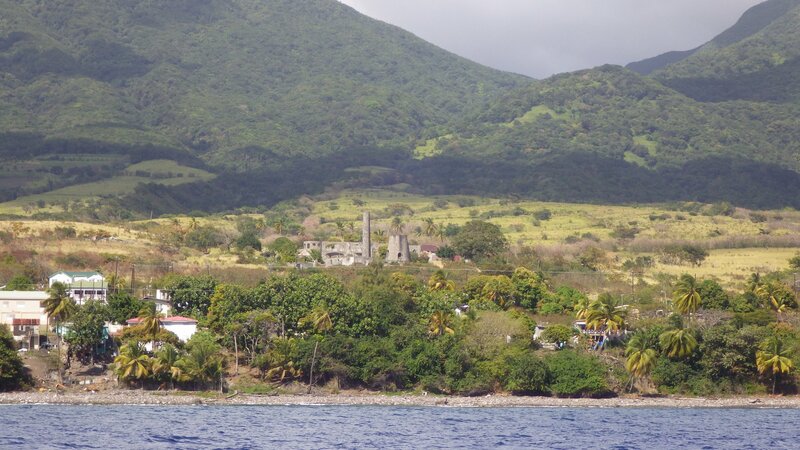 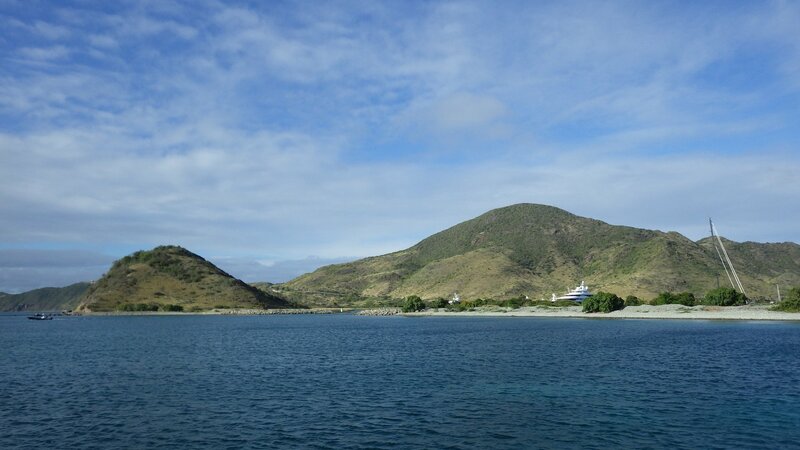 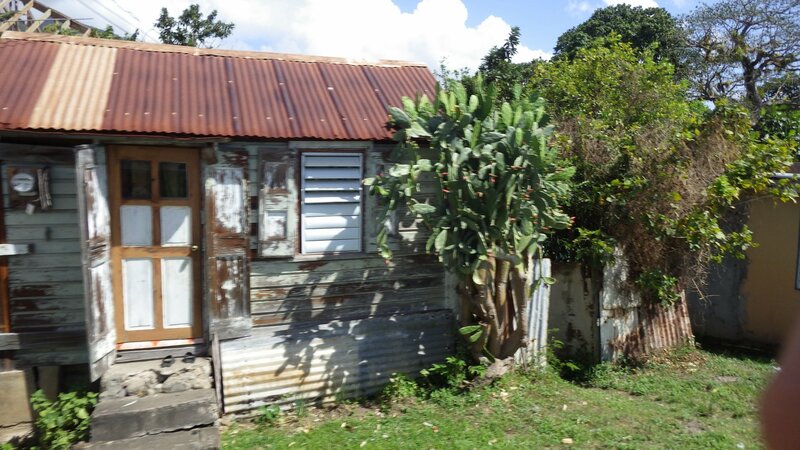 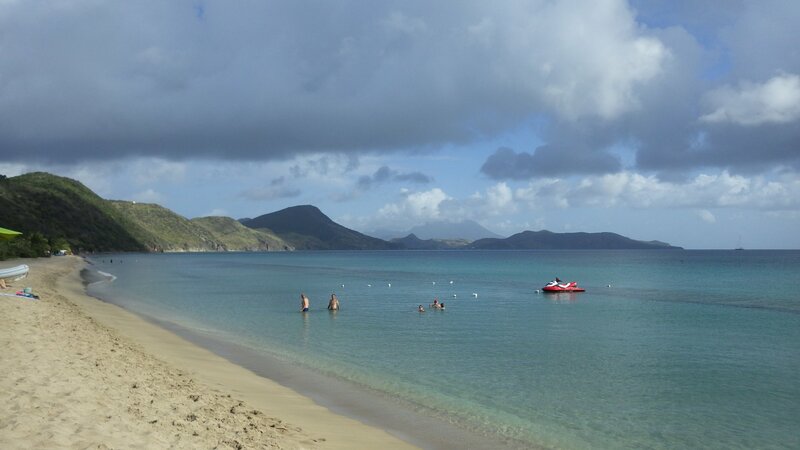 After seeing relatively crowded parts of St. Kitts, we've decided to move into a quieter and secluded place. 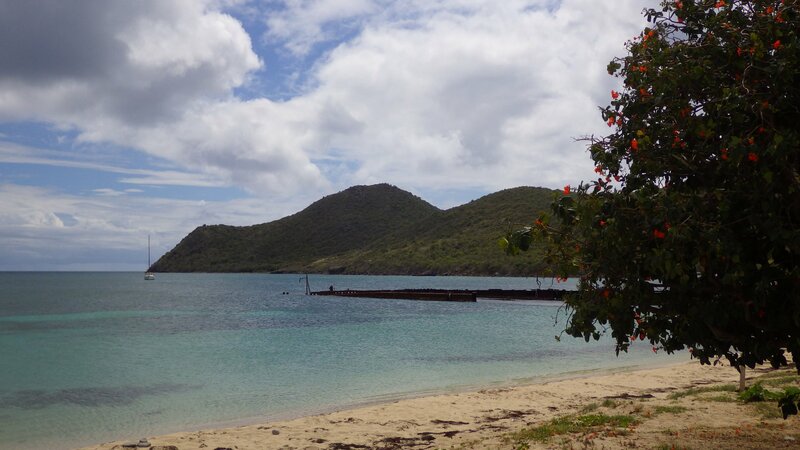 Ballast Bay, on the island's southwest shore, seemed like such a place. 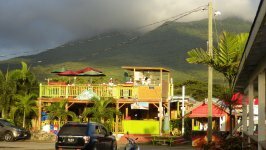 St. Kitts and Nevis are one of those islands which "Brush the Clouds" � high and steep volcanic mountains, surrounded by deep water. 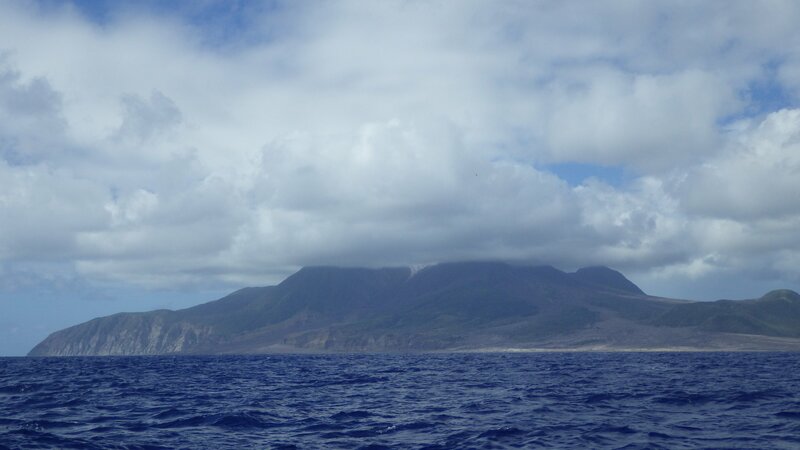 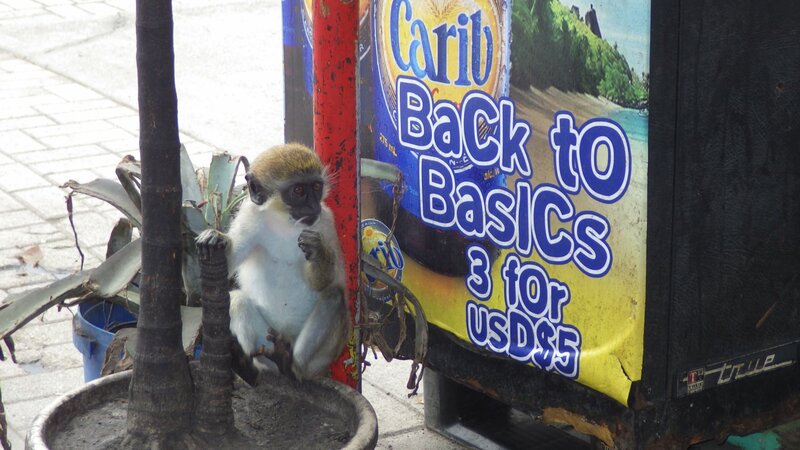 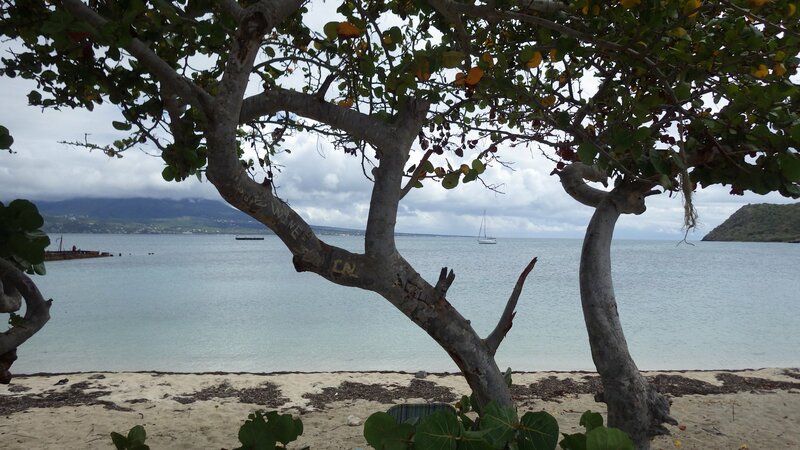 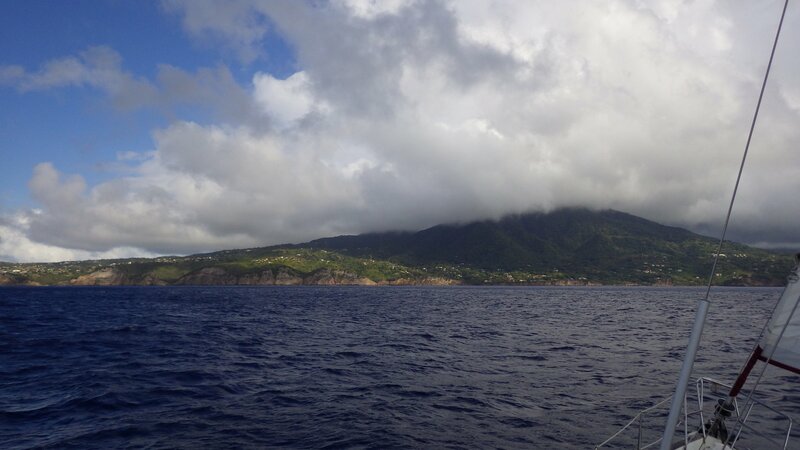 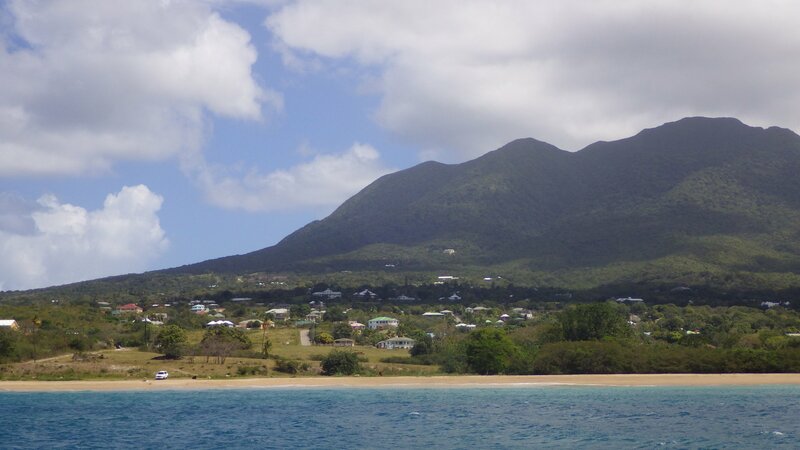 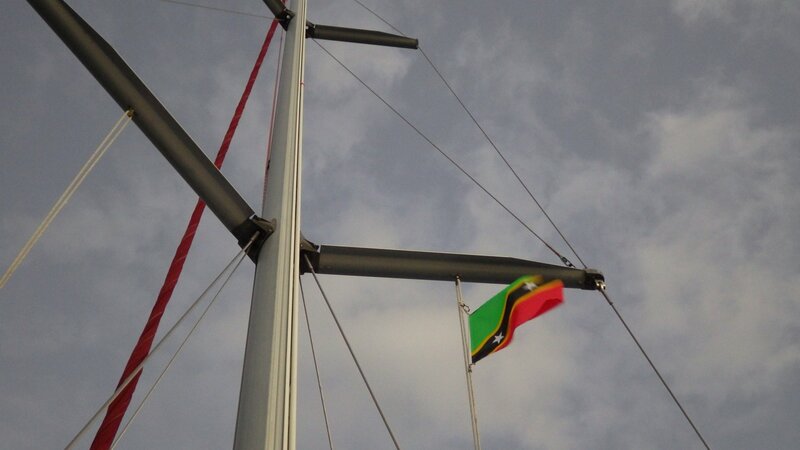 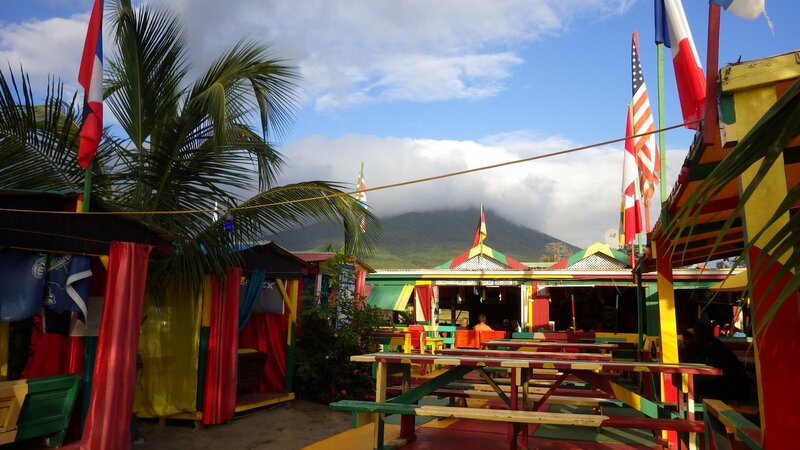 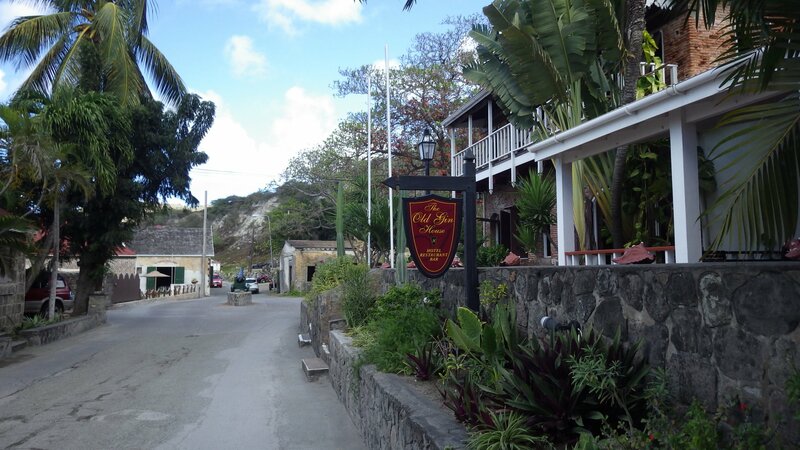 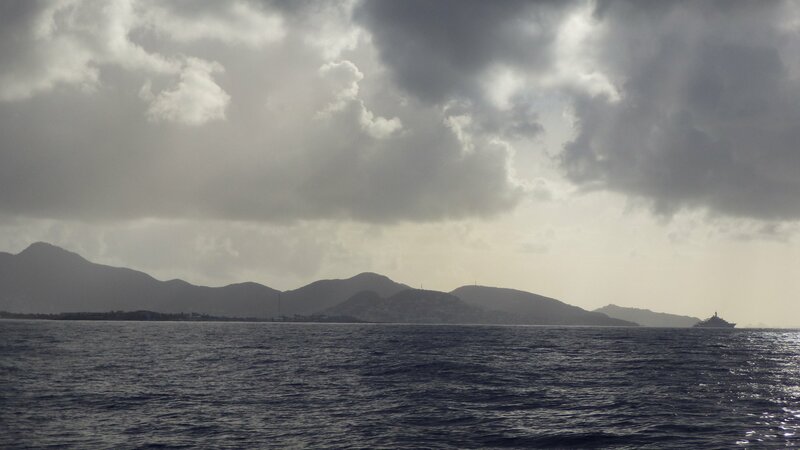 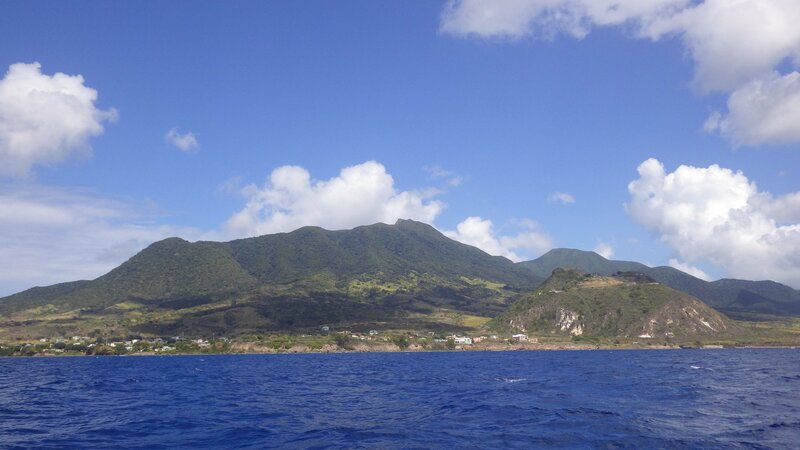 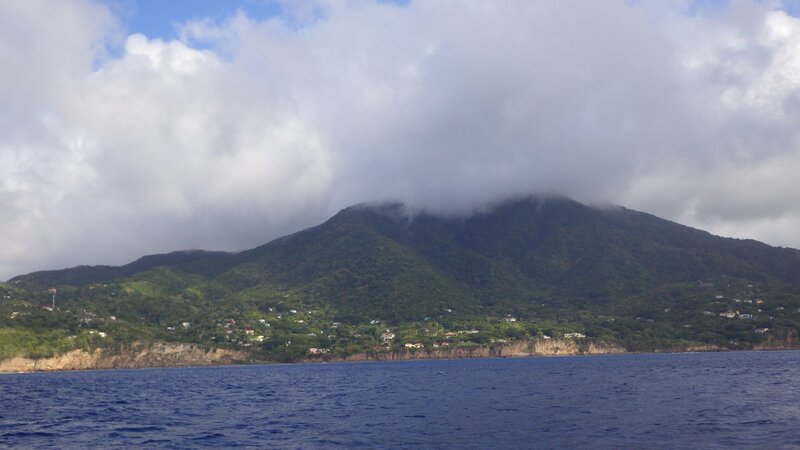 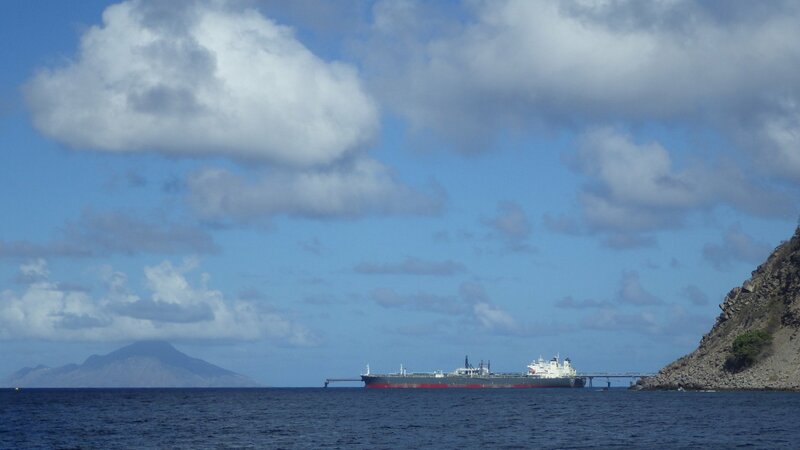 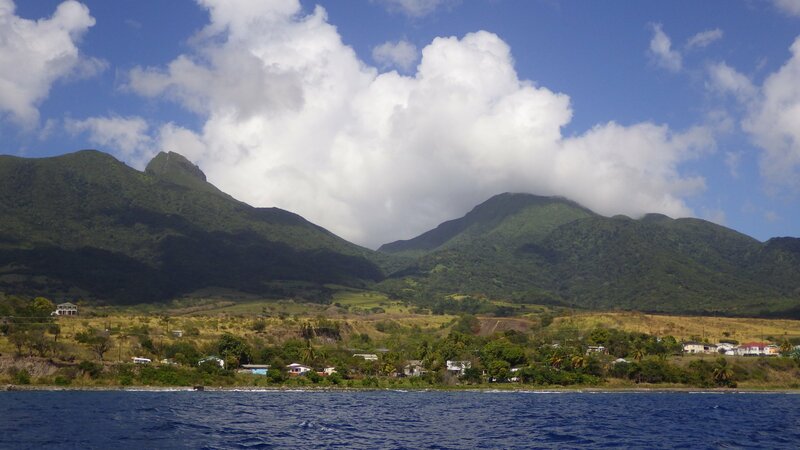 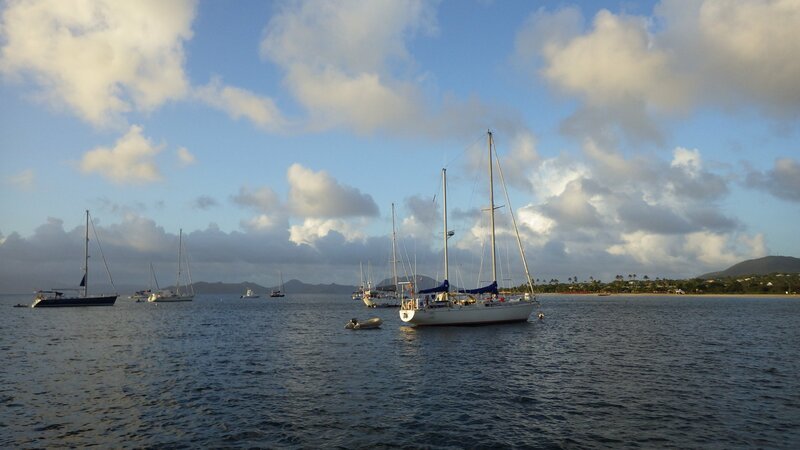 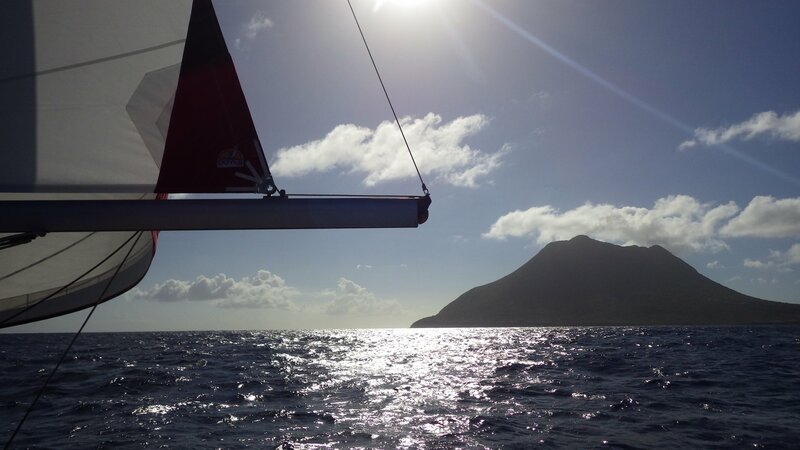 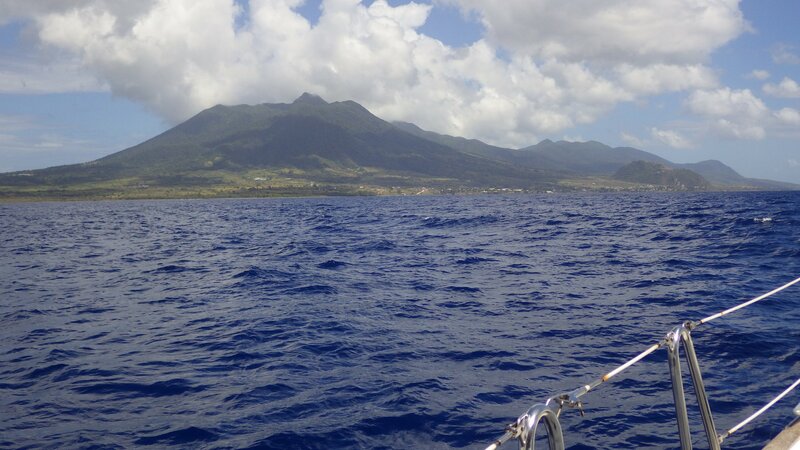 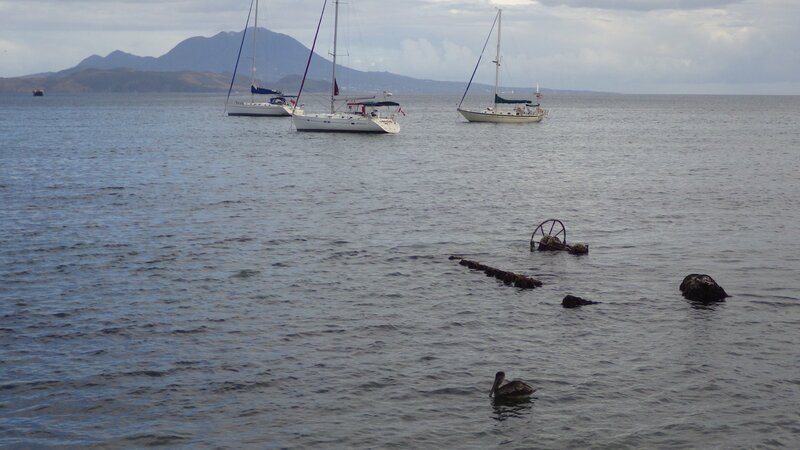 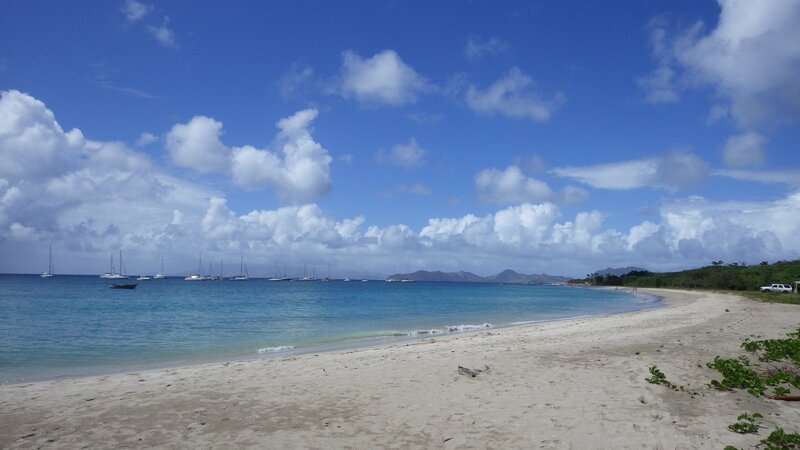 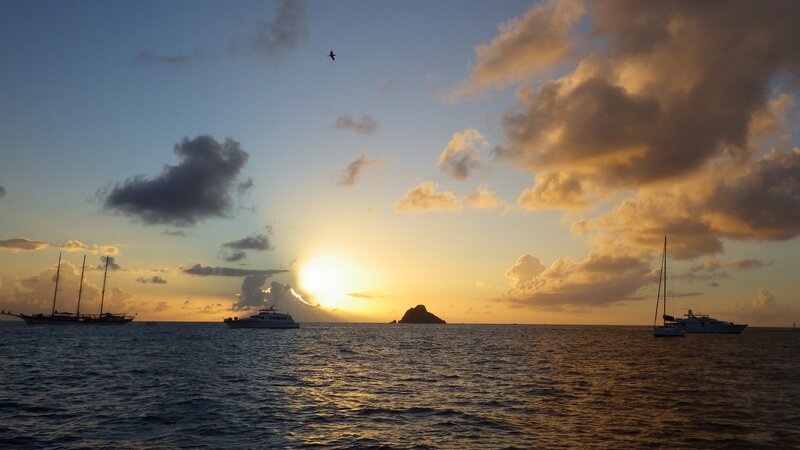 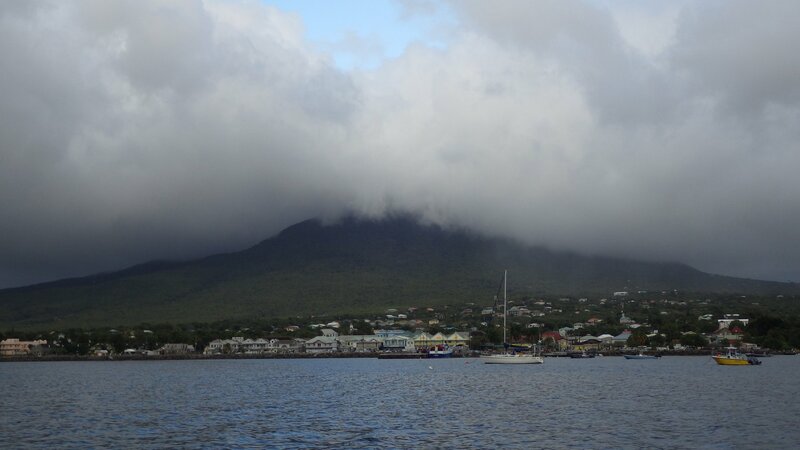 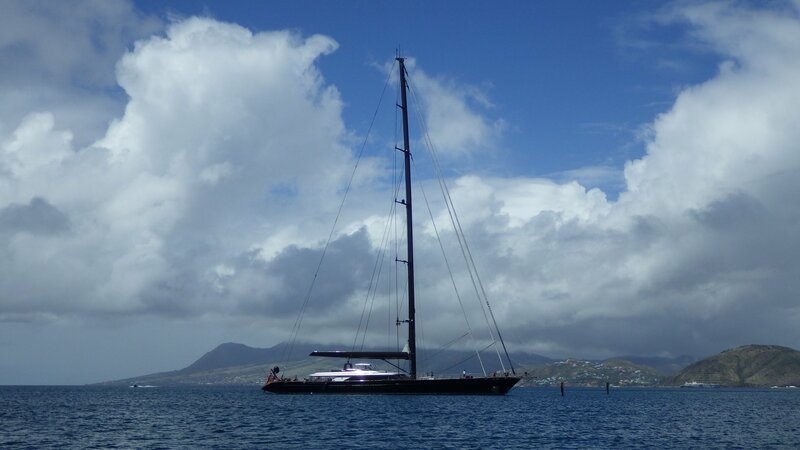 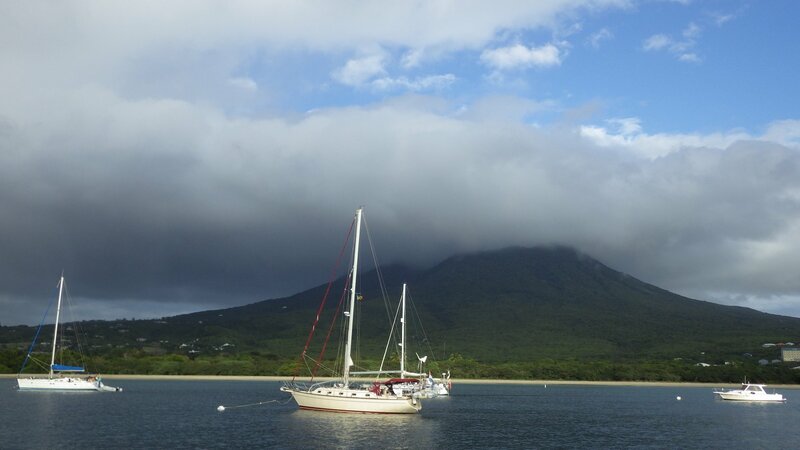 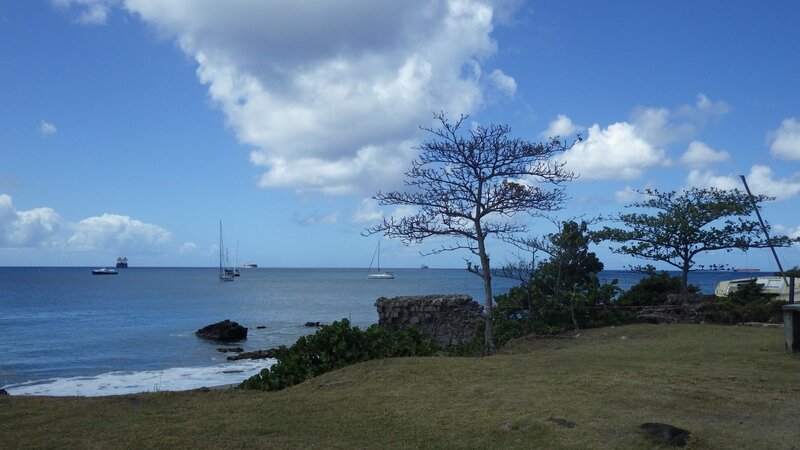 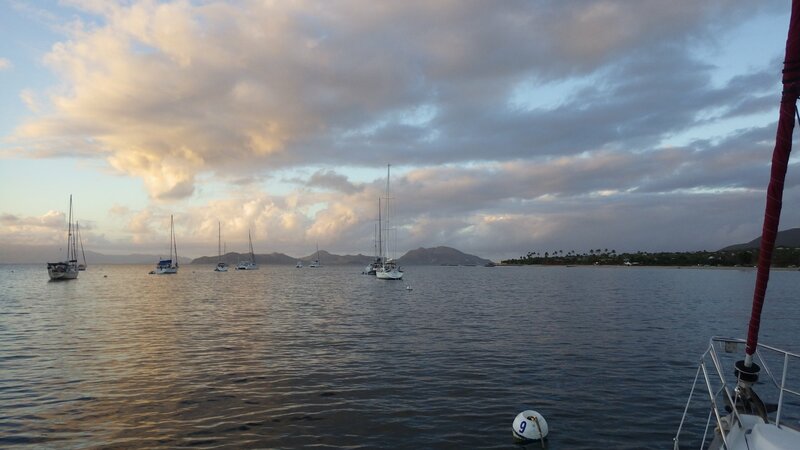 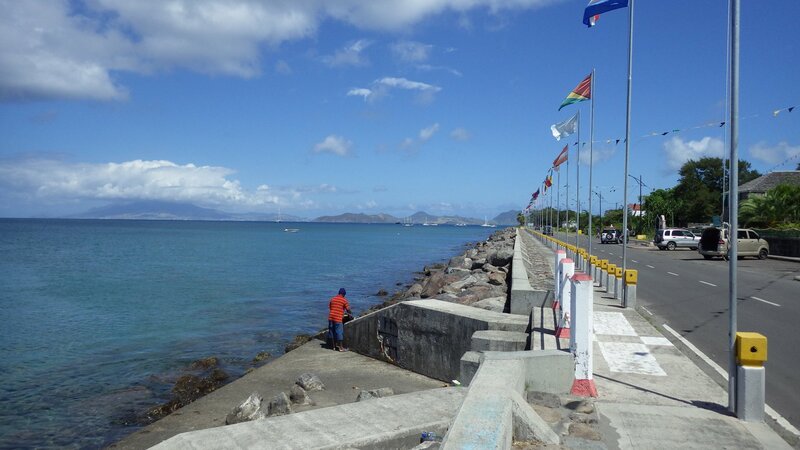 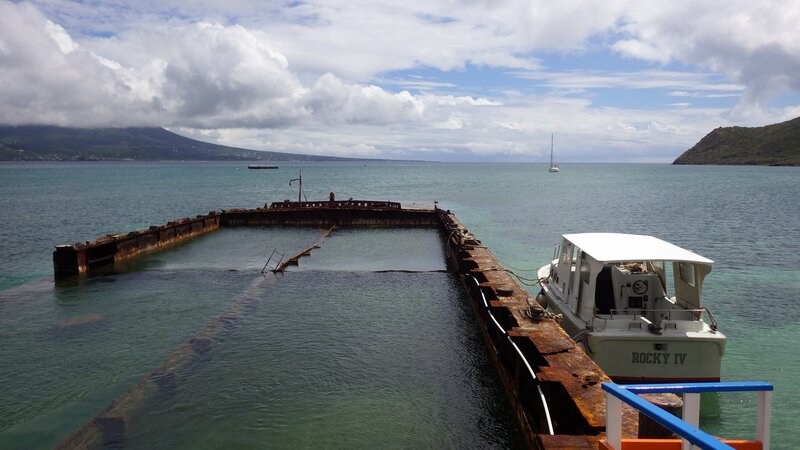 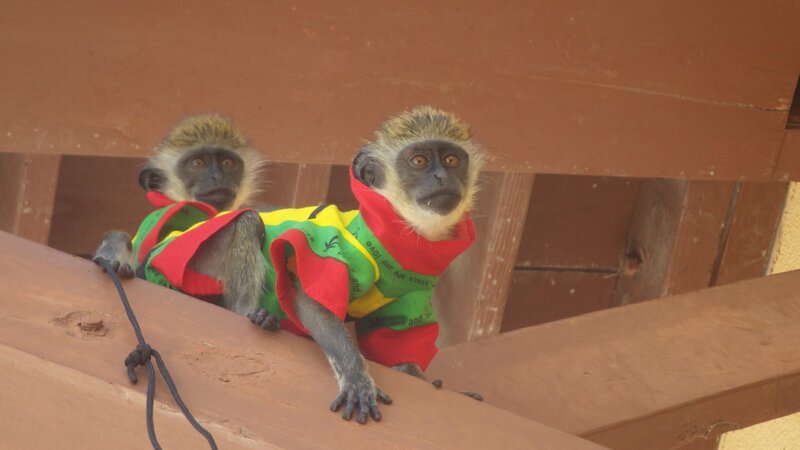 After seeing a bit of St. Kitts, we have sailed to the nearby island of Nevis. 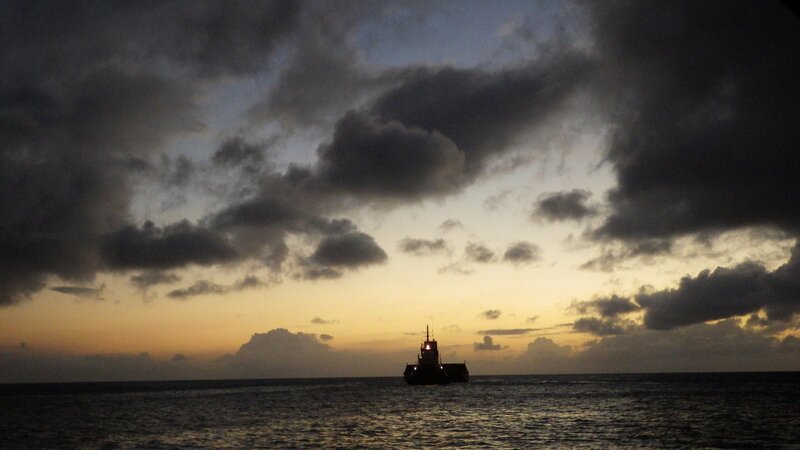 We picked up a mooring buoy at the Pinney's Beach, near Charlestown Harbour. 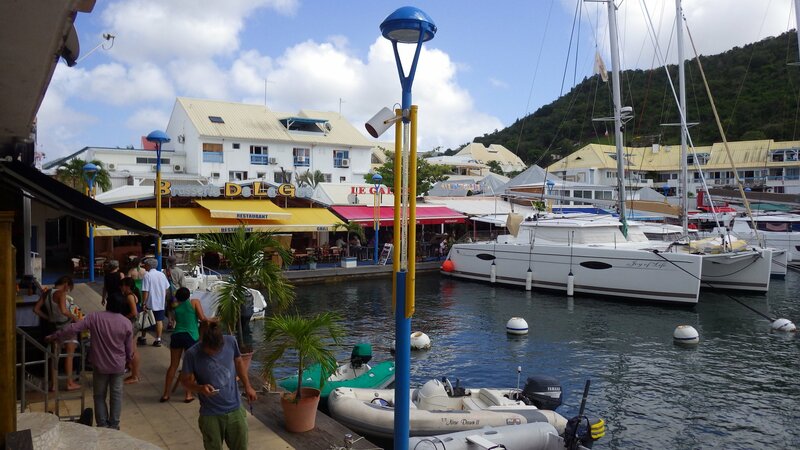 The Pinney's beach is lively, with several colourful restaurants and not too far dinghy ride to the Charlestown. 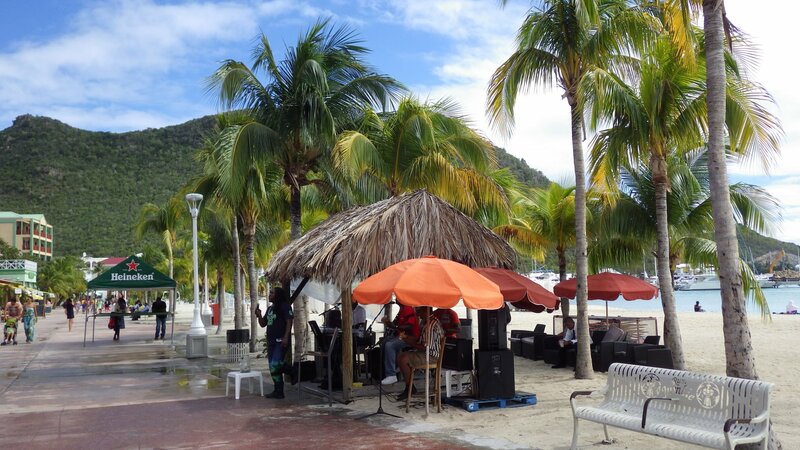 During the weekend, however, the beach turns into a VERY loud party where locals blast music through the entire night, from sunset to sunrise. 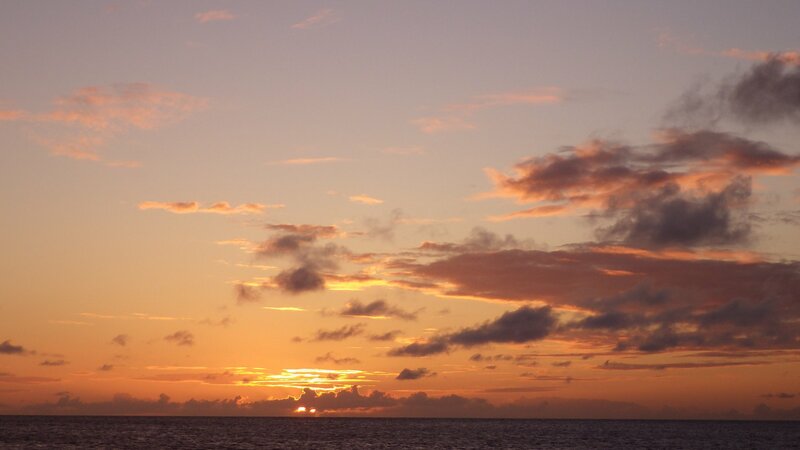 Could not sleep at all. 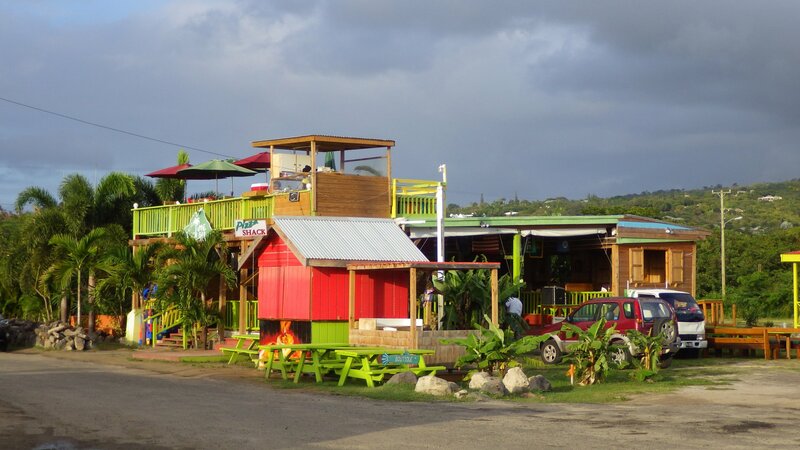 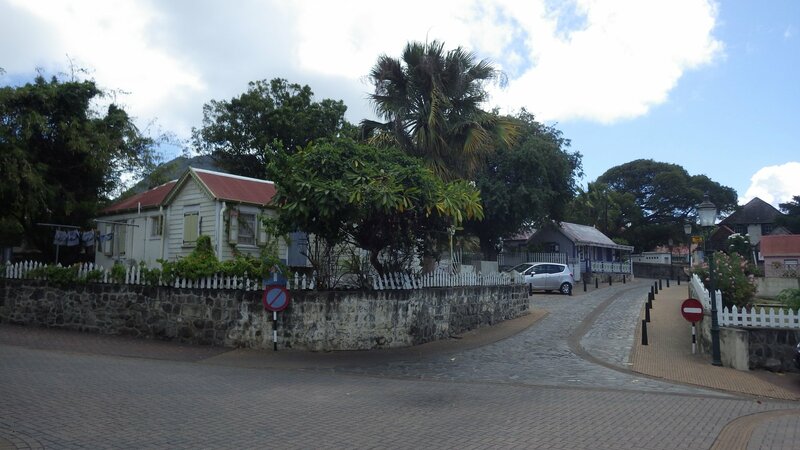 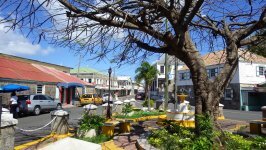 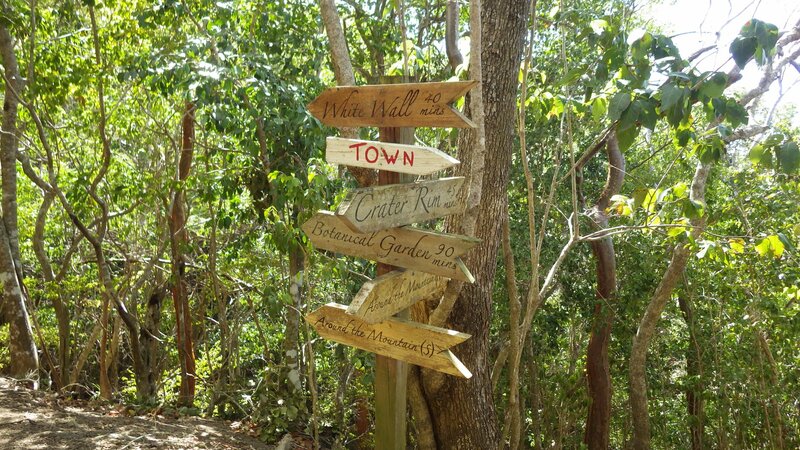 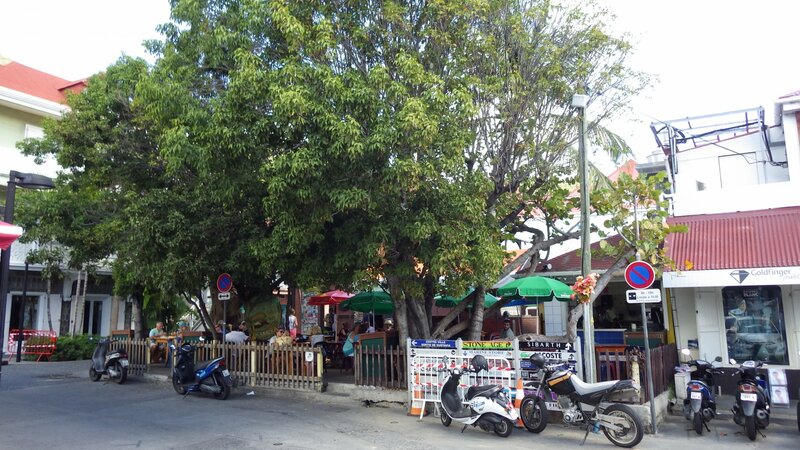 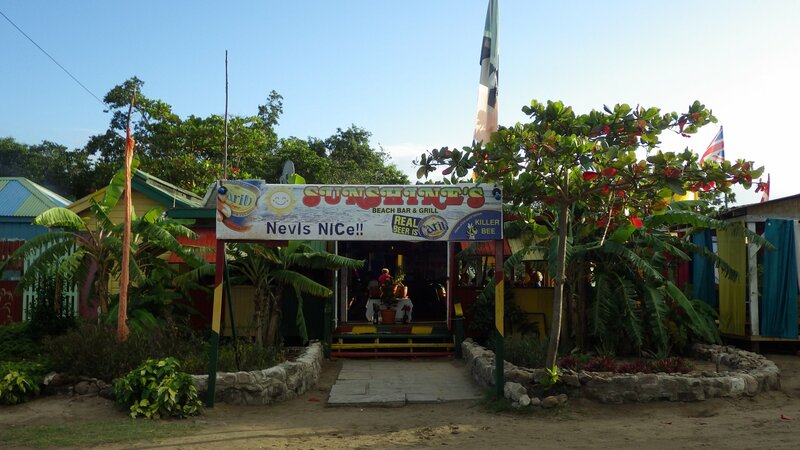 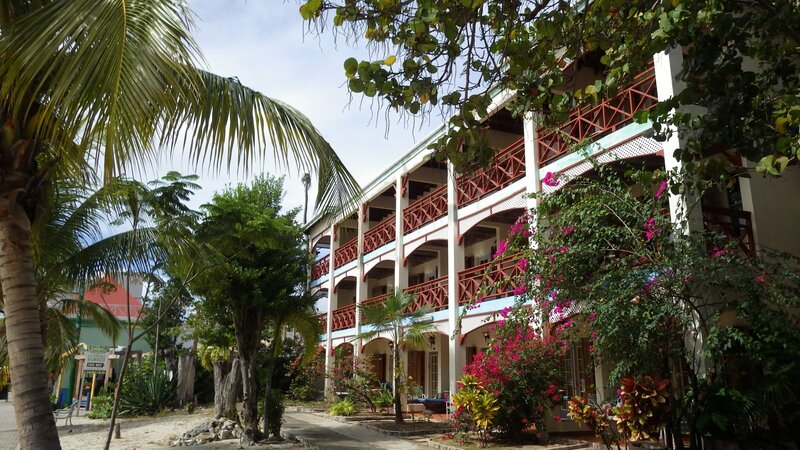 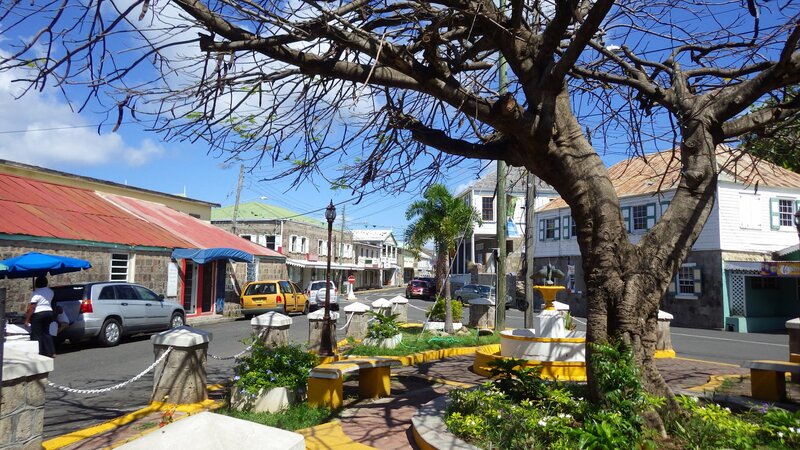 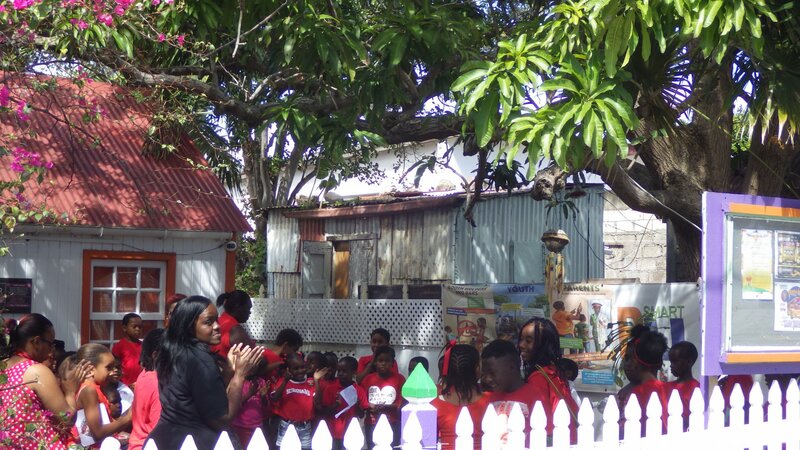 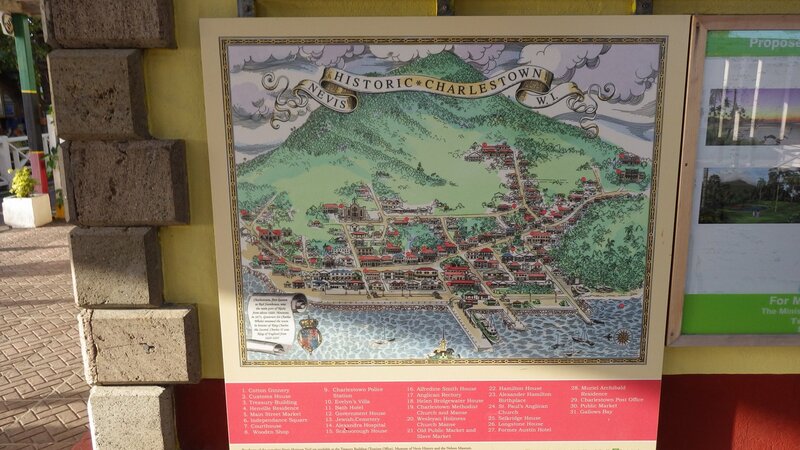 The town of Charlestown in Nevis is small, unassuming, relatively unspoiled by tourism, with friendly locals. 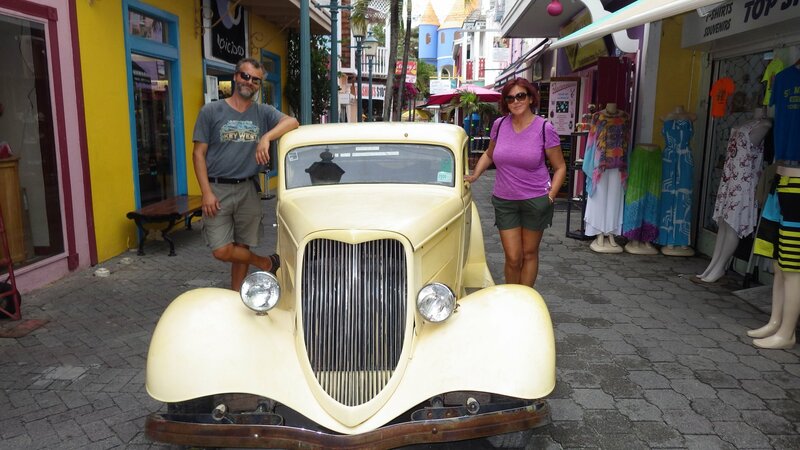 We picked up some groceries at reasonably well stocked supermarkets. 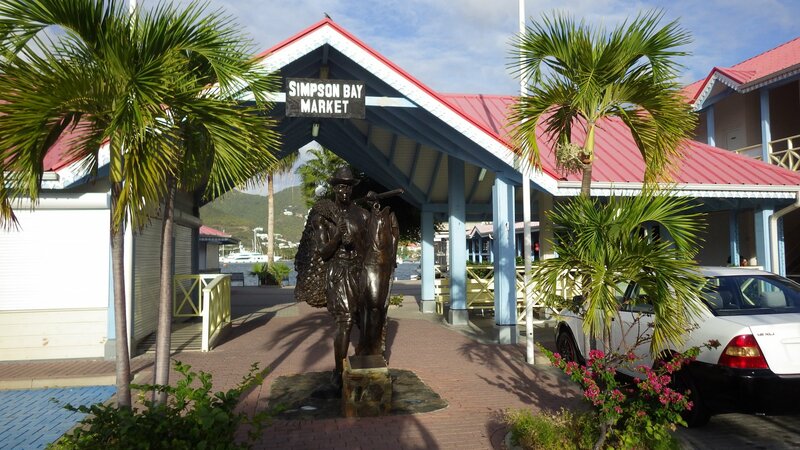 The fresh food market had a good variety of produce. 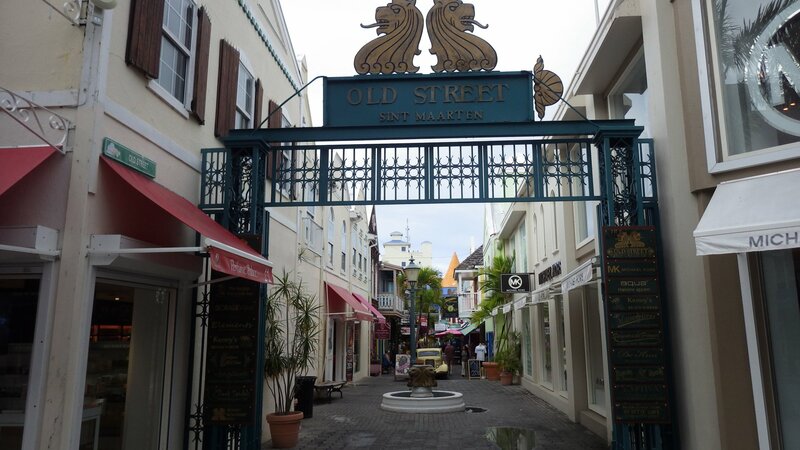 Walked around, made Skype calls via wi-fi, Larysa got her haircut. 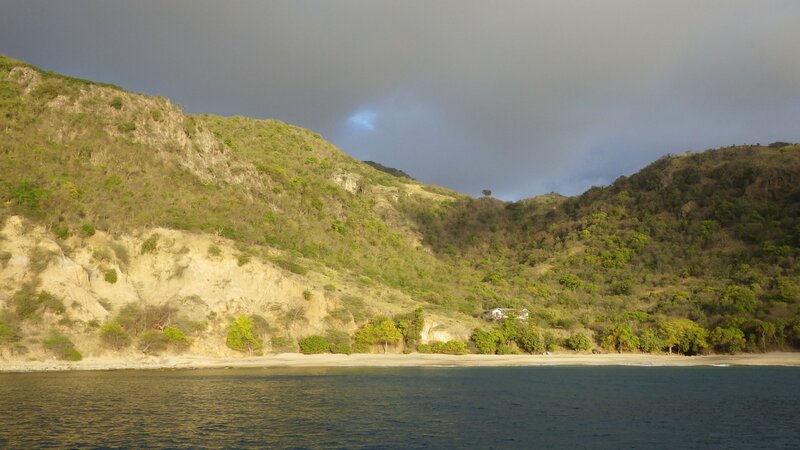 The cold front with strong northerly winds and waves was approaching, so we have sailed to the nearby Majors Bay on the southern coast of St. 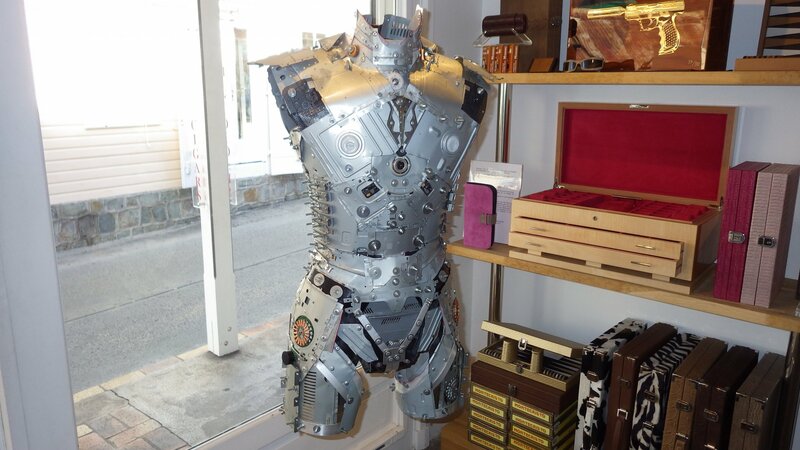 Kits for a suitable protection. 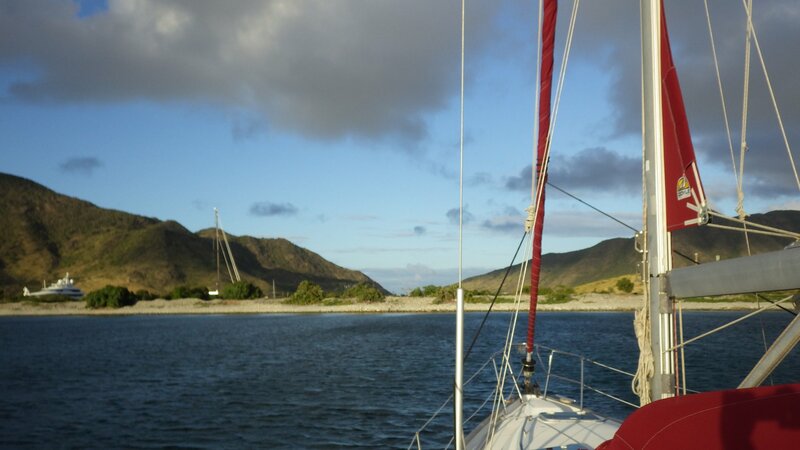 Provisioned, tucked in and anchor set well, we waited out the harsh weather. 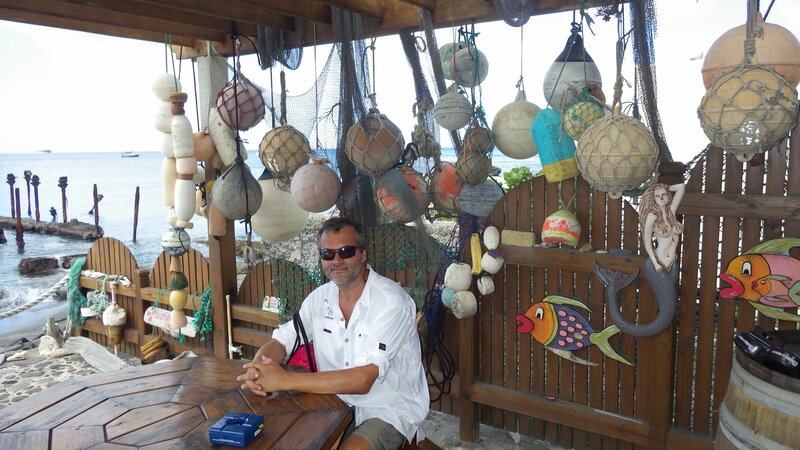 I had plenty of time to catch up on some boat projects, reading and planning future voyages. 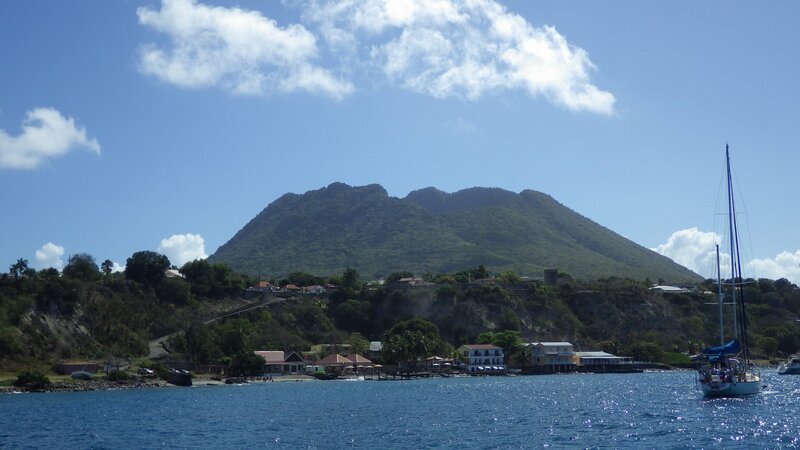 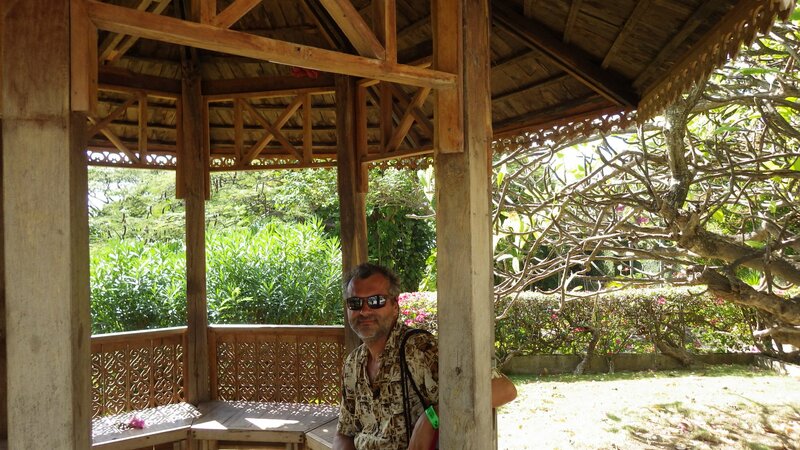 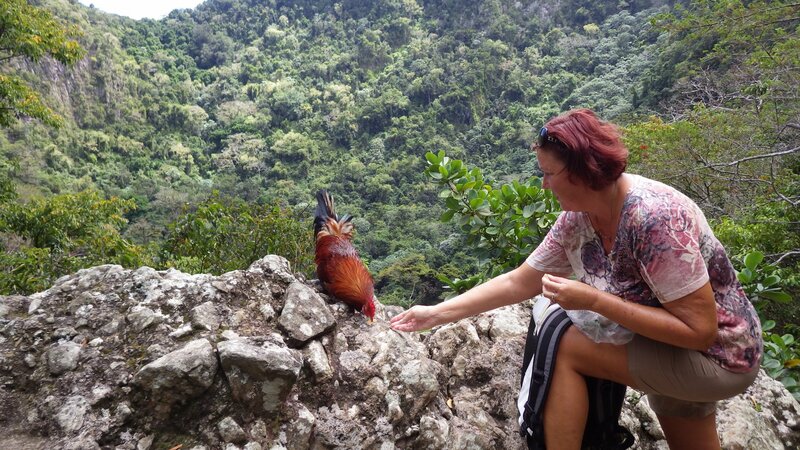 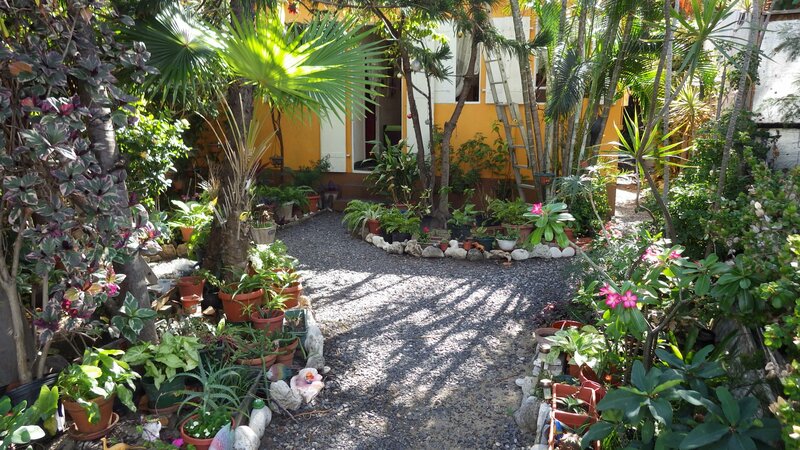 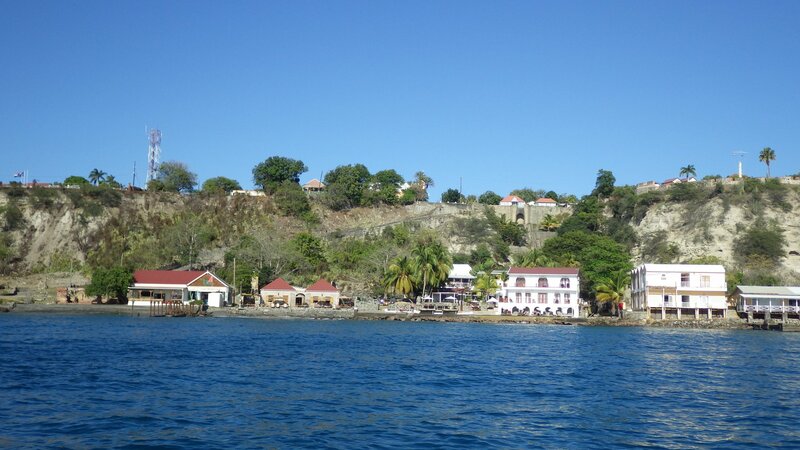 We stayed only one night at Montserrat, on our 2-day passage to Guadeloupe. 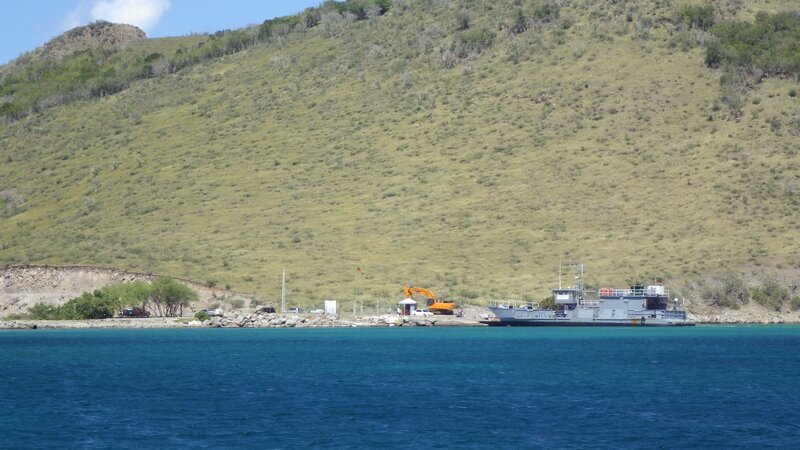 Did not go ashore. 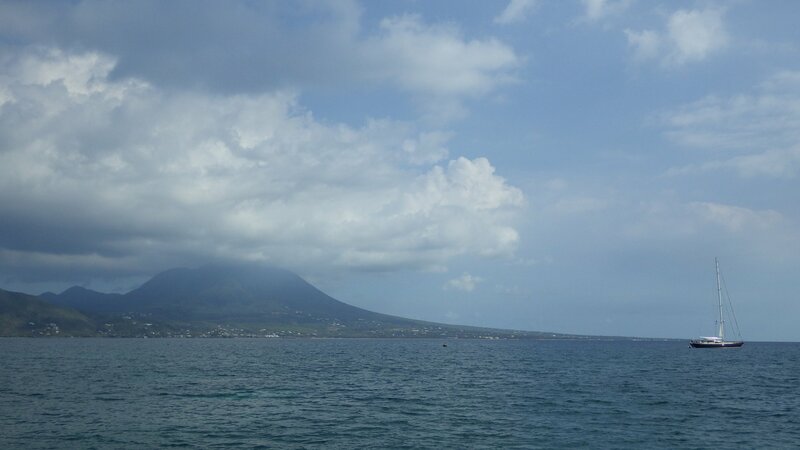 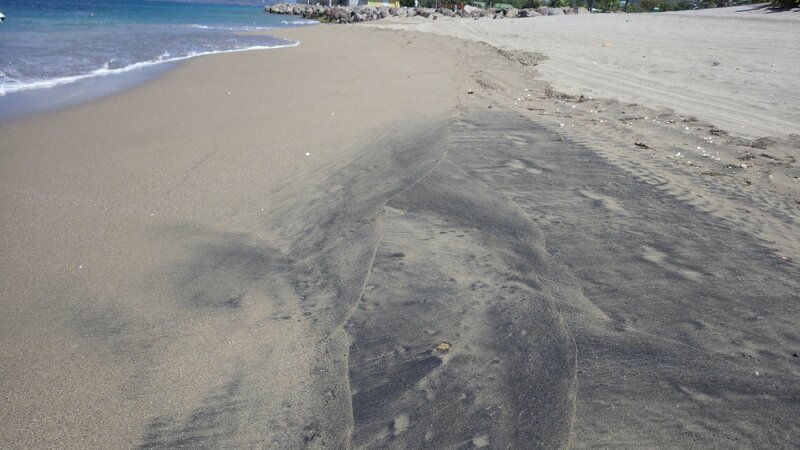 The volcanic eruption some years back had devastated the island, covering in ash its southern part and island's main town. Most of the island is how an exclusion zone and visiting is prohibited.